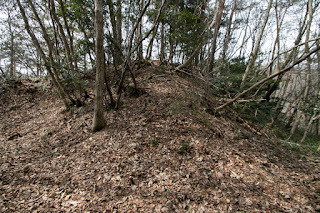 Hinoyama castle (日野山城、火野山城) spreads from hilltop to halfway of Hinoyama mountain, one of 300 meter height from hillside at Kitahiroshima town, the one about 20 kilometer north from Hiroshima city. 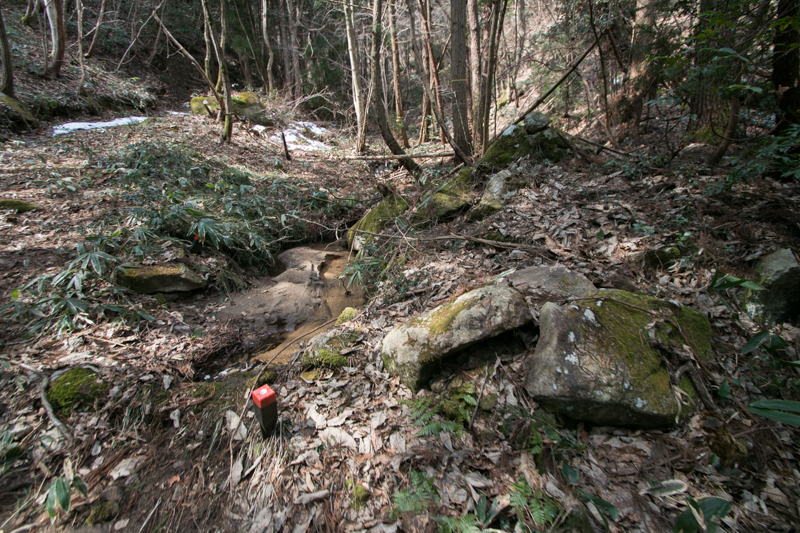 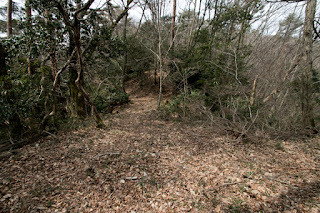 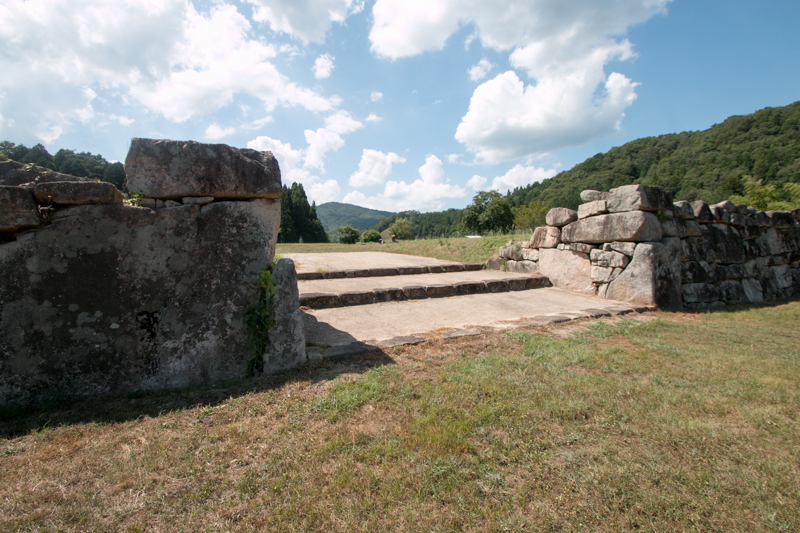 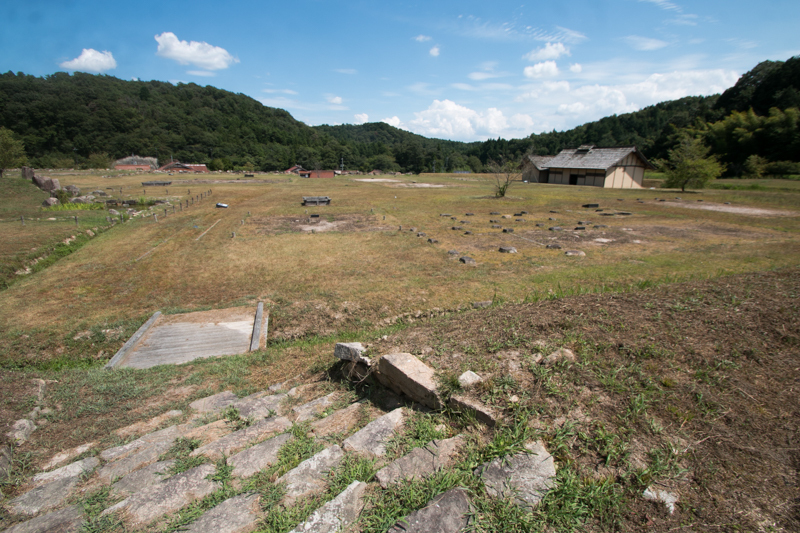 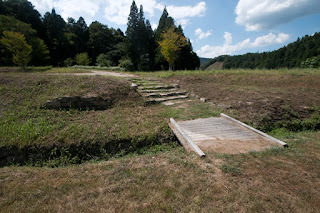 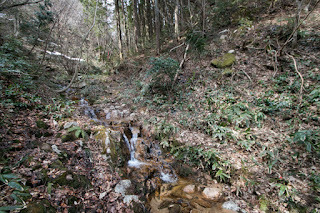 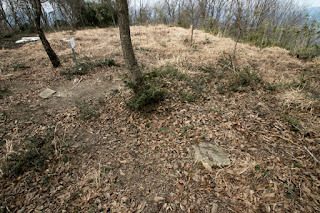 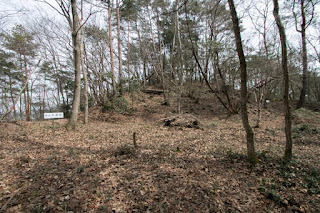 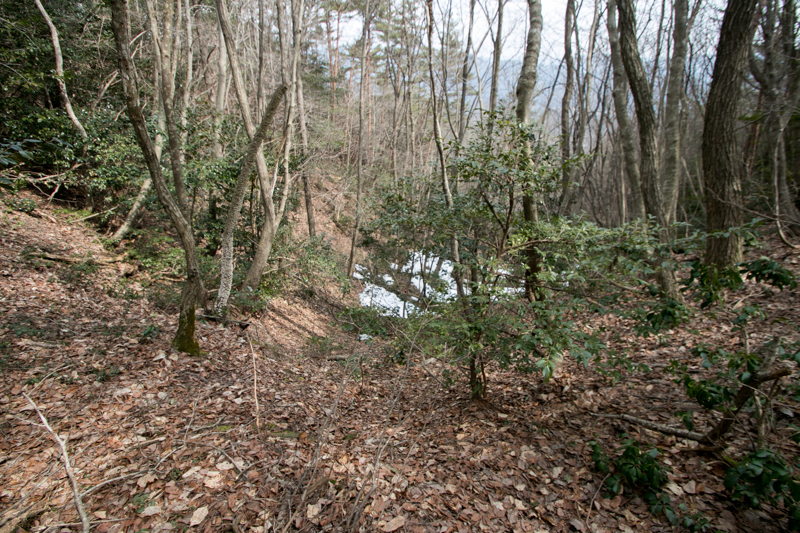 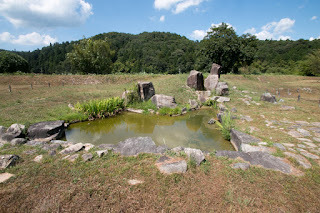 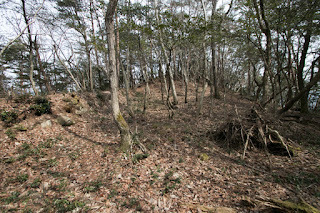 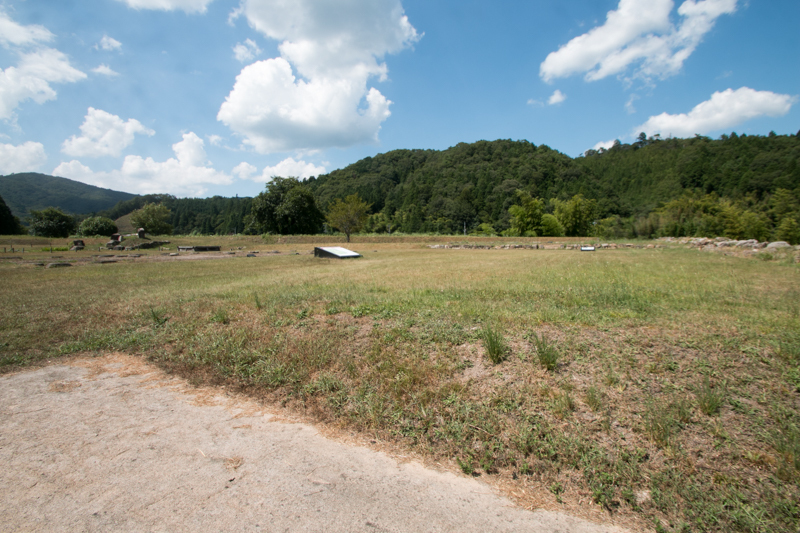 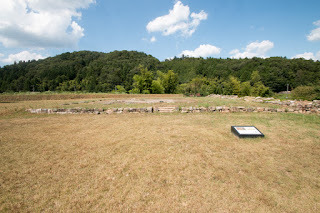 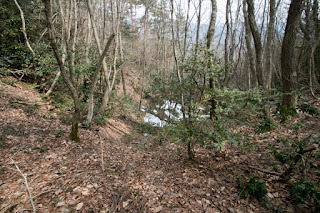 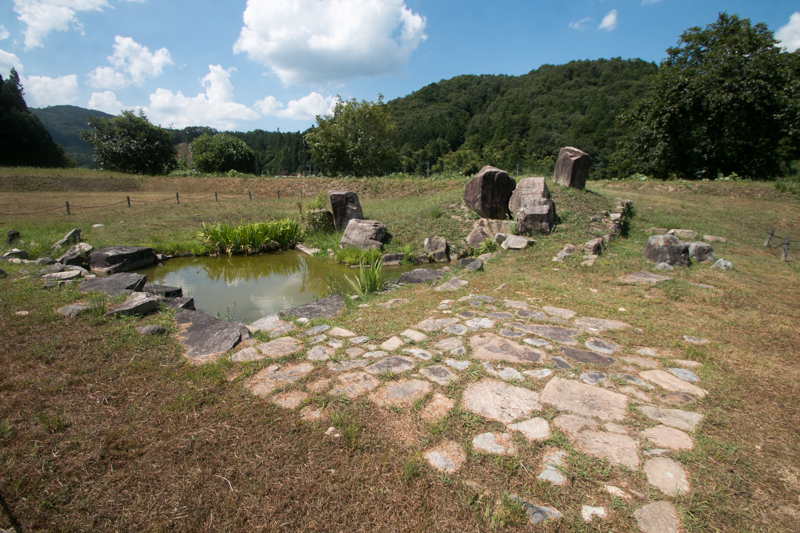 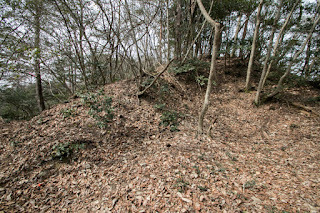 Castle site located near the source of Gonokawa river, a large river which roundly flows among Chugoku mountains through Aki-Takada city, Miyoshi city toward Sea of Japan. 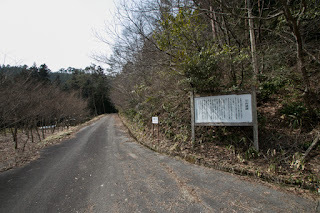 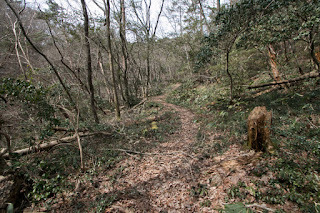 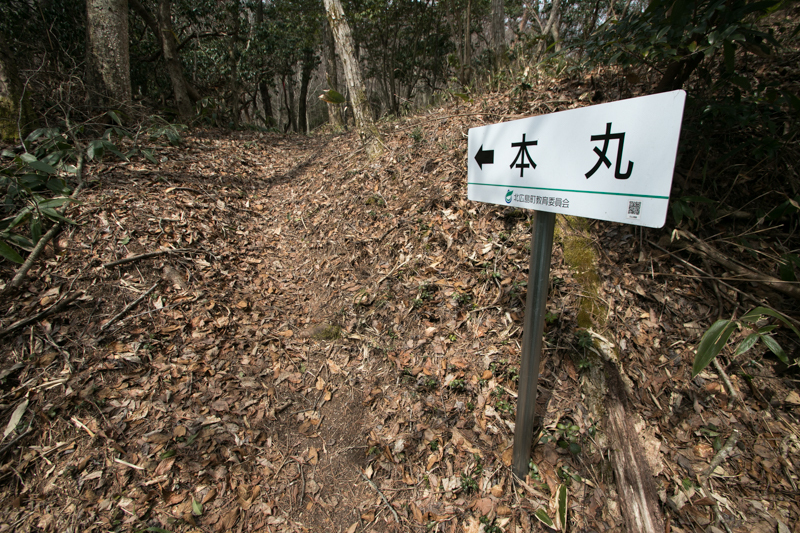 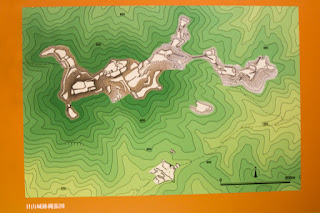 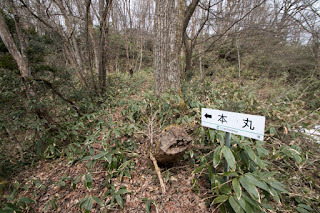 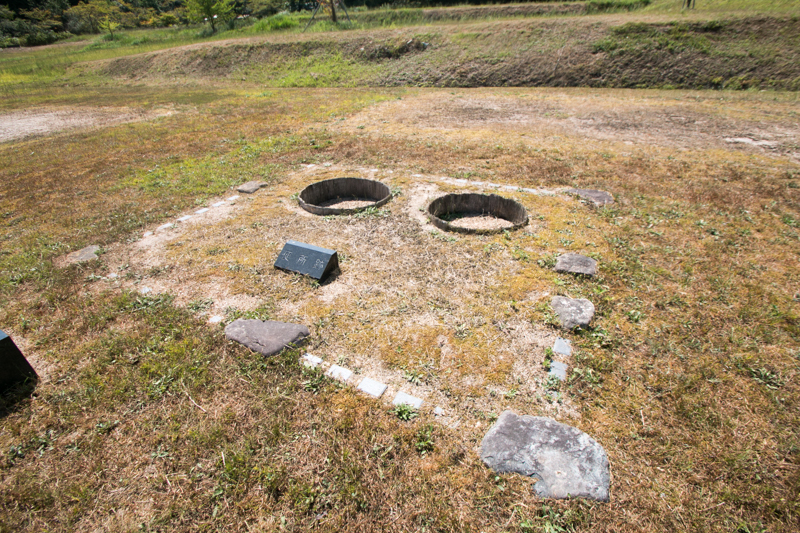 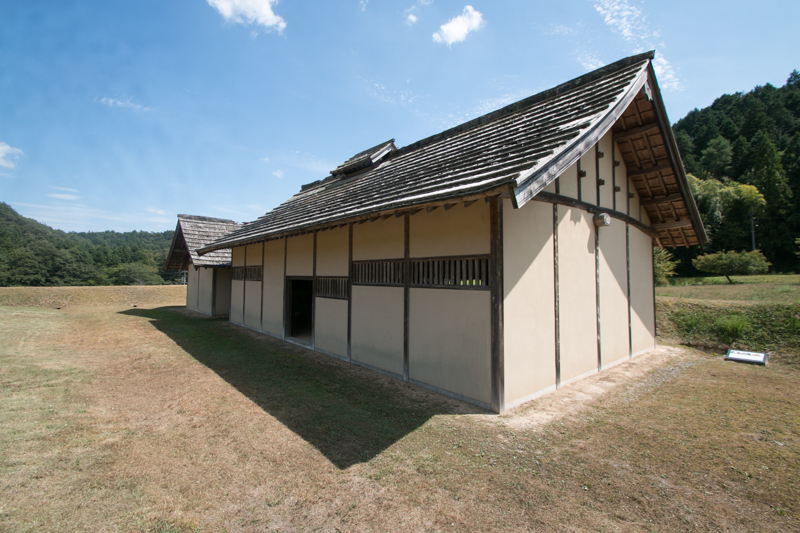 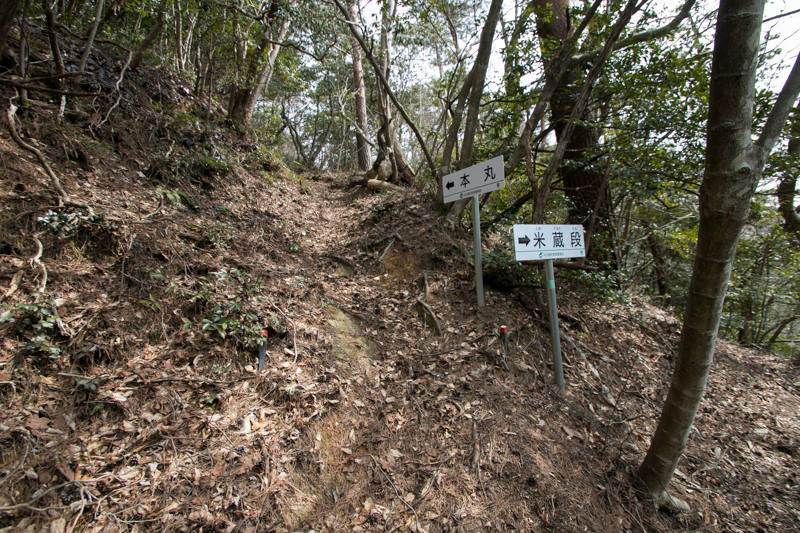 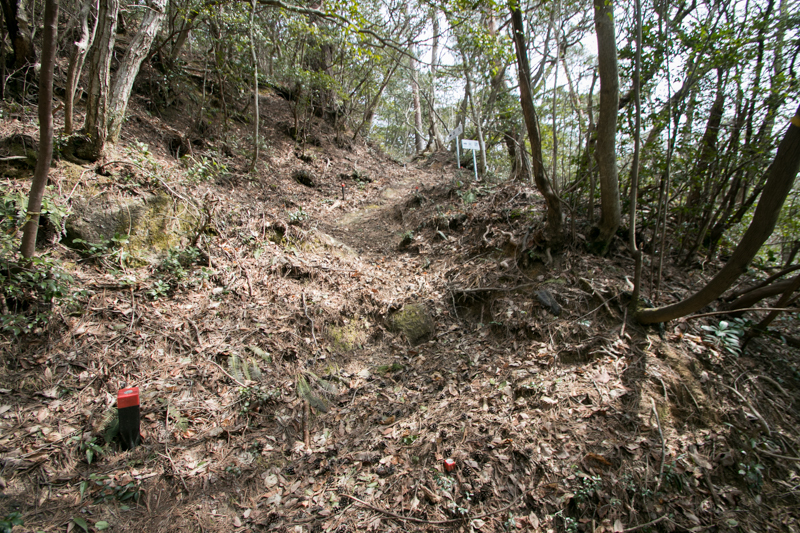 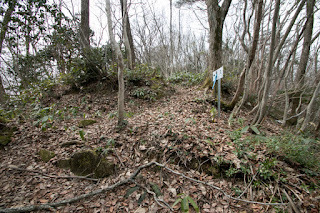 In addition to this, from castle site it is accessible to the western part of Shimane prefecture passing mountainous route via Onan town and Hamada city. 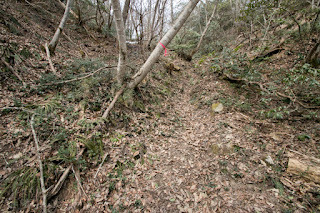 Eve now Hamada Highway connects Hiroshima city and Hamada city directly passes aside castle site. 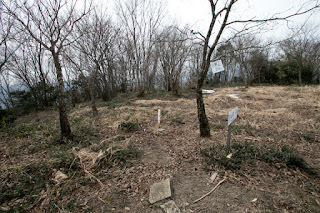 Because of these reasons, even though at mountainous area, this place is an important point of communication at the north of Aki province (Hiroshima prefecture), especially toward Sanin region. 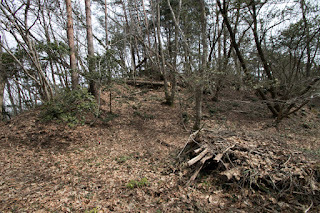 Hinoyama castle was built by Motoharu Kikkawa (1530-1586), the second son of Motonari Mouri (1497-1571) and the leader of Kikkawa clan as his main base in 1550. 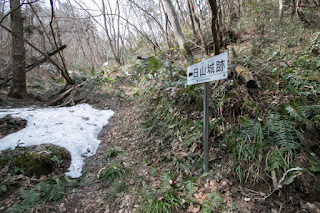 Kikkawa clan was originally a small retainer at Kikkawa area of Suruga province (Shizuoka prefecture), at the middle of current Shizuoka city central and former Shimizu city. Kikkawa clan came to a retainer of Kamakura Shogunate, and became famous to ruin Kagetoki Kajiwara (1140-1200), who wielded power under Yoritomo Minamoto (1147-1199), the founder of Kamakura Shogunate, but lost in the political conflict after the death of Yoritomo then tried to escape to Kyoto city and passed his territory. 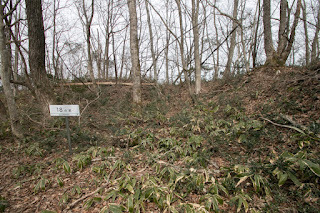 It is said that this was not an accident but was intended by Hojo clan, the house of minister of Kamakura Shogunate and expelled Kagetoki Kajiwara from Kamakura Shogunate. Kikkawa clan also activated at the battle of Jokyu occurred in 1221, then Kikkawa clan achieved their territory at current Kitahiroshima town. 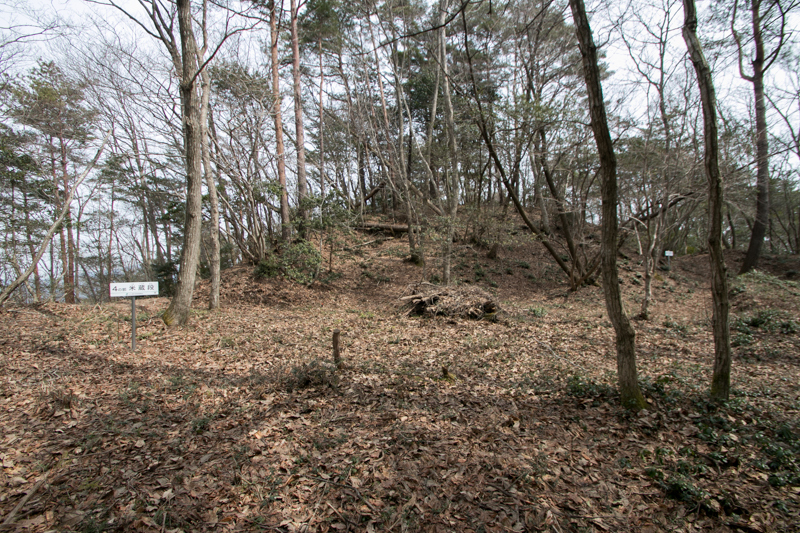 Later Kikkawa clan moved to their territory in the beginning of 14th century to avoid the confusion of central area and local lord of the area. 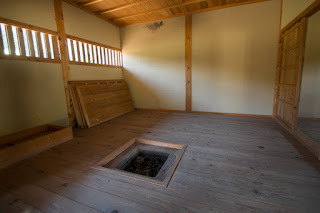 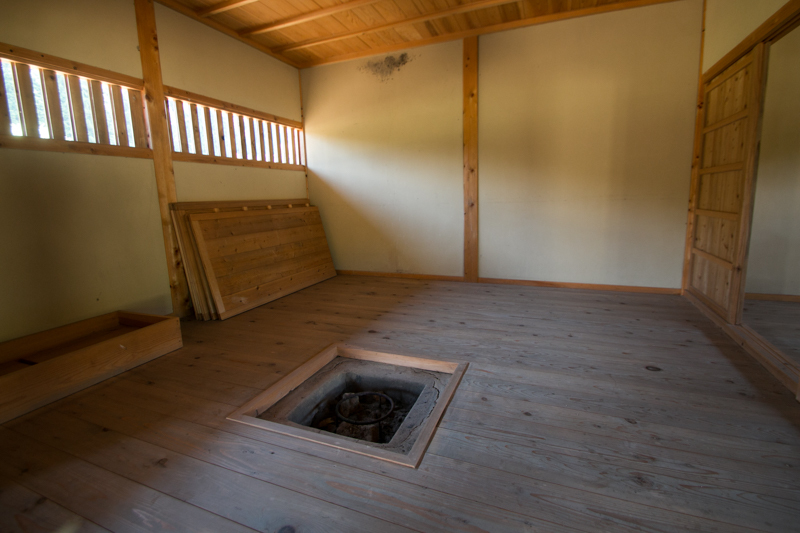 Kikkawa clan at first used Surugamaru castle, a small castle at the north of Hinoyama castle as their main base. 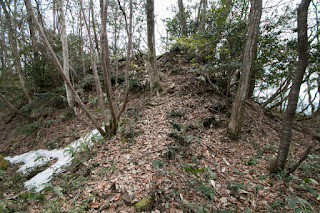 Later they built Ogurayama castle, a larger one at higher place around the end of 14th century and used it about 150 years. 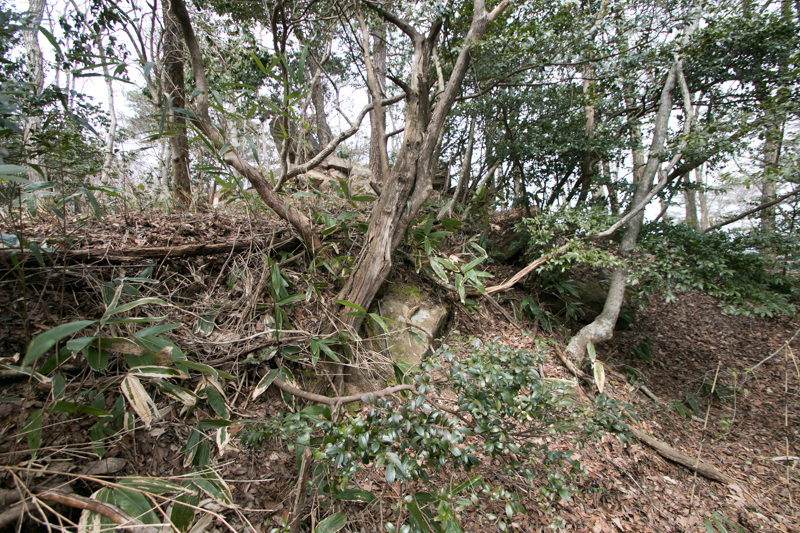 Kikkawa clan built their branch family at Iwami province (western part of Shimane prefecture) at the next of their province, and gradually grew their power. 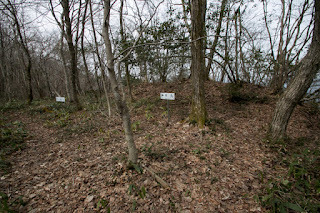 Especially Tsunemoto Kikkawa (1428-1520) was the brave leader who fought at various place and also was familiar with literature, significantly increased the name and power of Kikkawa clan. 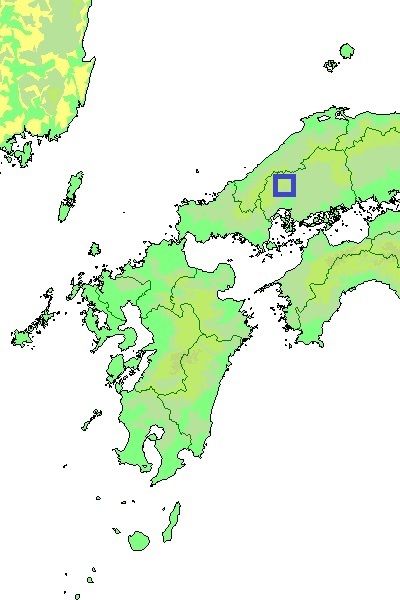 But since the end of 15th century, because of their geographical condition, Kikkawa clan was involved two strong powers of Chugoku region, the one is Ouchi clan which was the wealth governor of Suo province and Nagato province (Yamaguchi prefecture), and another is Amago clan rose up to the warlord of Izumo province (Shimane prefecture) by their intelligence and military power. 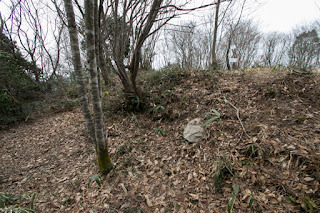 Ouchi clan indirectly managed major part of Aki province, but Tsunehisa Amago (1458-1541), the powerful leader of Amago clan was son-in-law of Tsunemoto Kikkawa. 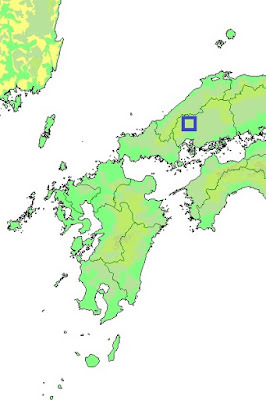 At first Kikkawa clan belonged to Ouchi clan then Kunitsune Kikkawa (1443-1531), the son of Tsunemoto, changed to Amago clan. 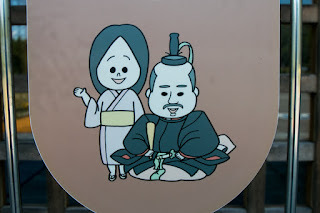 Kunitsune also let his daughter Myokyu (1499-1546) marry with Motonari Mouri who was the lord of Aki Koriyama castle (Hiroshima prefecture). 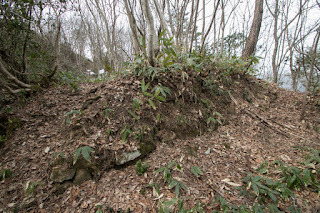 Situation of Kikkawa clan seemed stable but later an alliance of Ouchi clan and Mouri clan became to fiercely conflict with Amago clan. 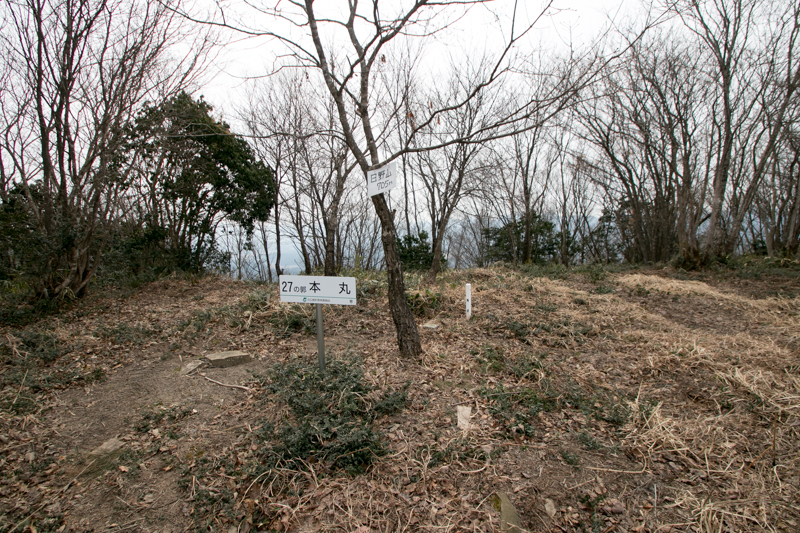 The leaders of Kikkawa clan could not decide their side and got the angry of both side. 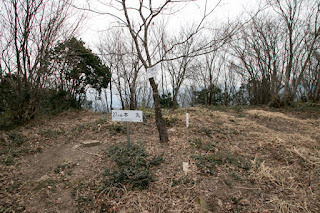 In such situation, retainers of Kikkawa clan decided to support Mouri clan and asked to adopt Motoharu Kikkawa as the successor of Mouri clan. 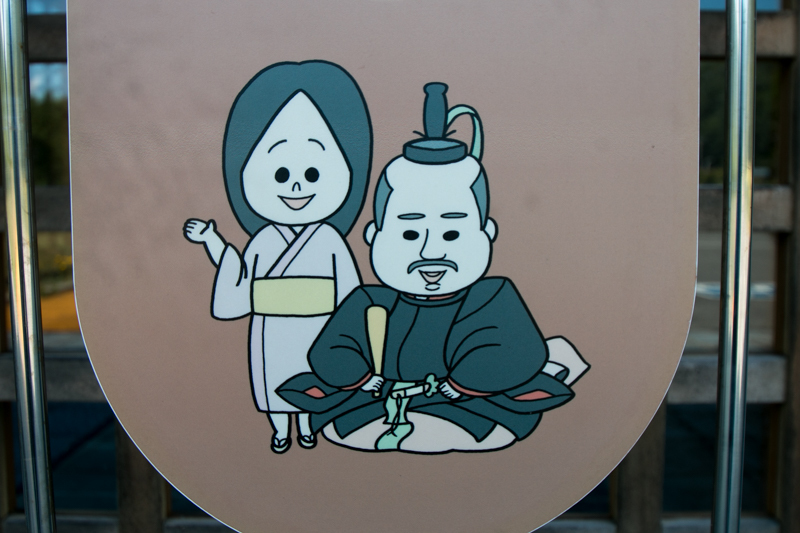 They forced Okitsune Kikkawa (1518-1550) to retire, and received Motoharu as a leader. 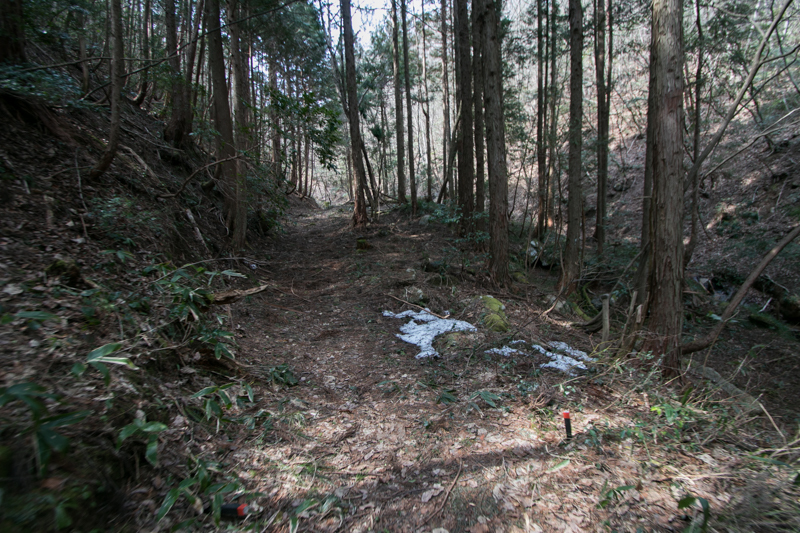 Soon Motonari purged Okitsune Kikkawa and his son to secure Motoharu, then Motoharu formally became the leader of Kikkawa clan. 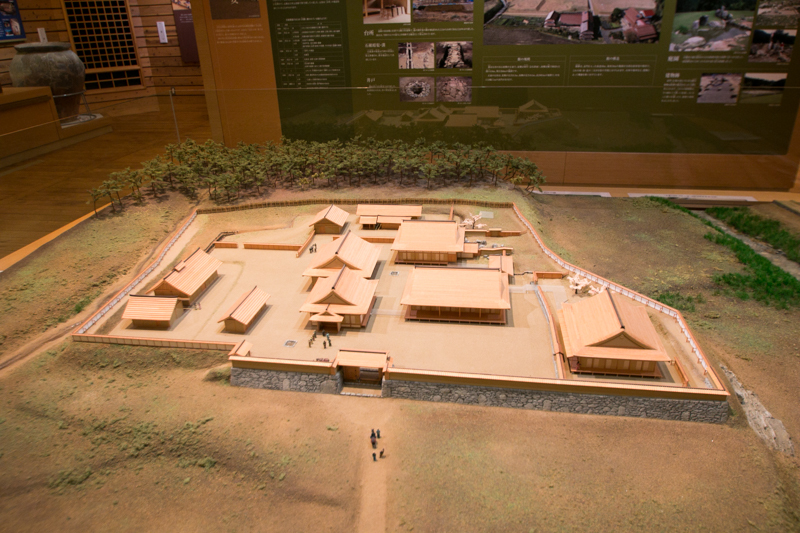 To show the change of the clan and prepare for the battle with Amago clan, Motoharu built Hinoyama castle as a secure fortress at much higher mountain. 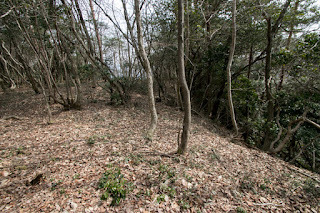 Hinoyama castle spreads along with a long ridge of 800 meter long downs toward east from hilltop. Roughly Hinoyama castle is divided into upper part and lower part, which consist of three layers and one layer respectively. 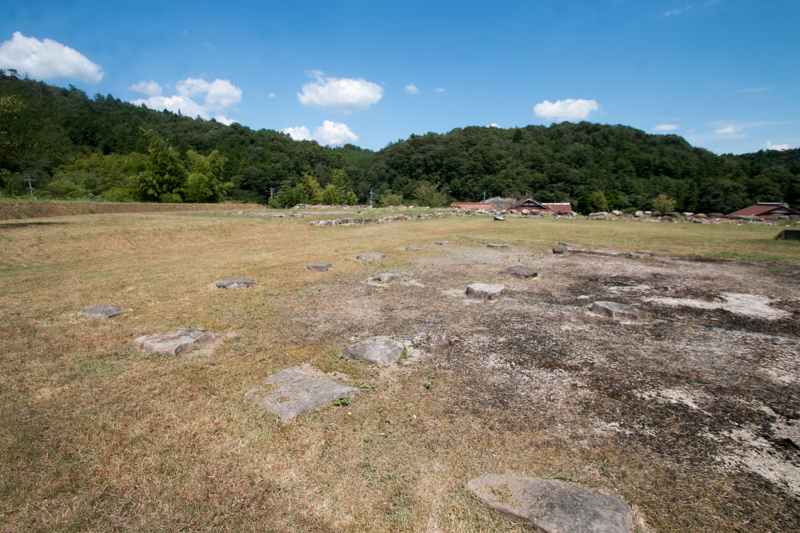 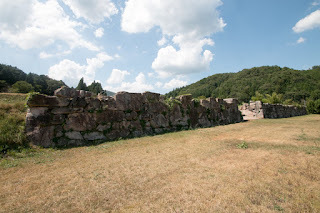 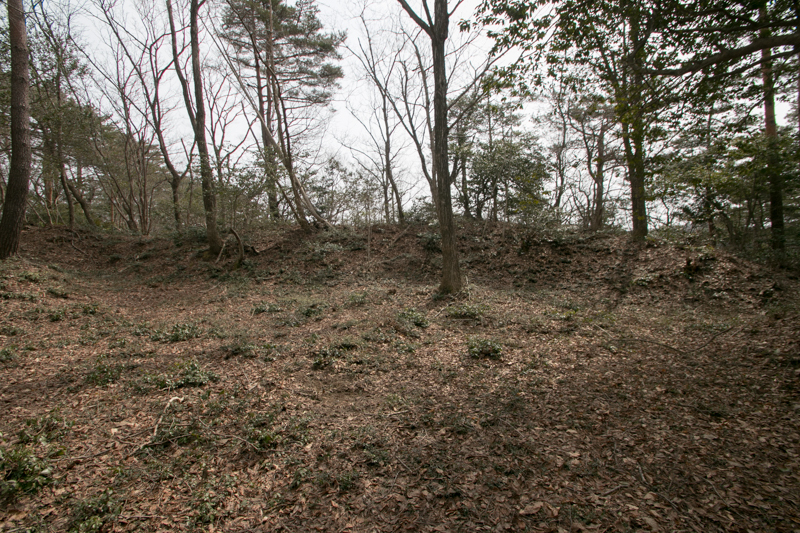 The top layer is central area which is a rectangle of 80 meter long and 30 meter wide separated into four compartment, with several terraces at north ridge which was the backside gate of the castle. 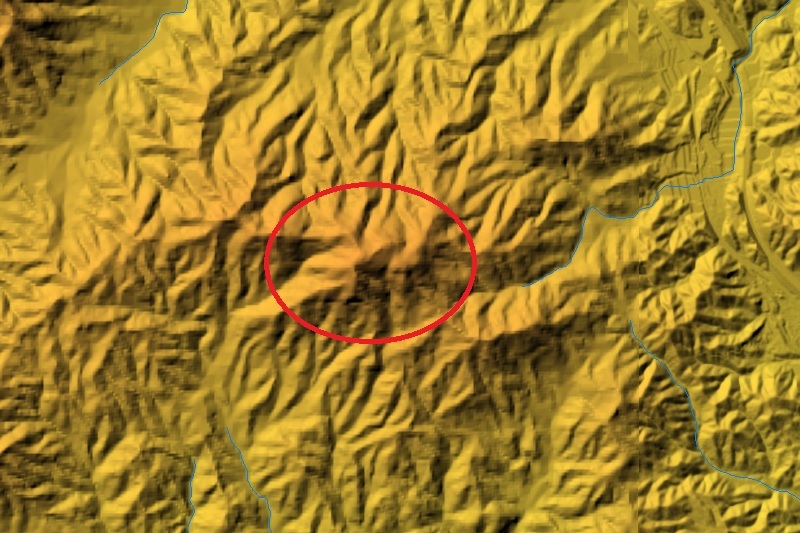 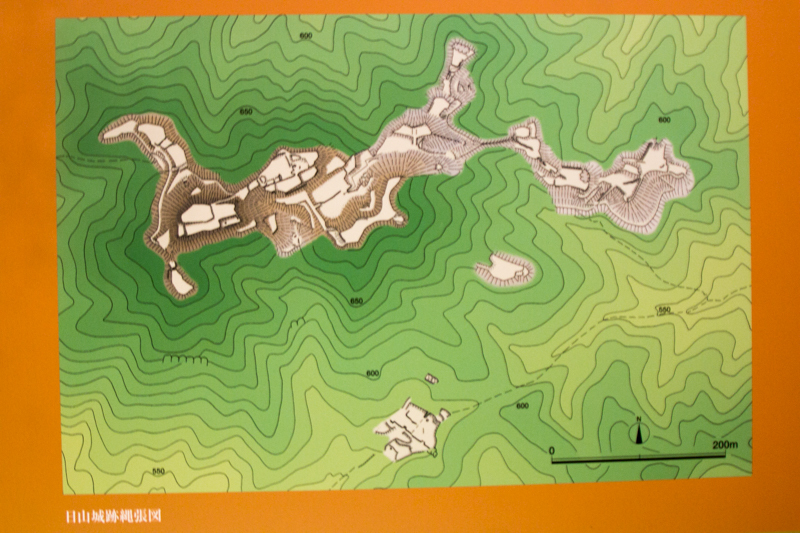 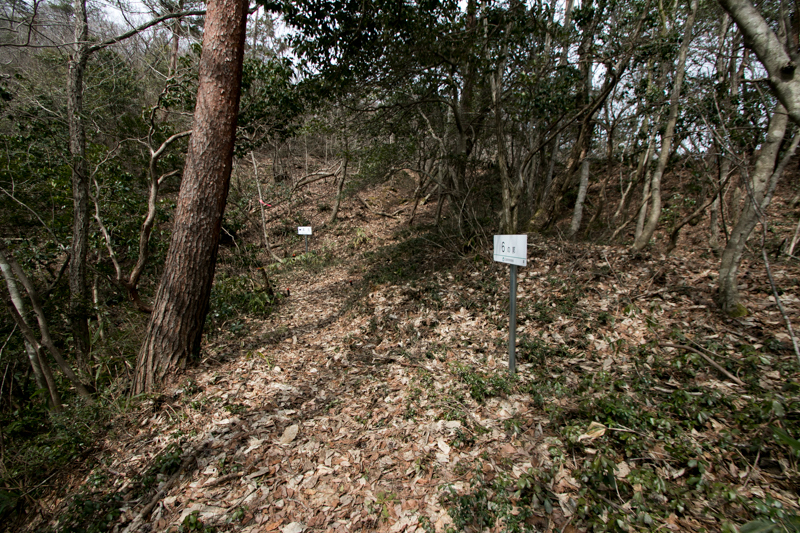 The second layer mainly consists of Nakanomaru, Shitanomaru and Ninomaru area spreads like U letter. 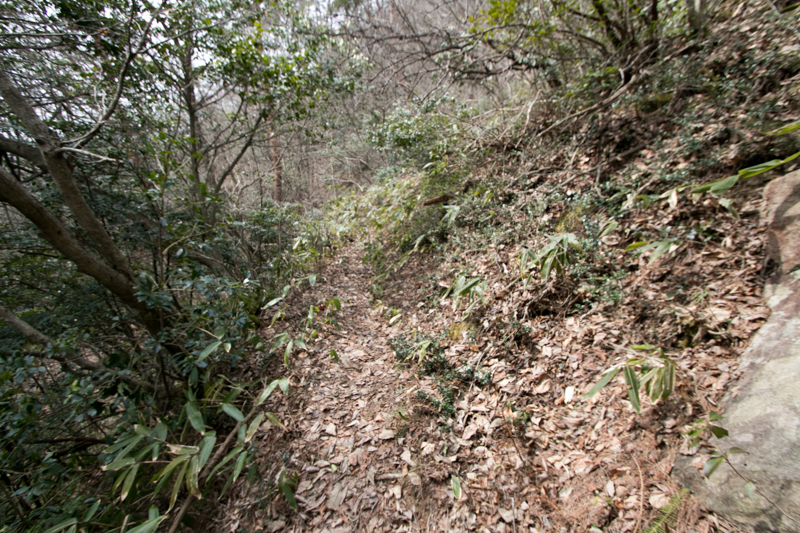 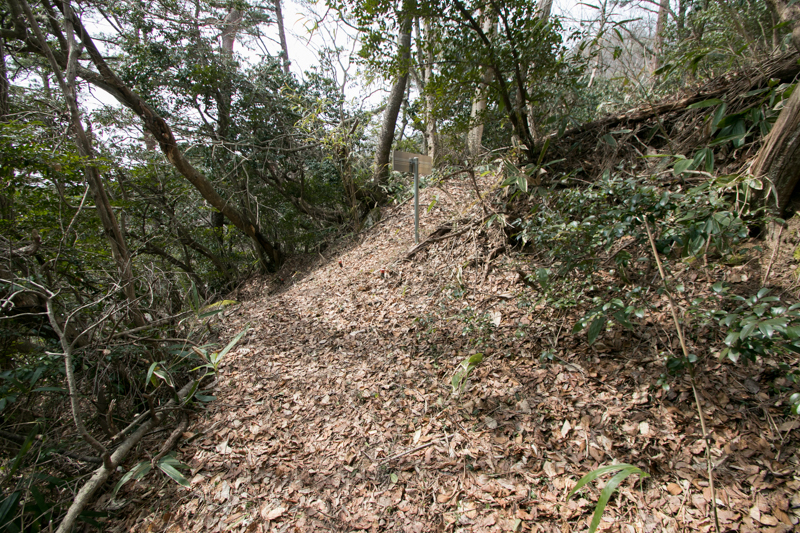 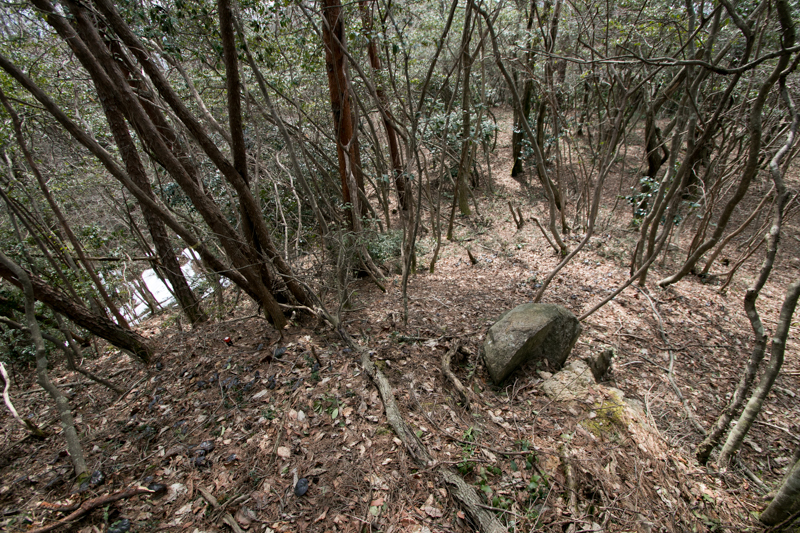 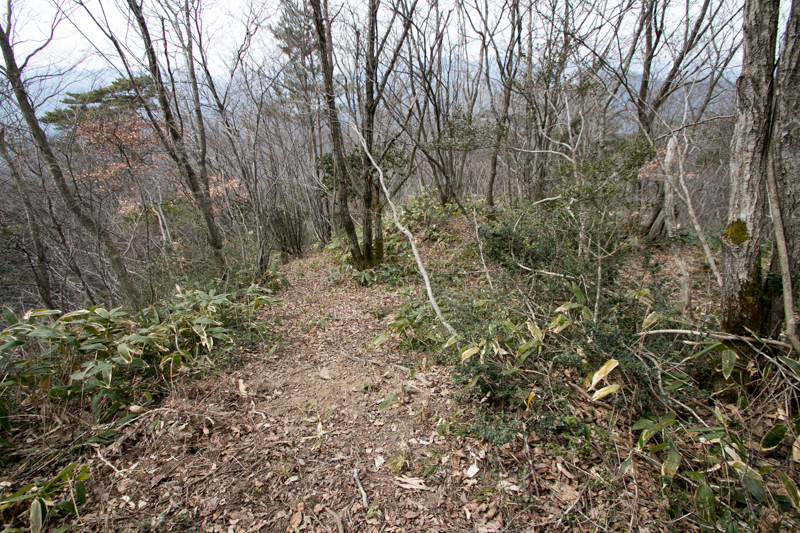 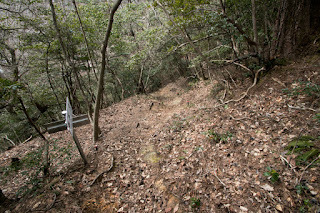 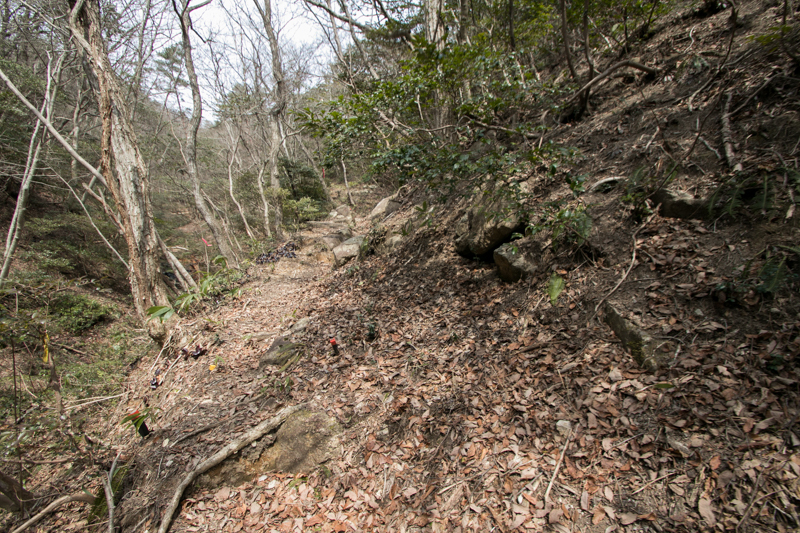 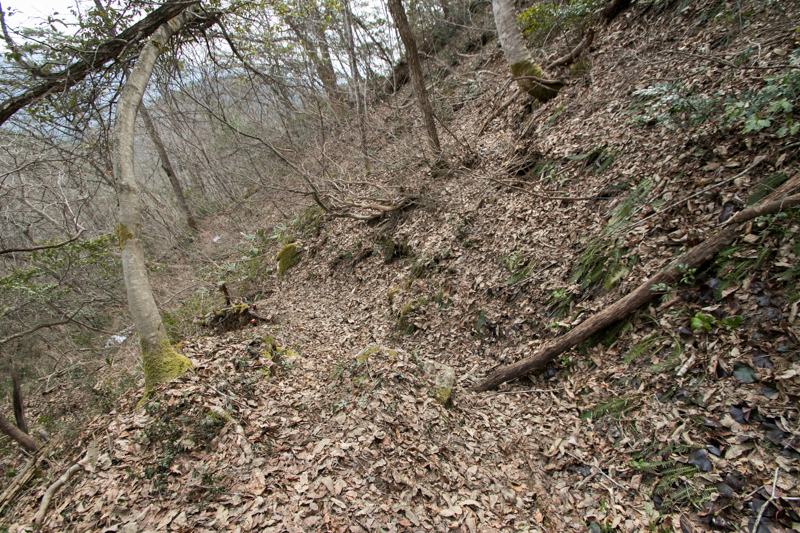 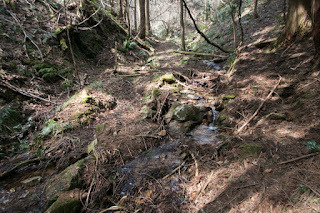 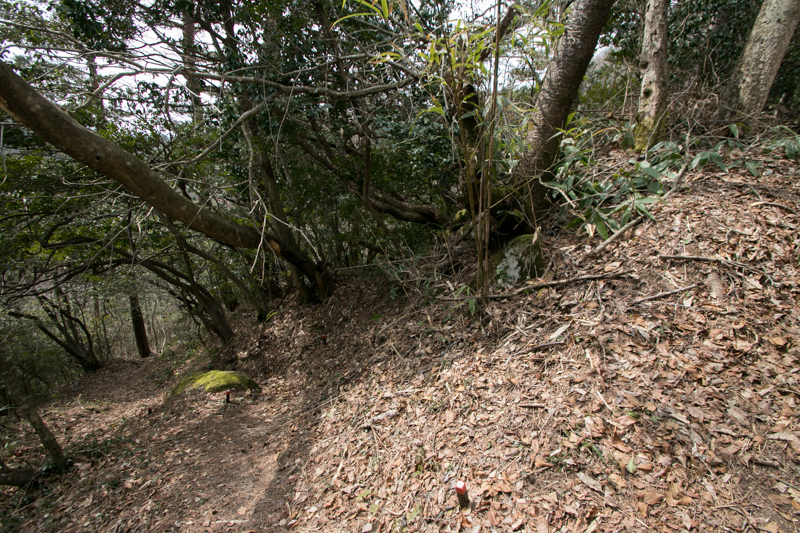 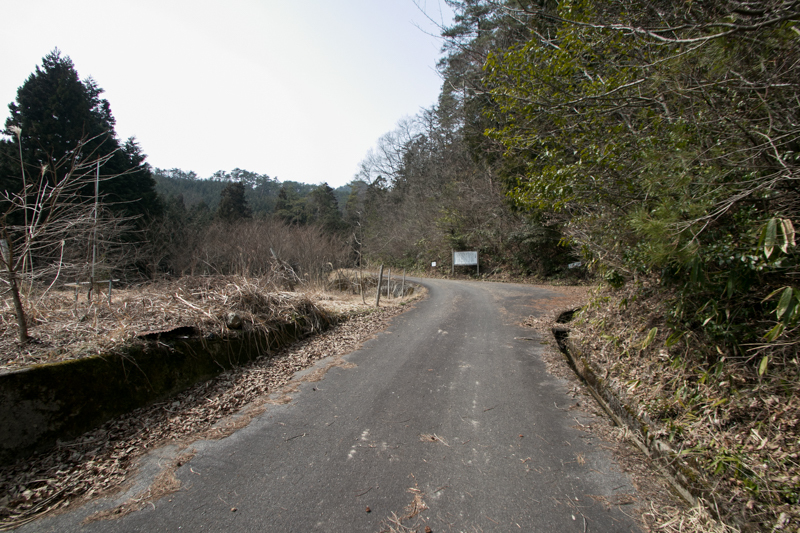 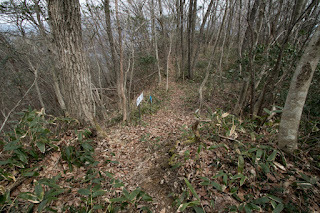 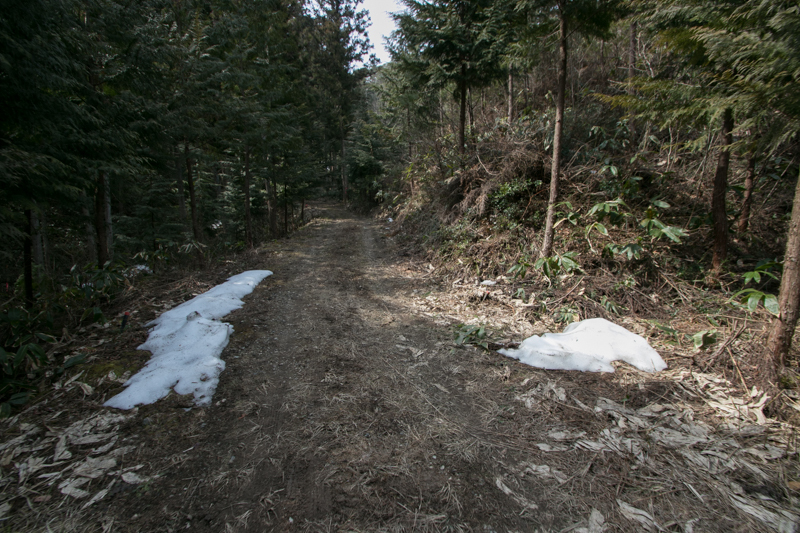 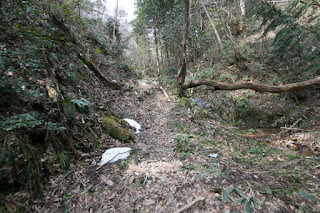 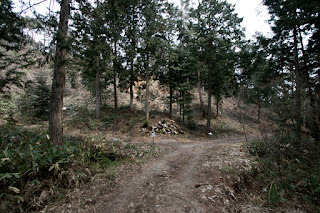 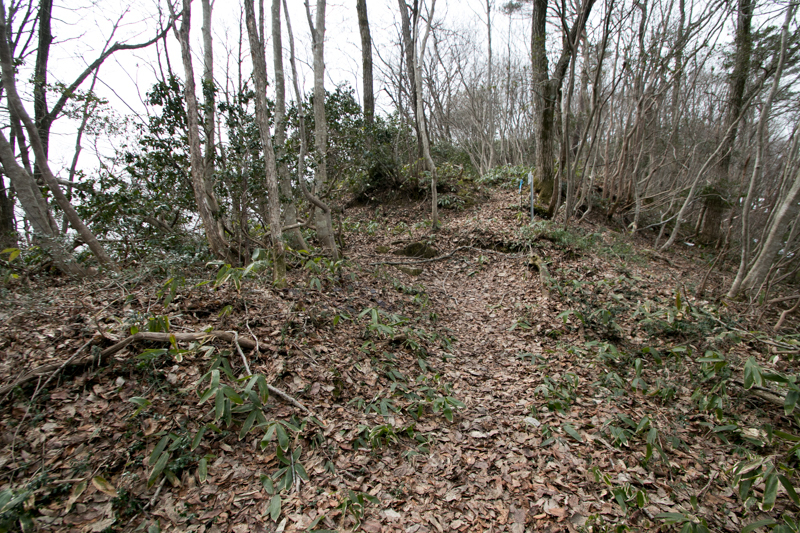 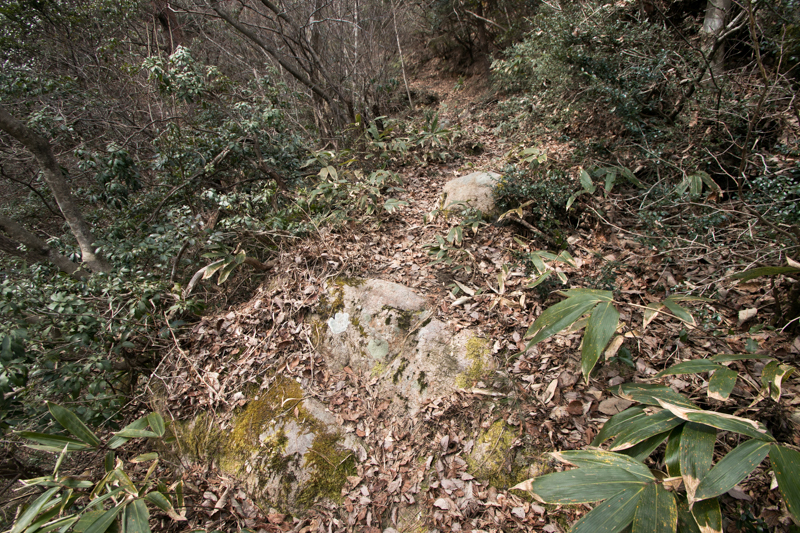 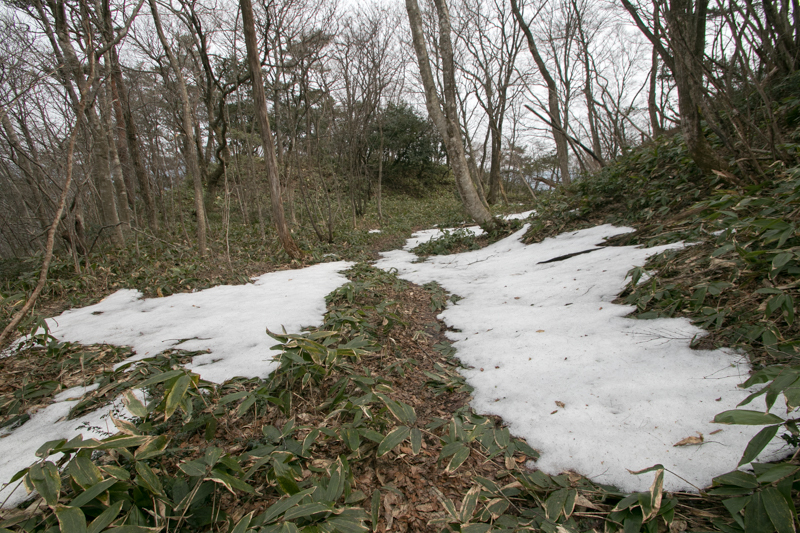 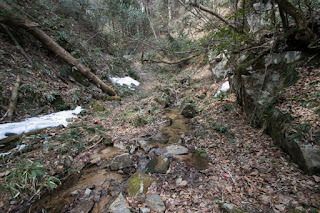 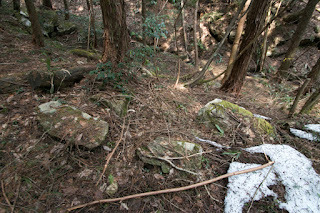 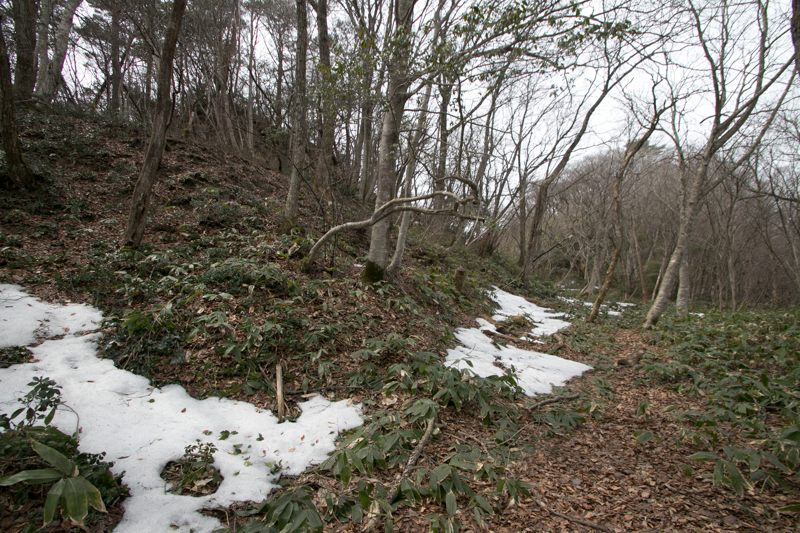 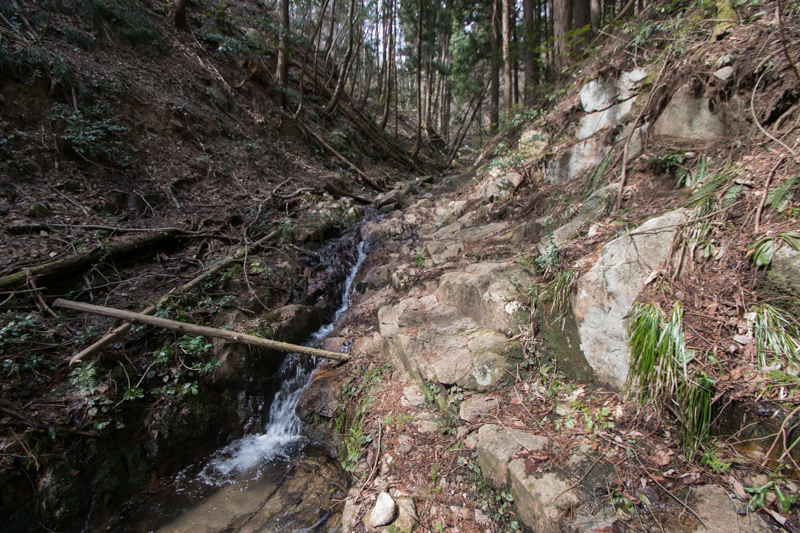 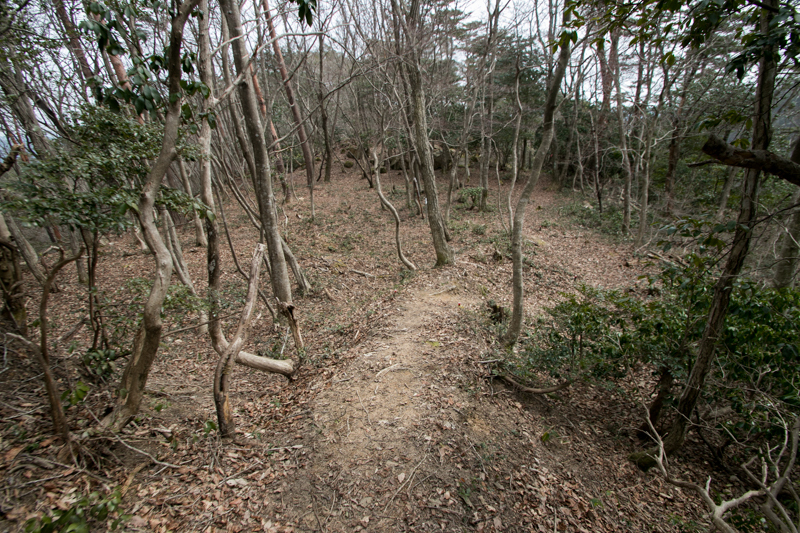 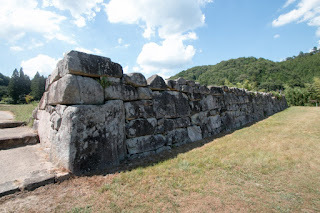 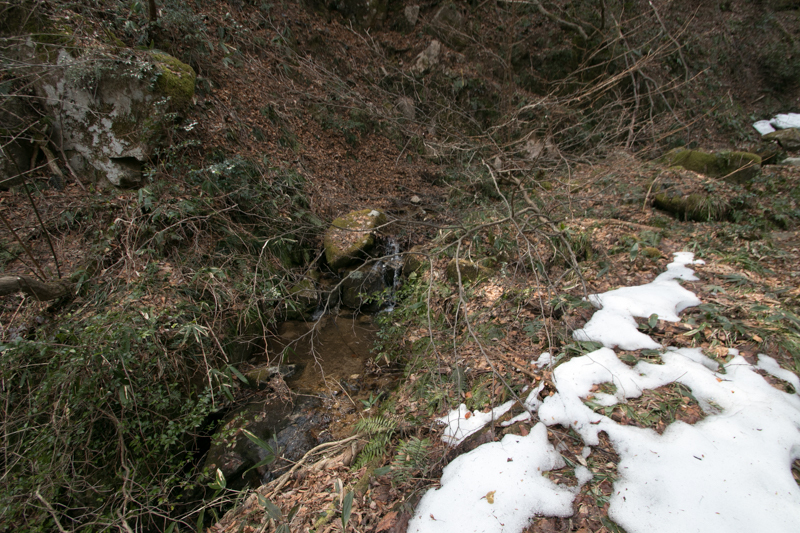 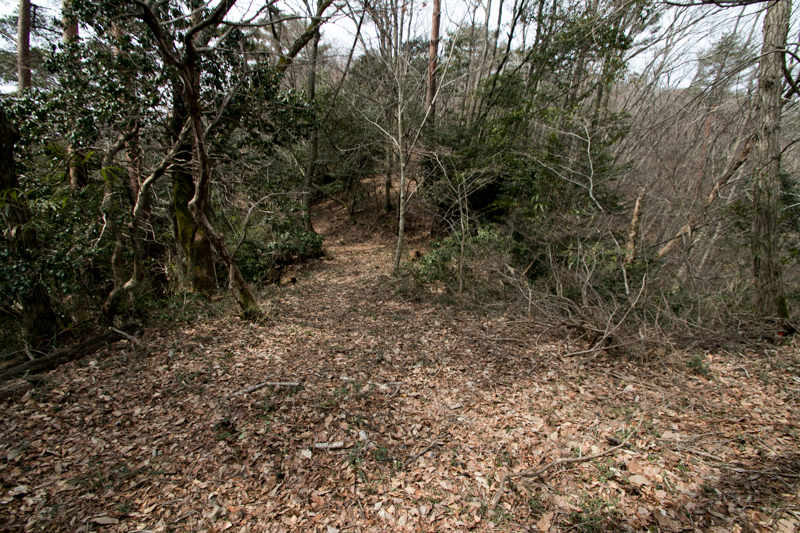 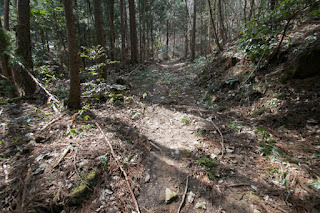 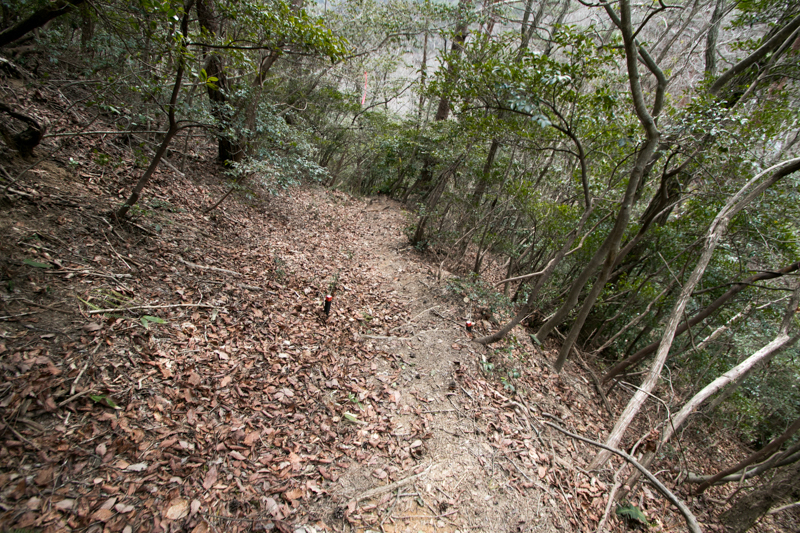 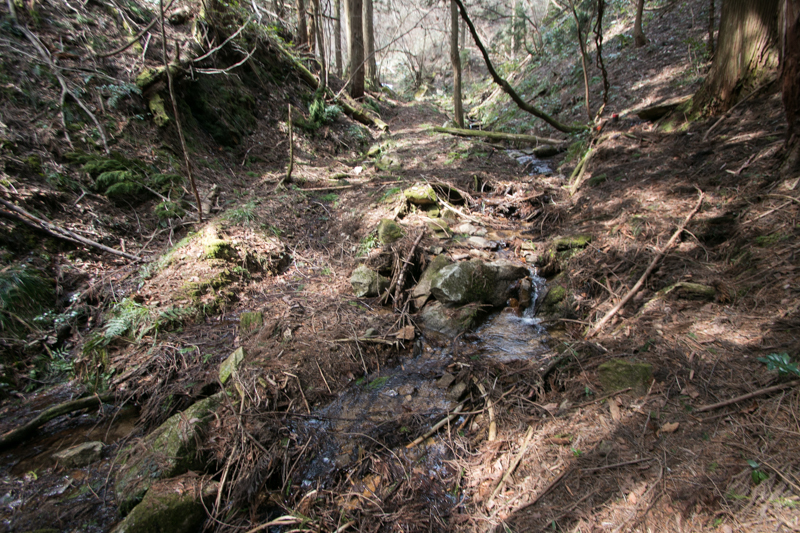 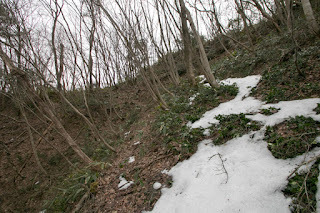 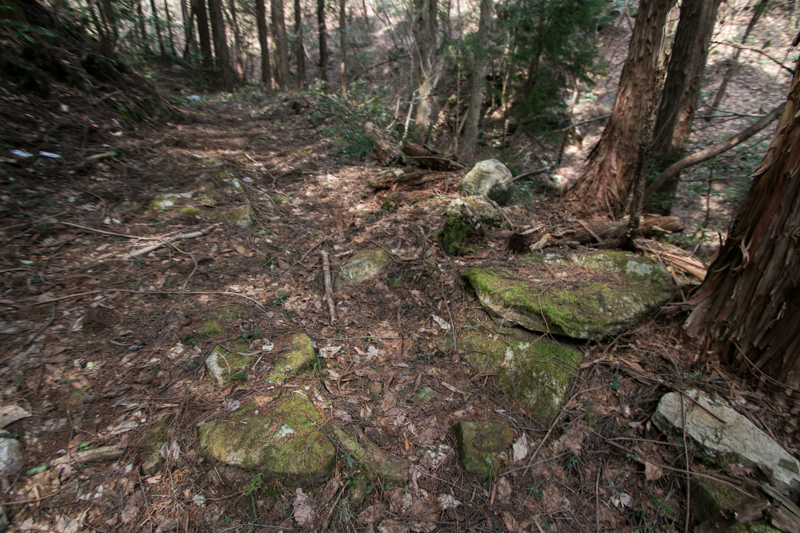 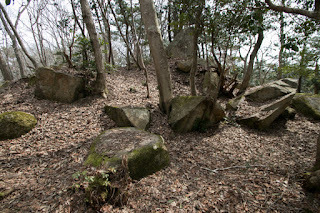 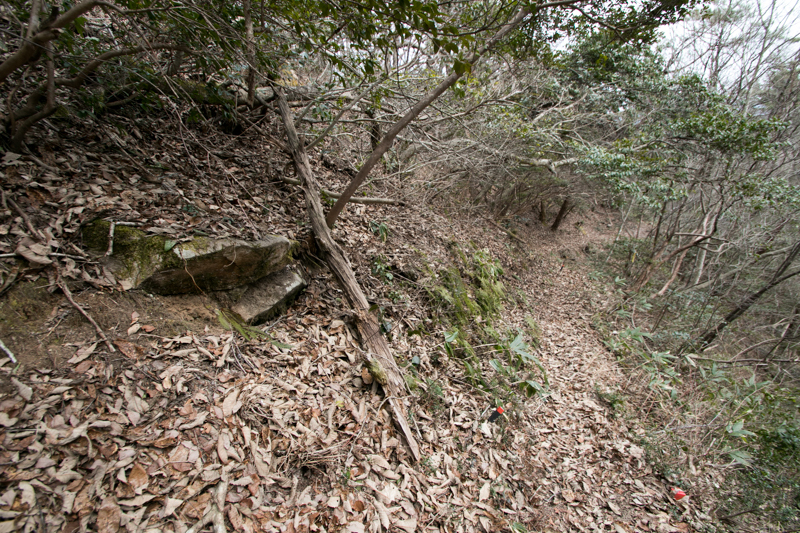 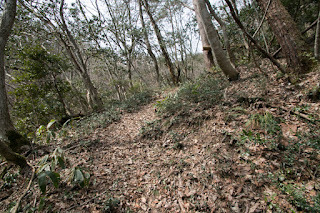 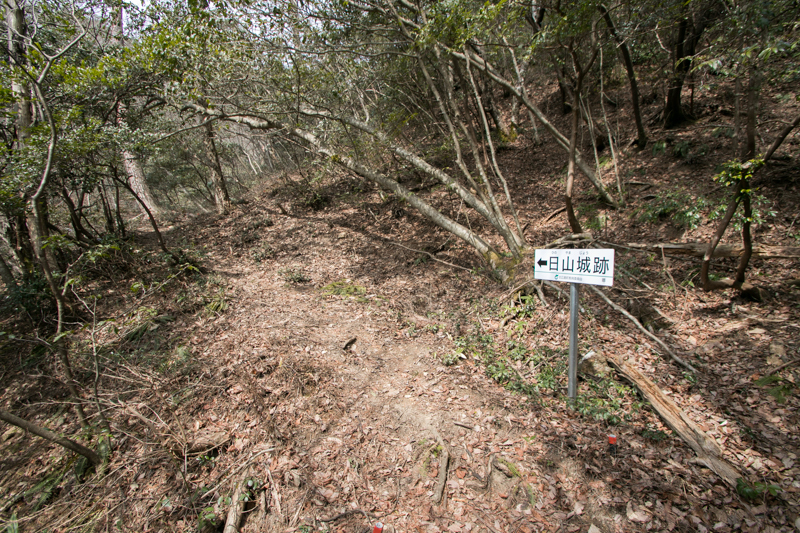 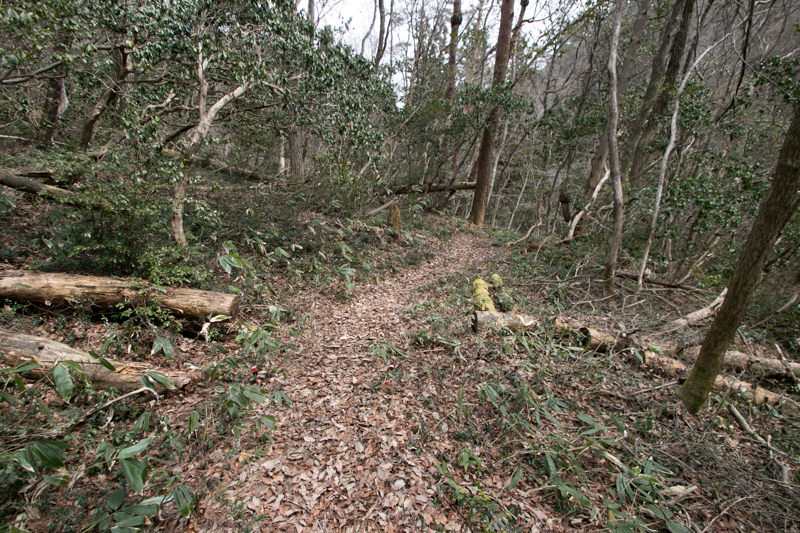 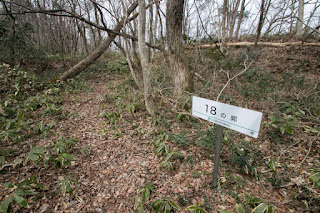 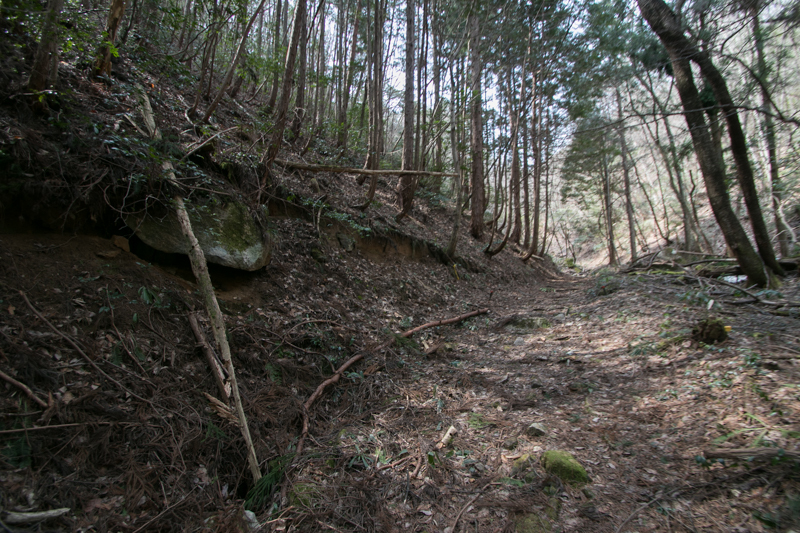 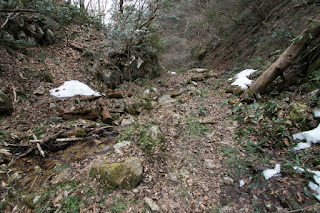 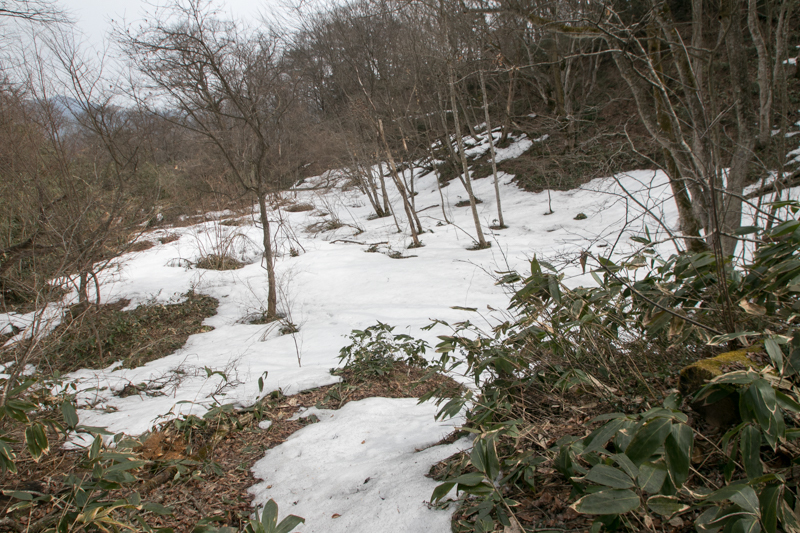 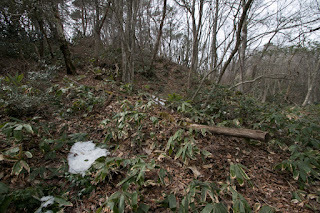 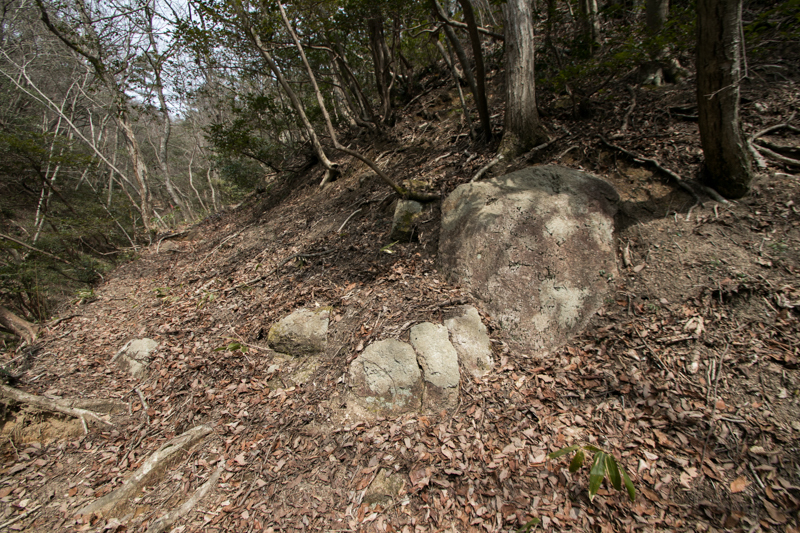 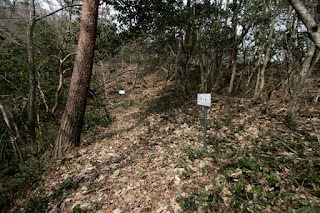 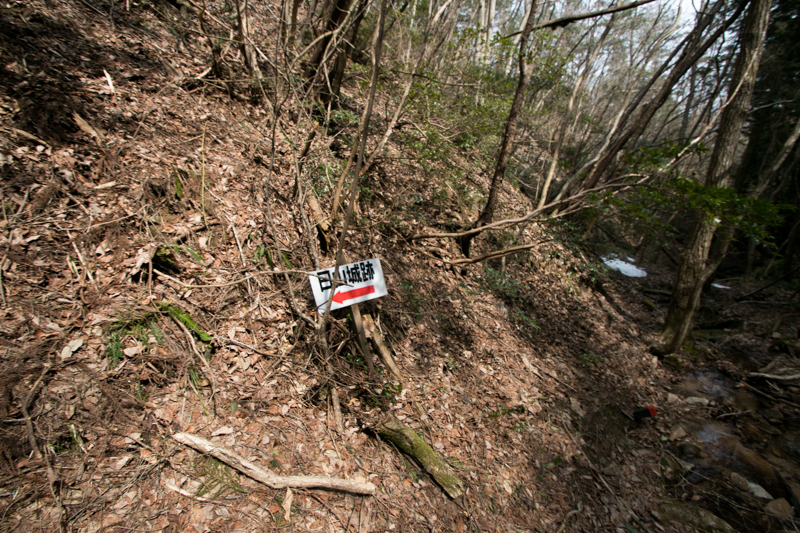 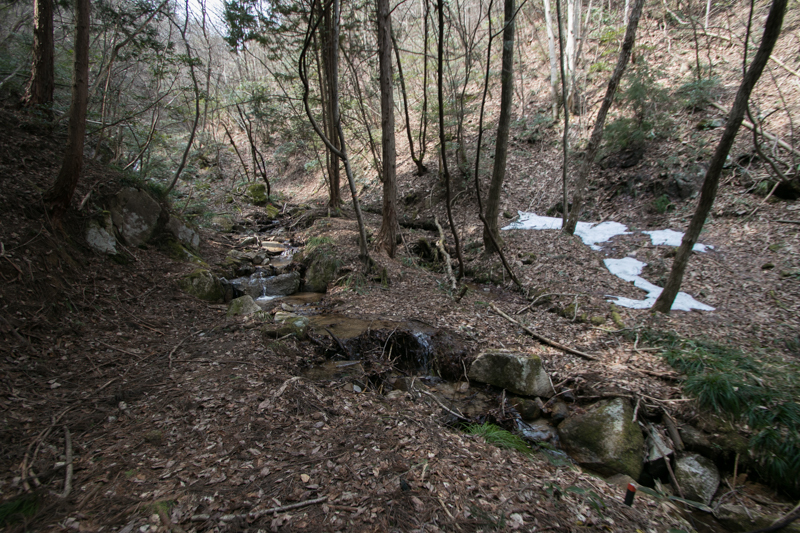 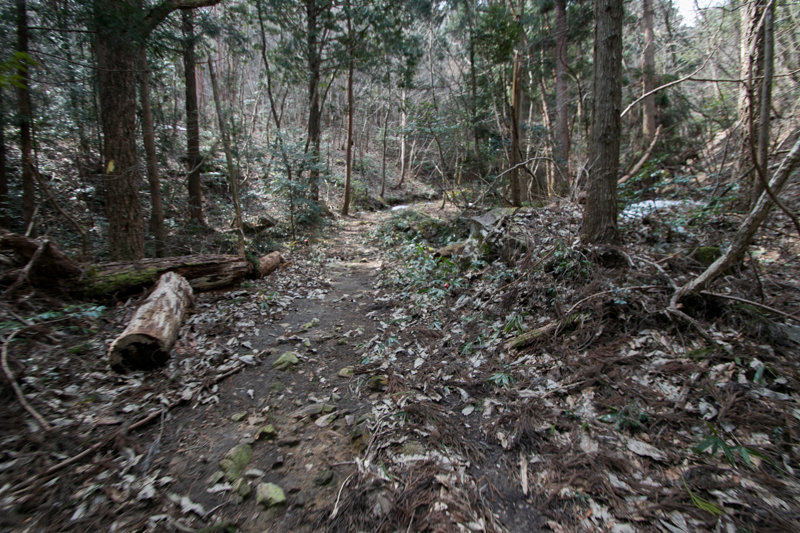 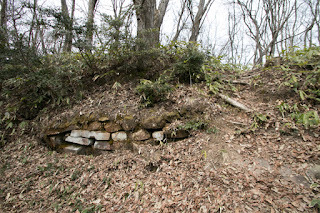 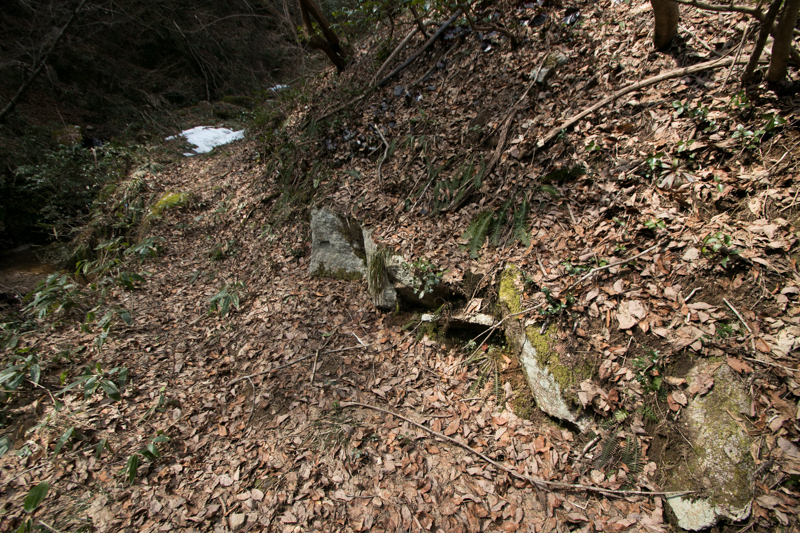 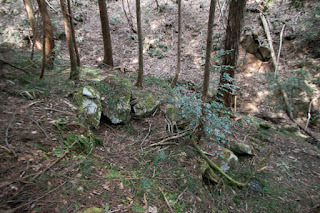 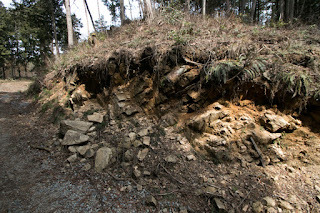 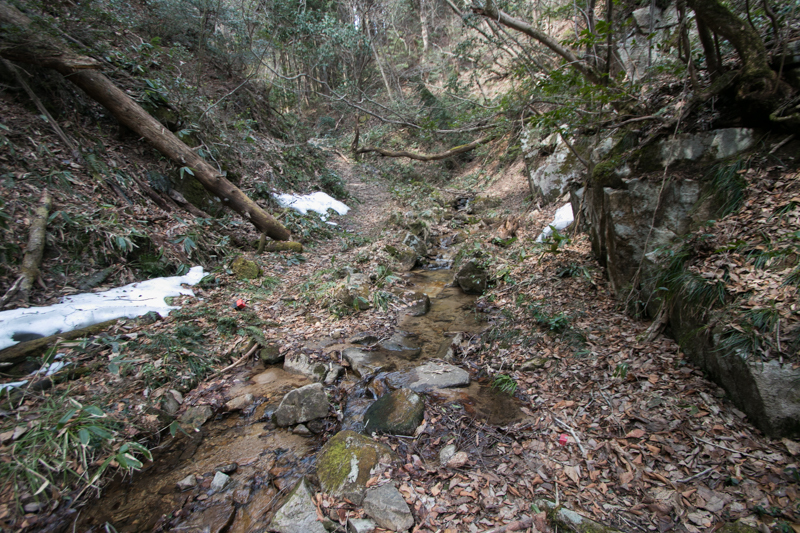 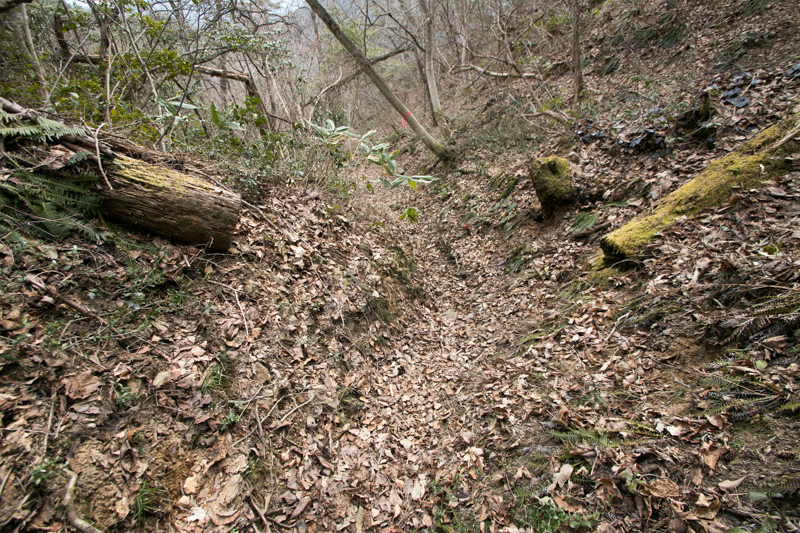 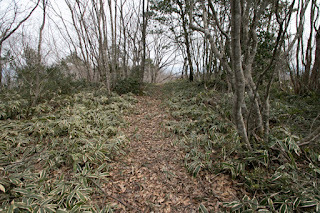 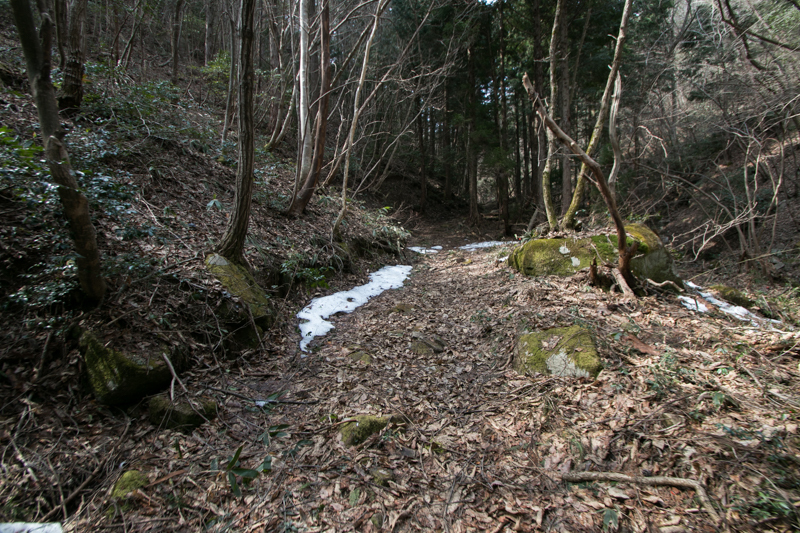 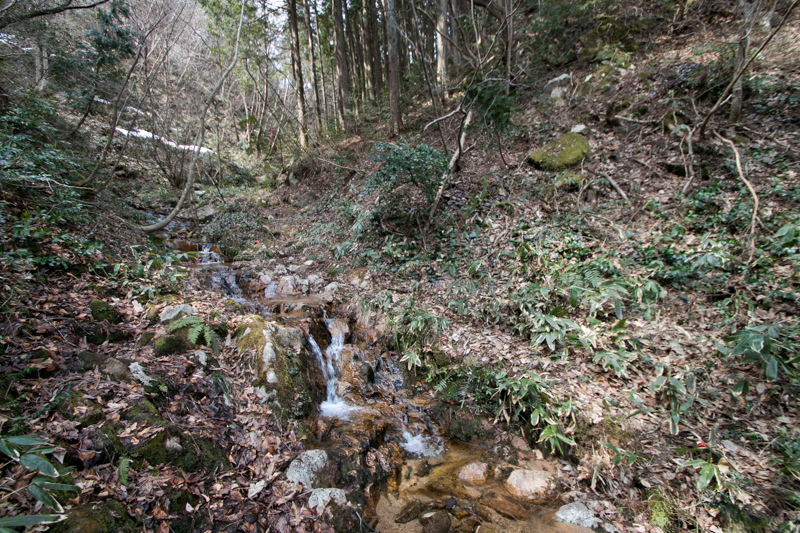 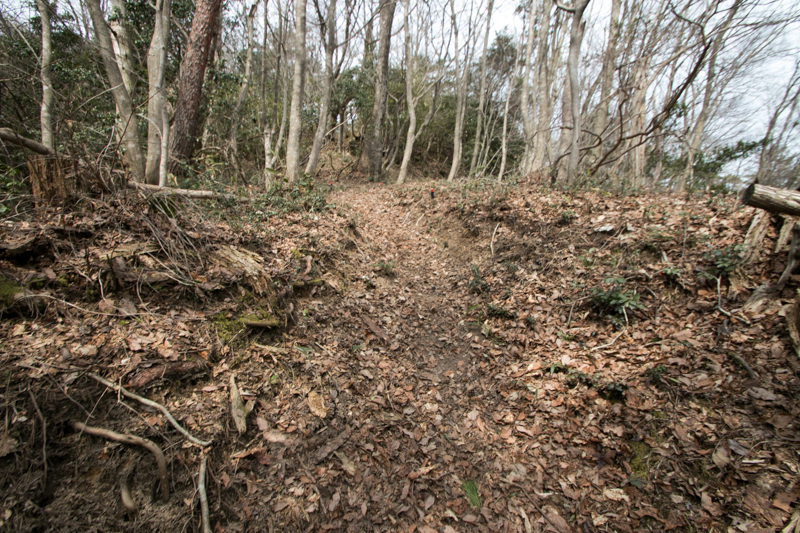 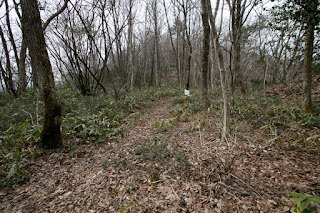 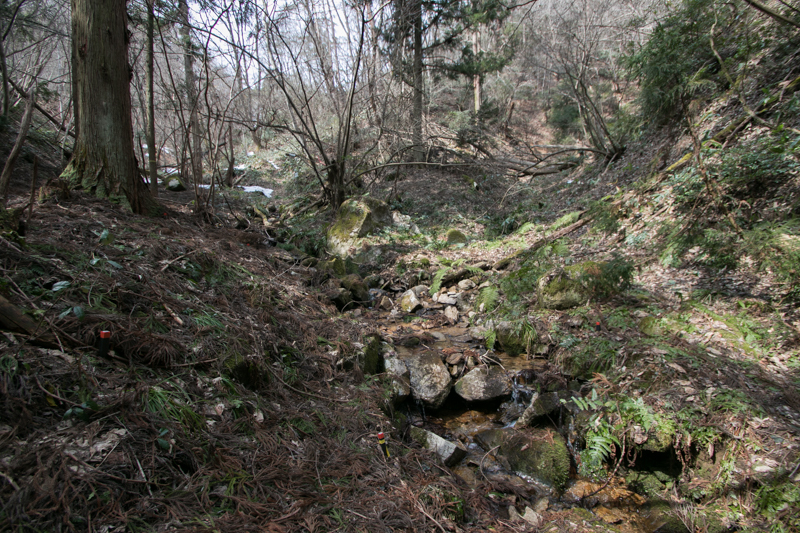 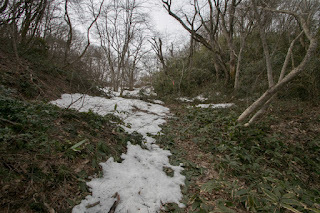 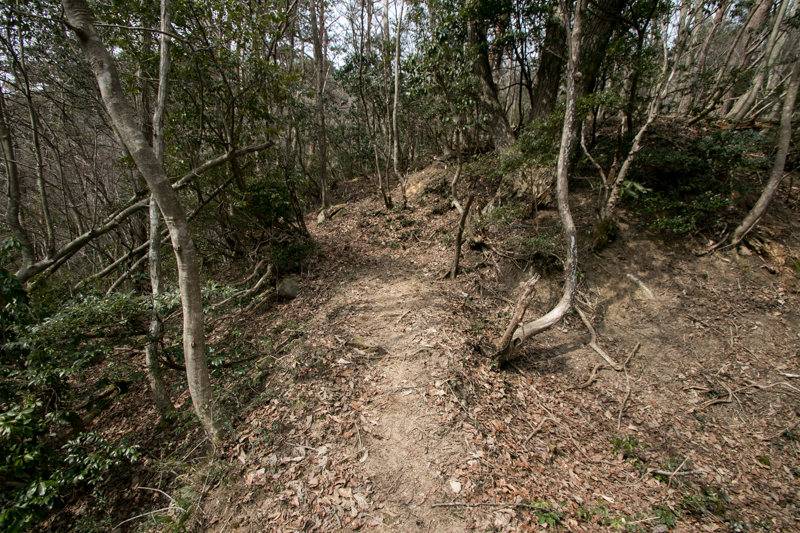 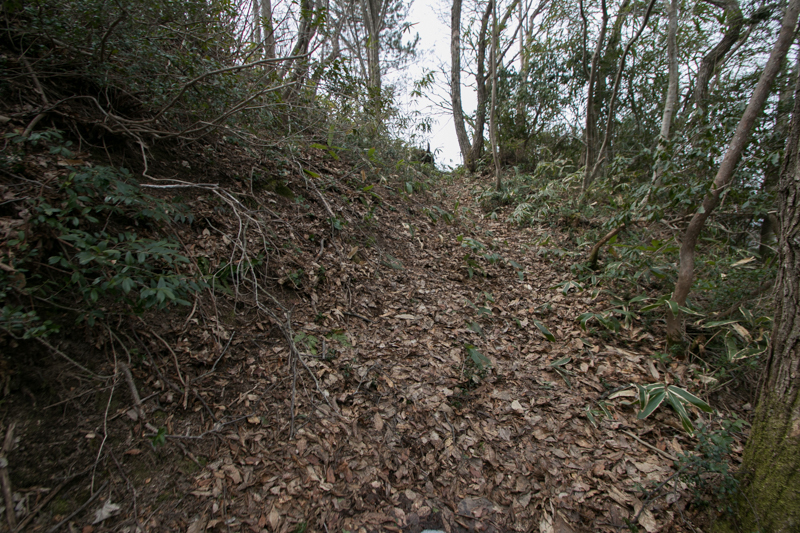 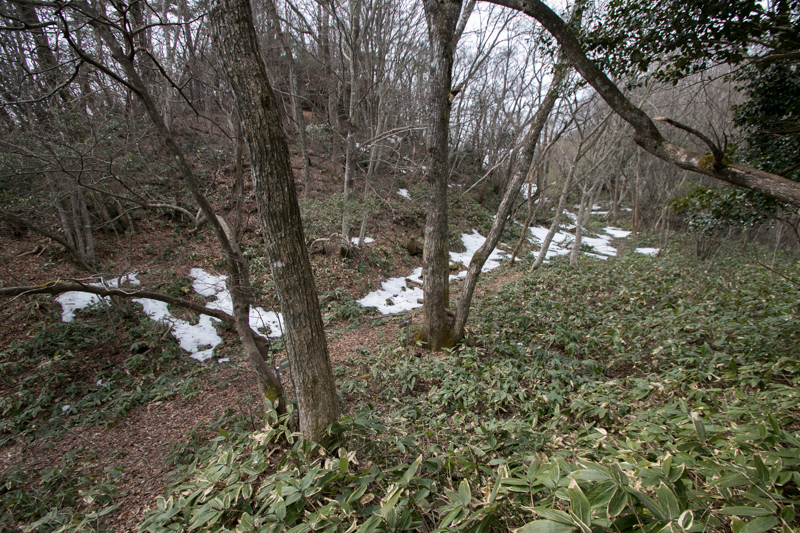 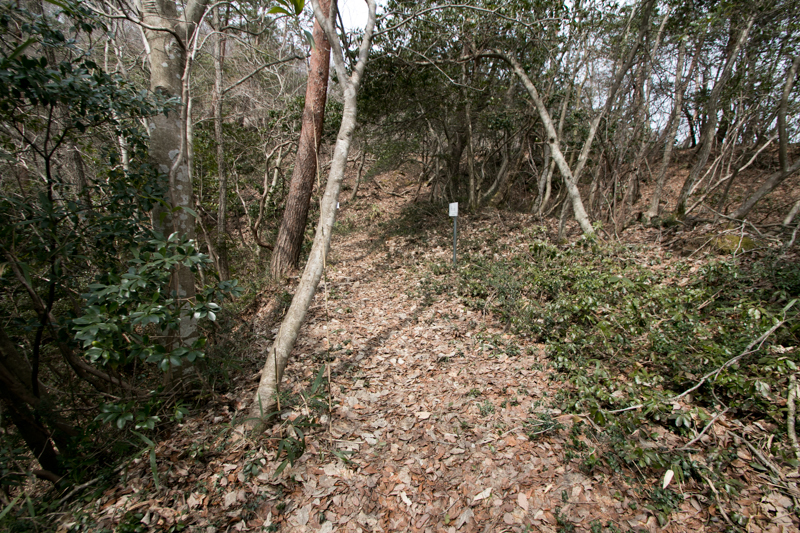 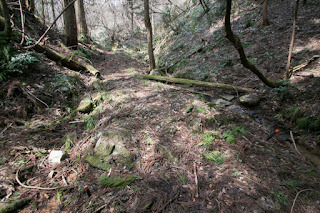 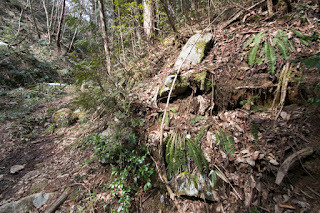 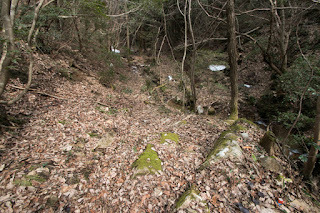 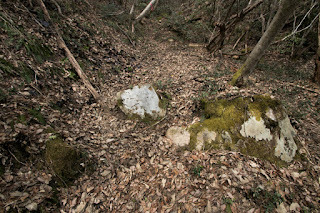 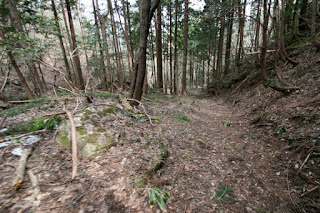 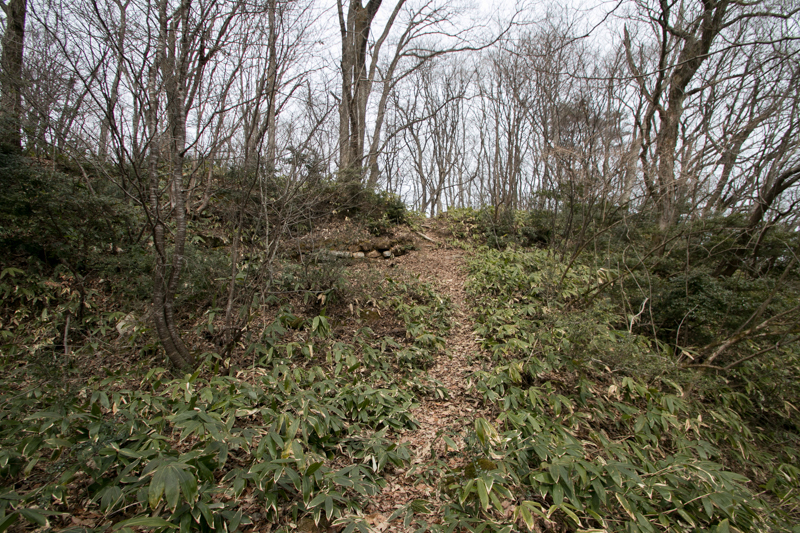 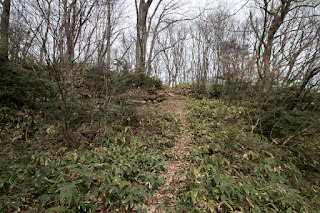 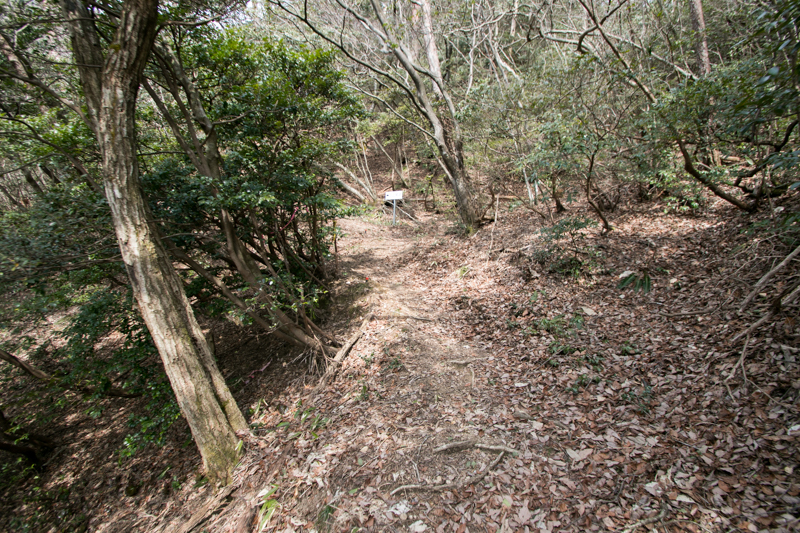 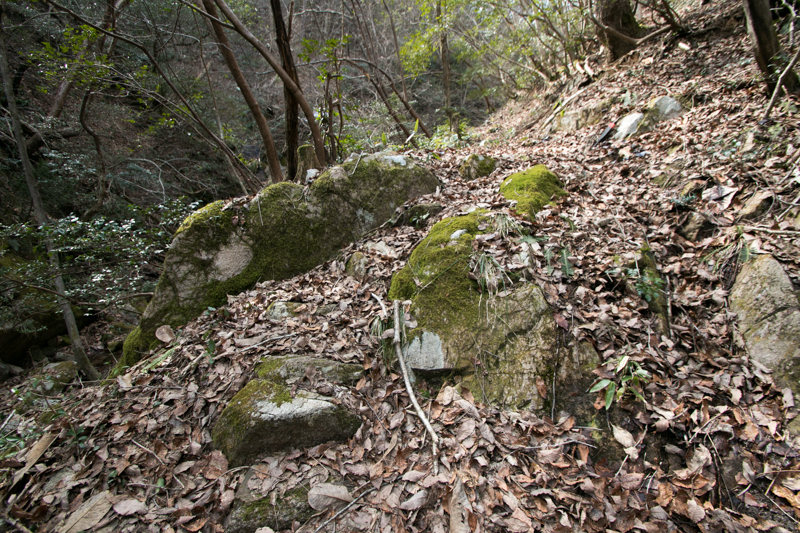 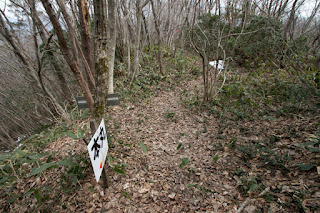 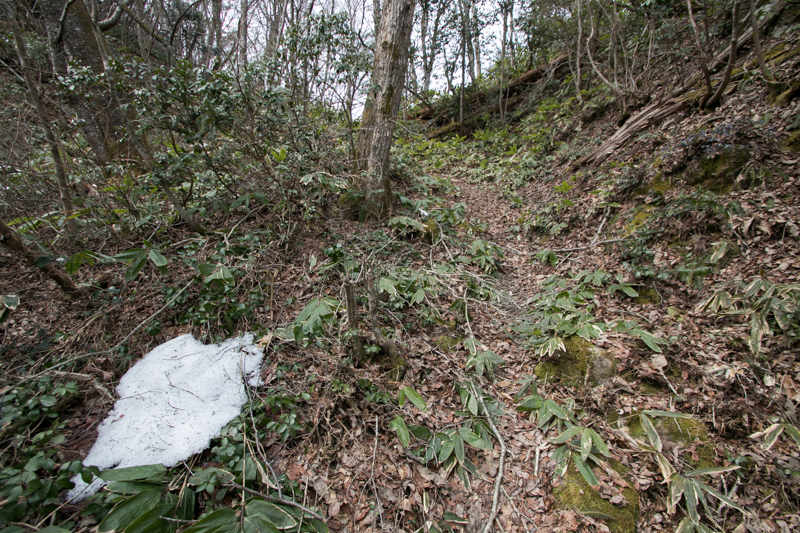 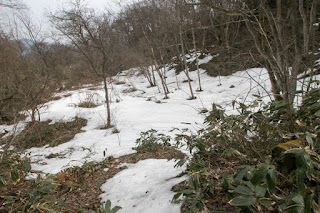 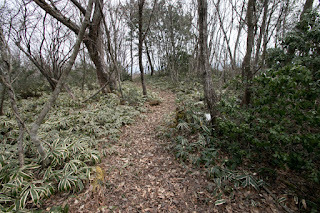 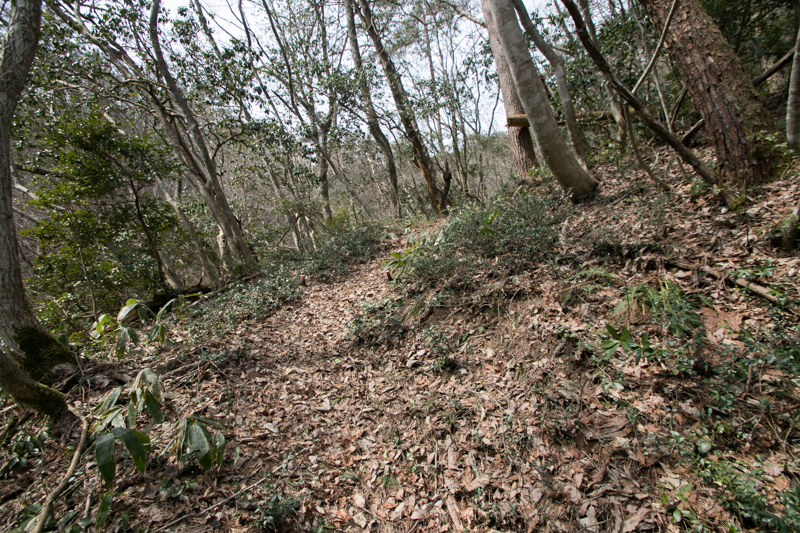 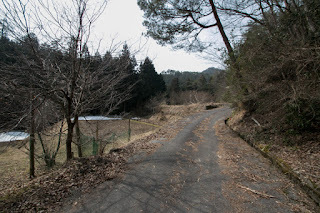 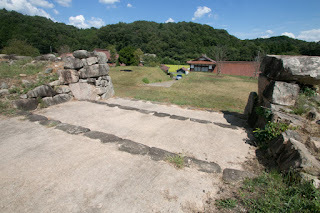 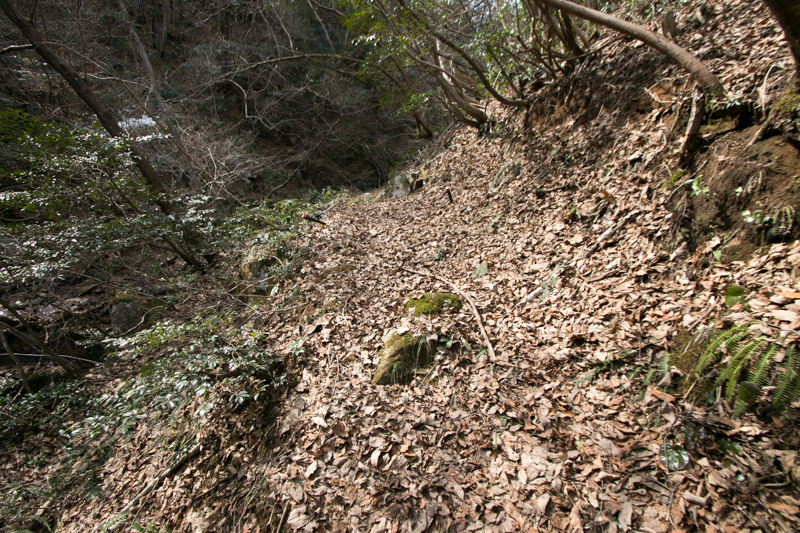 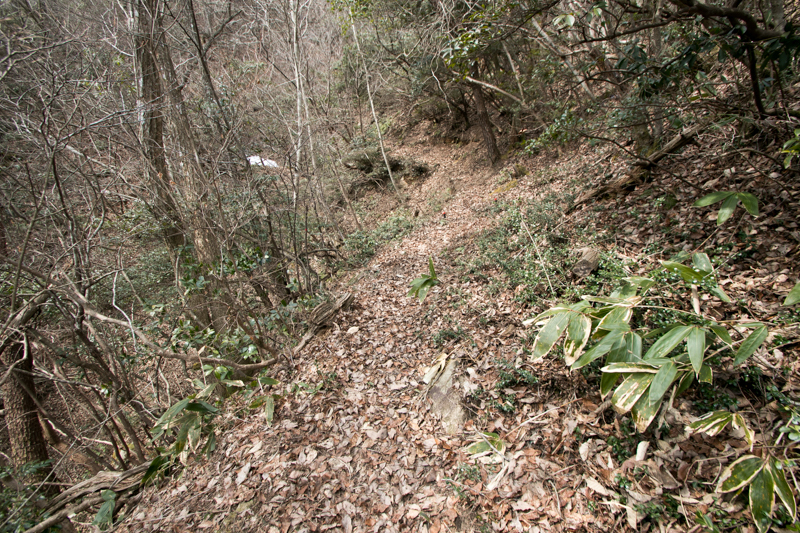 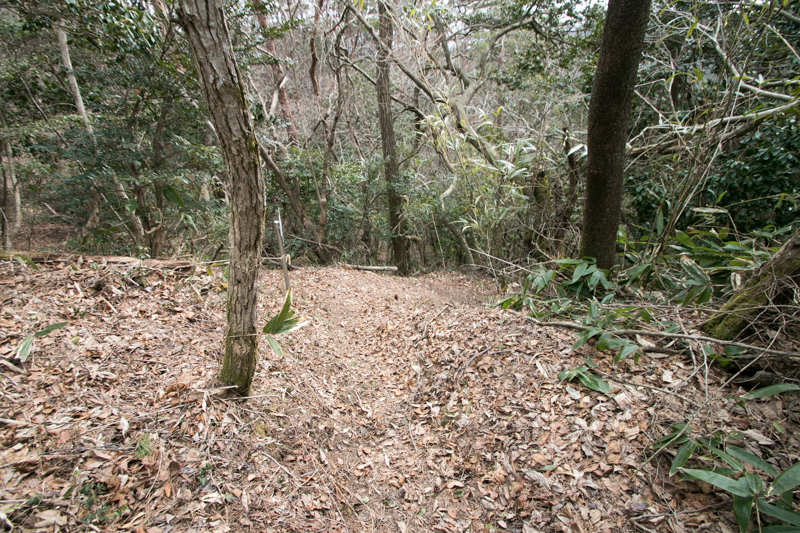 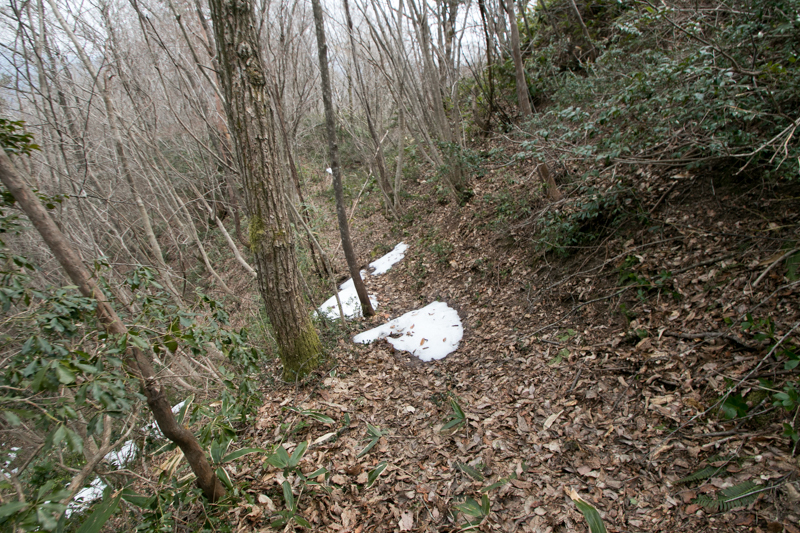 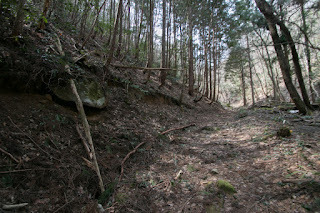 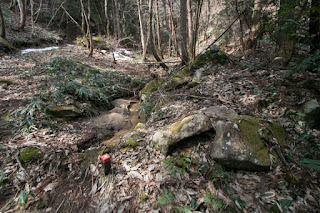 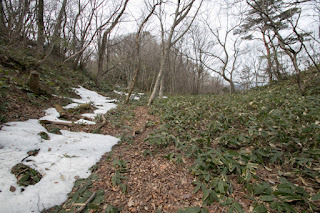 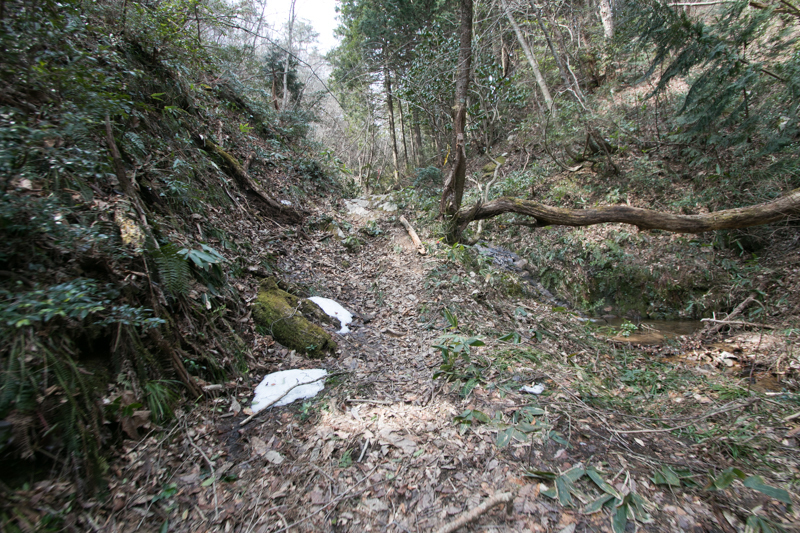 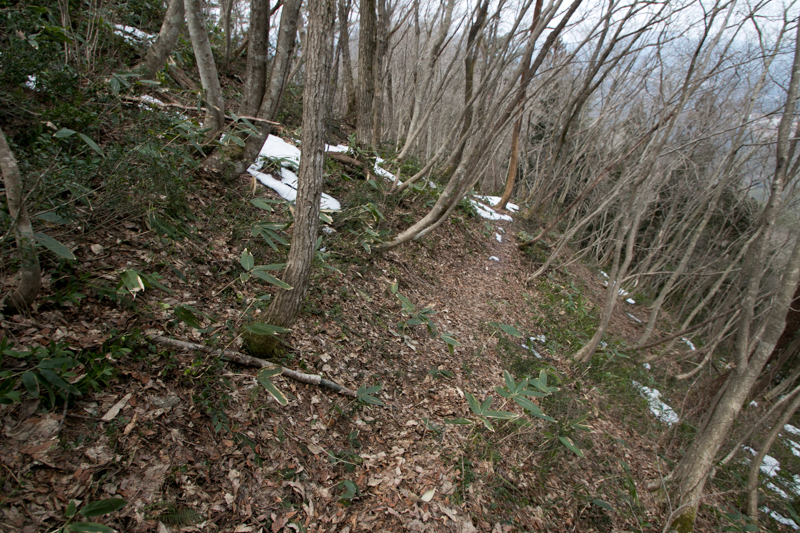 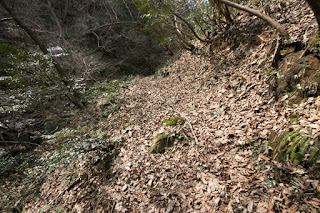 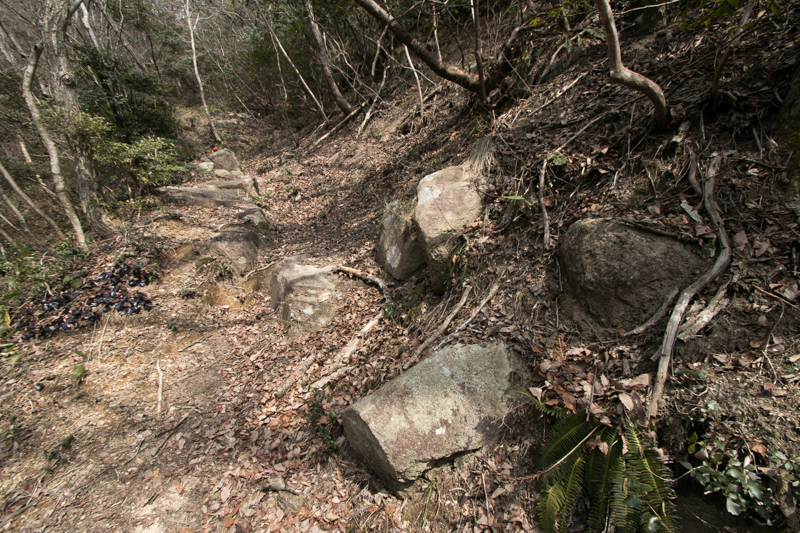 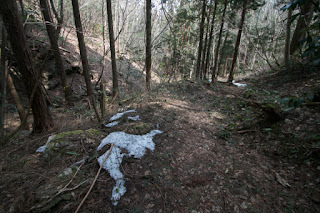 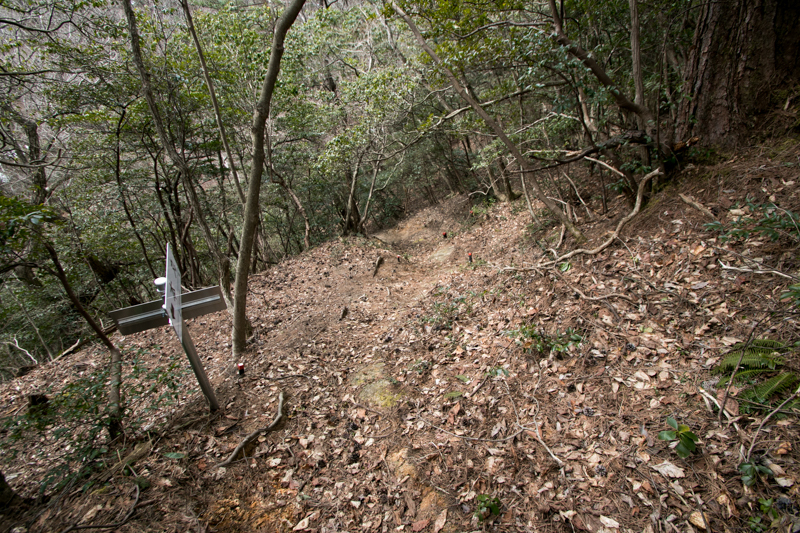 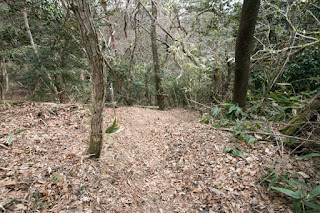 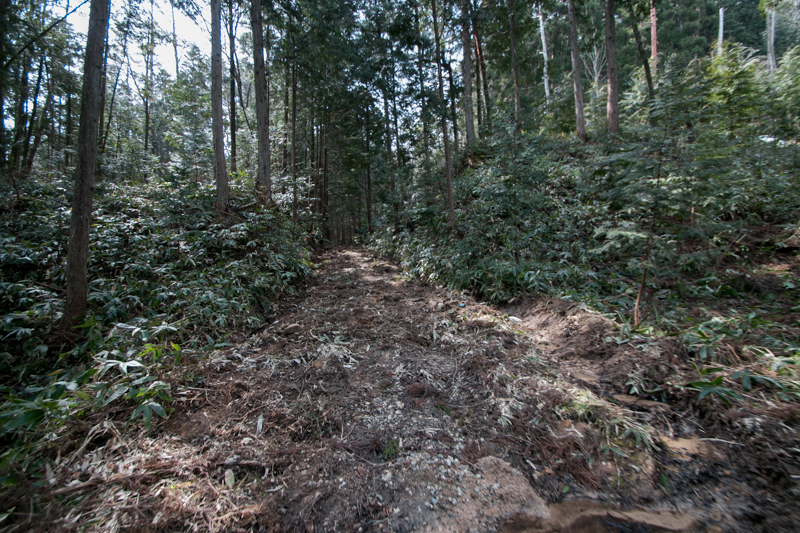 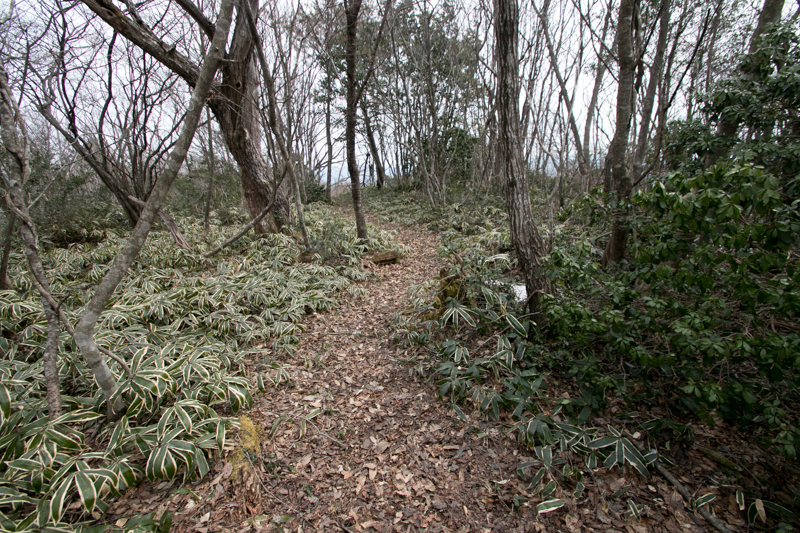 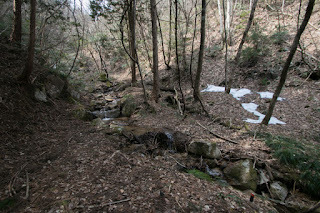 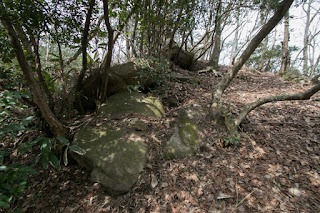 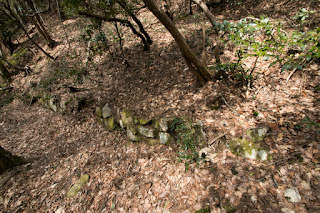 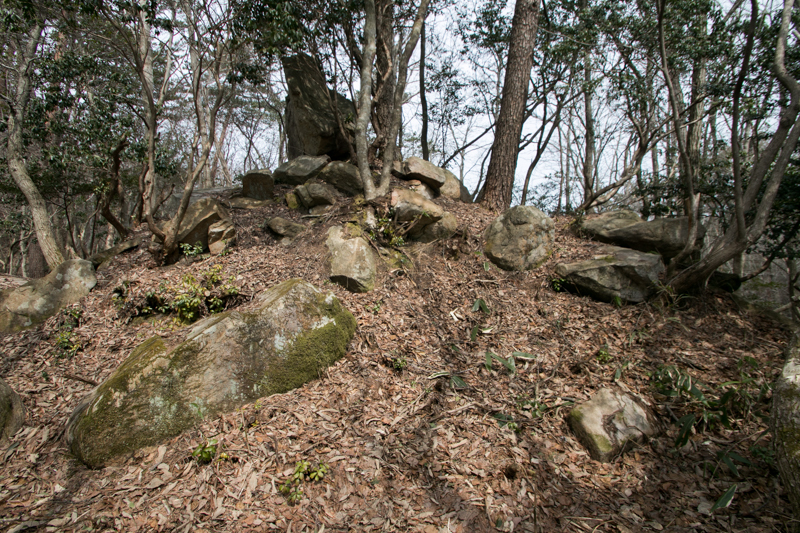 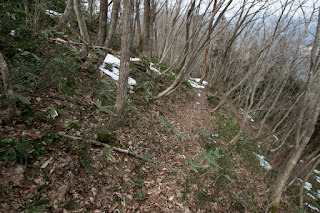 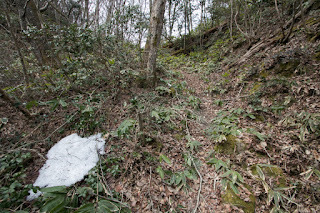 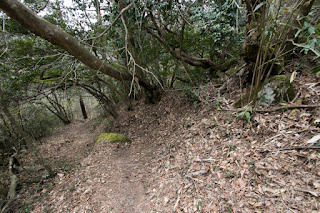 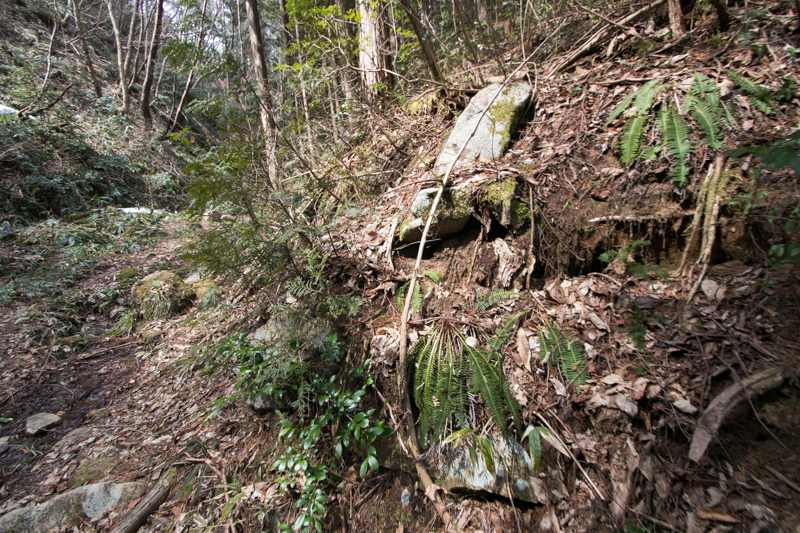 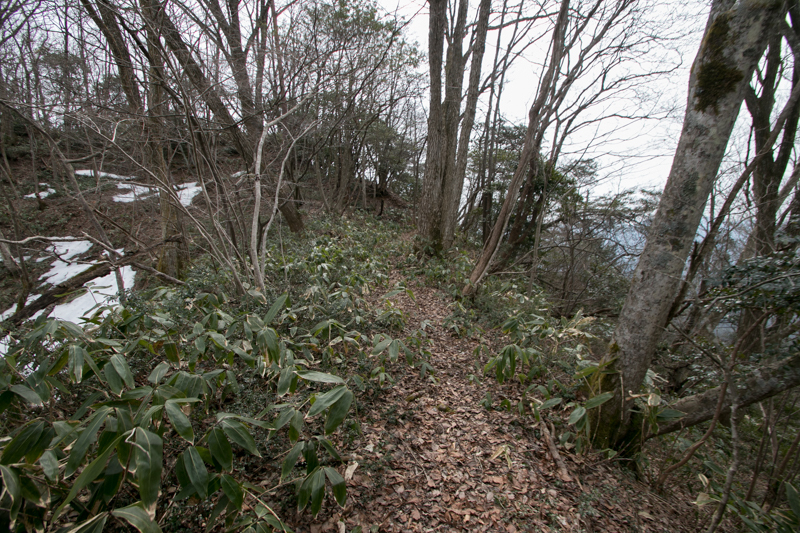 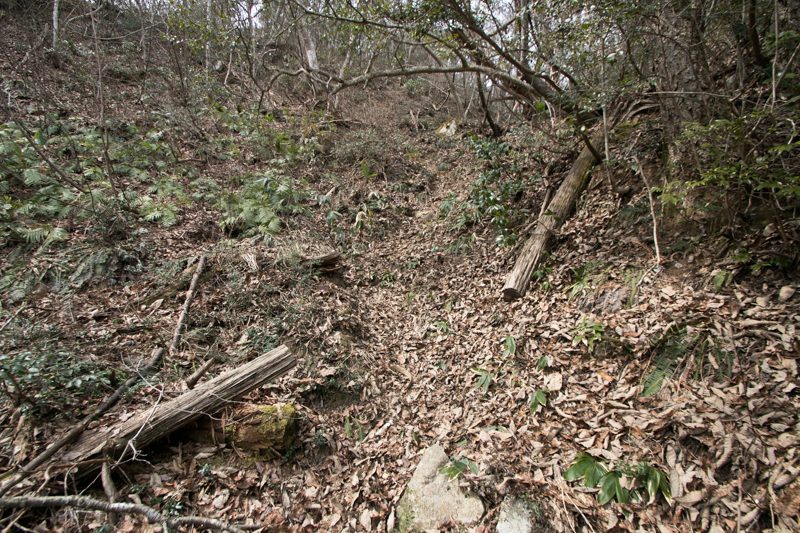 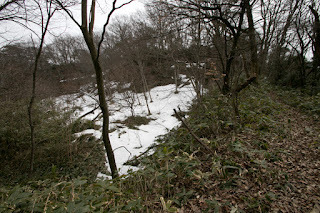 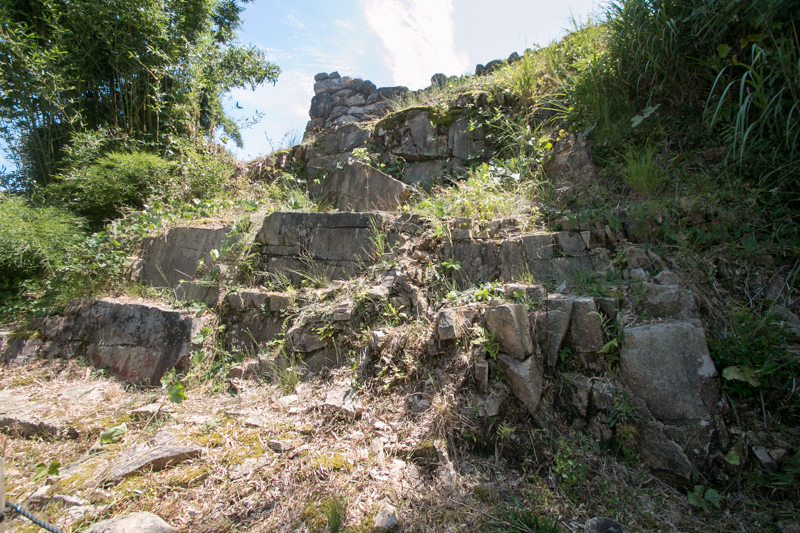 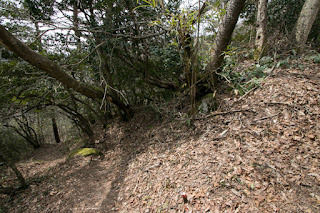 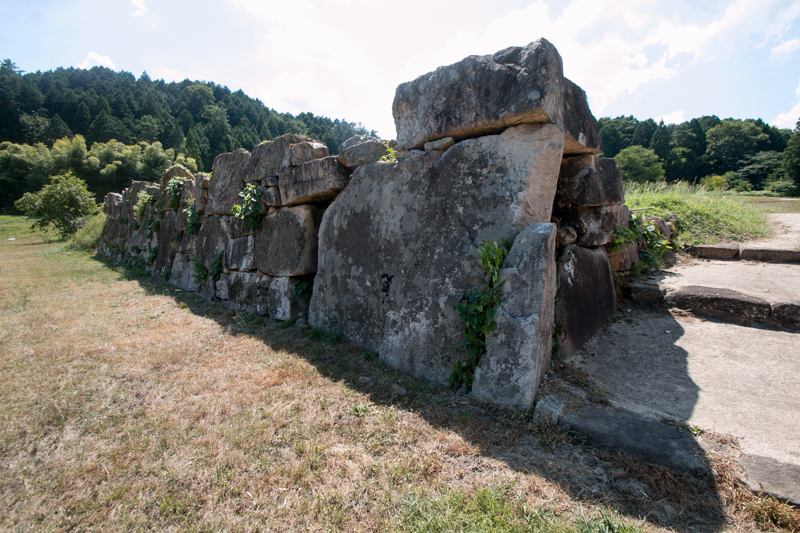 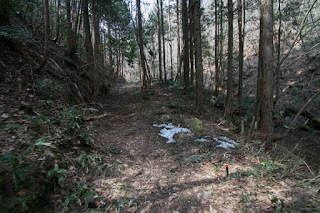 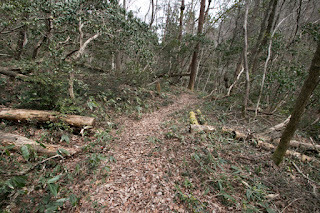 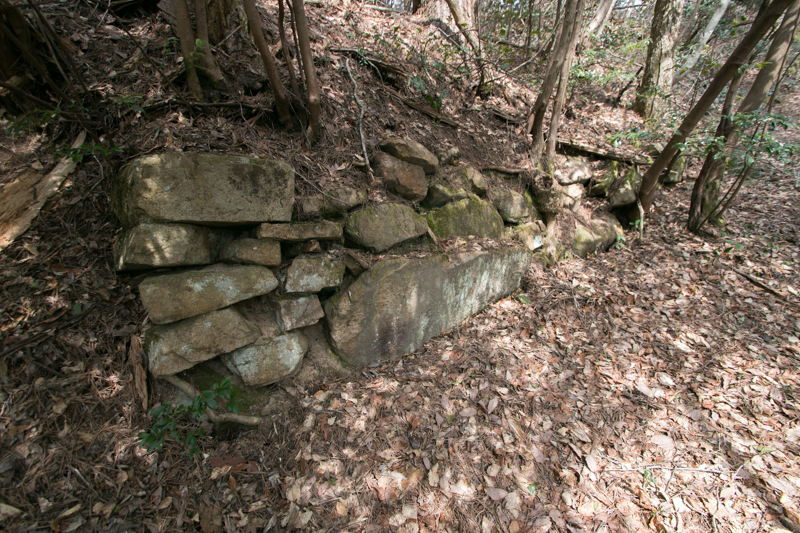 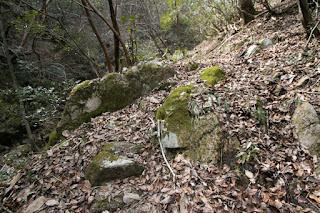 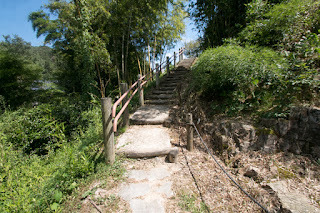 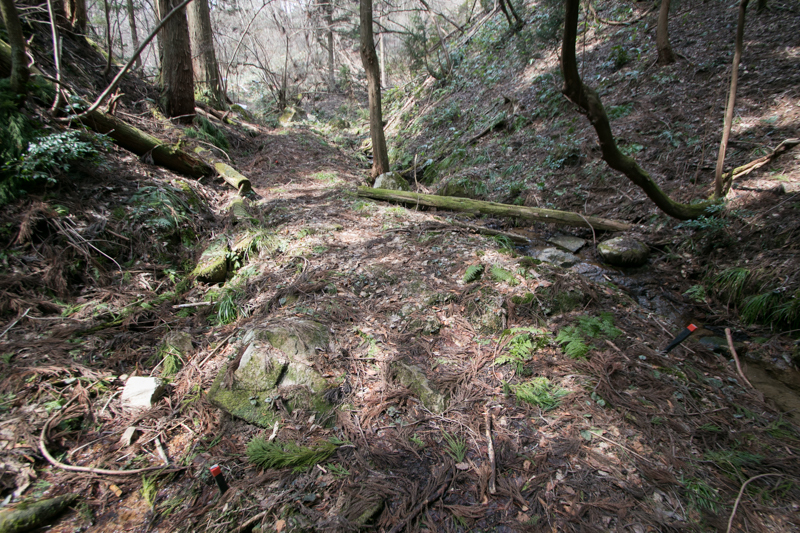 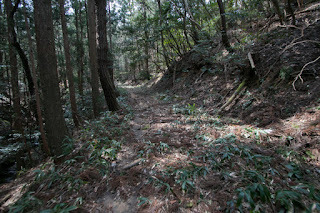 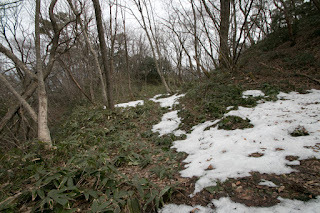 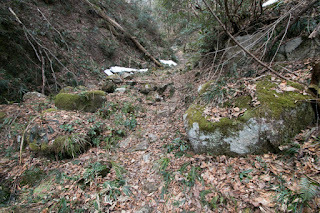 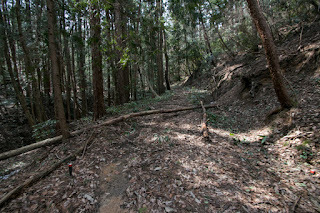 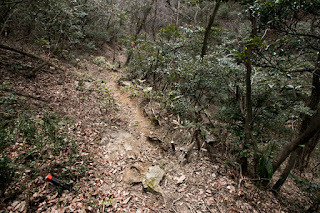 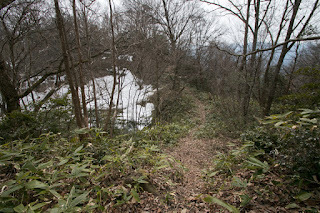 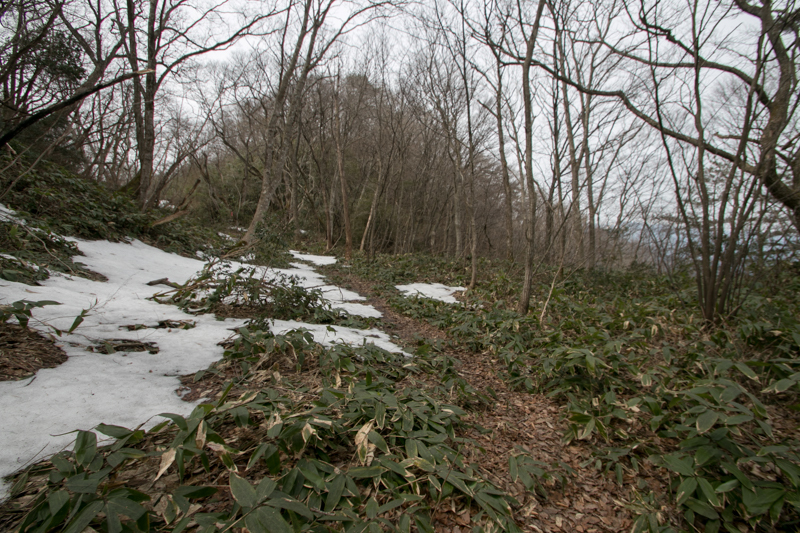 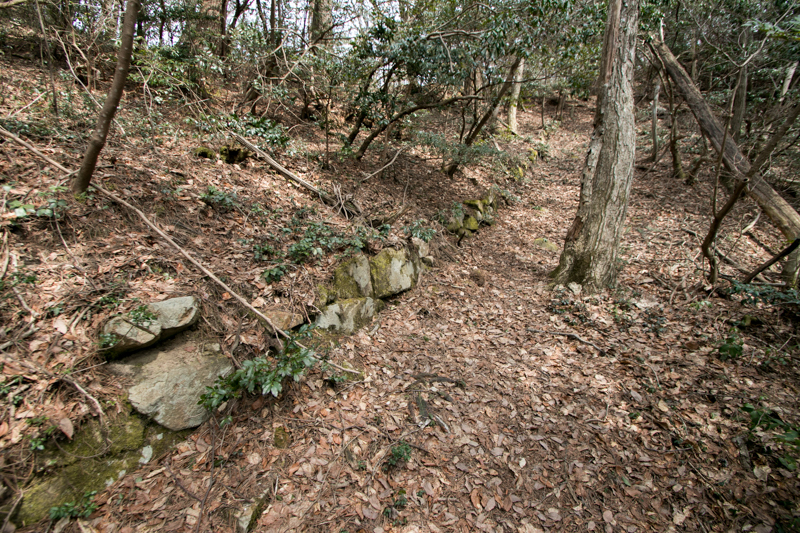 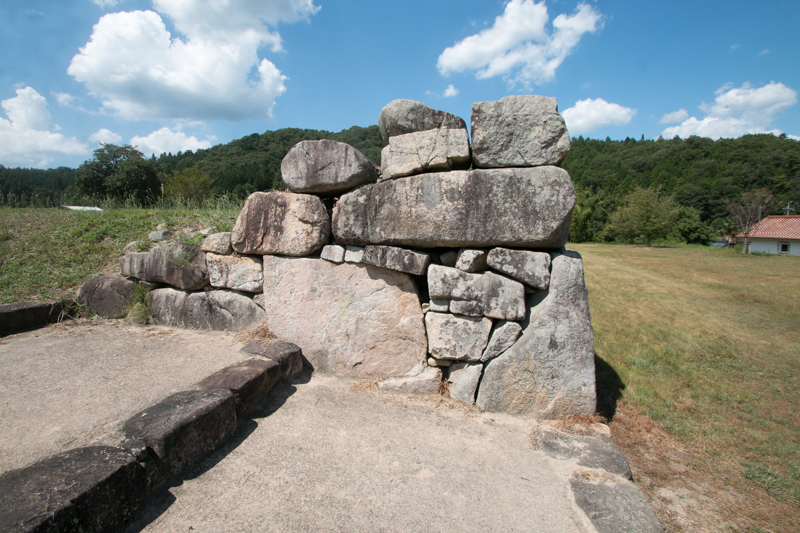 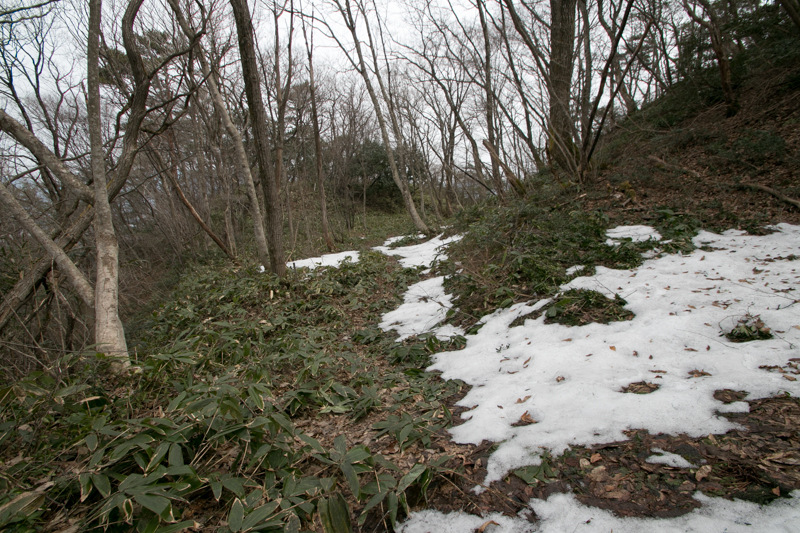 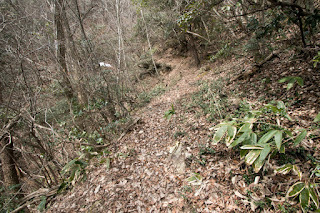 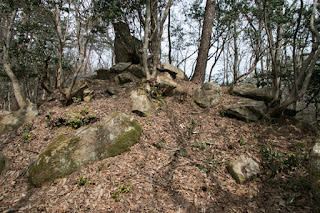 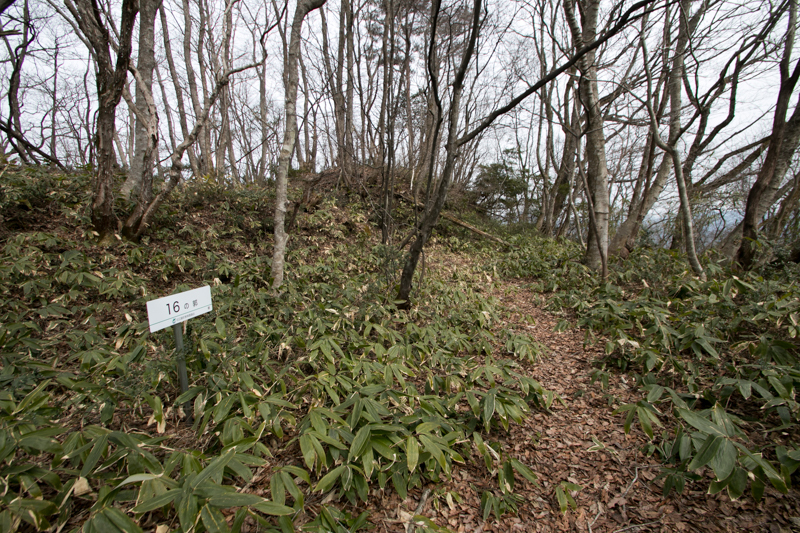 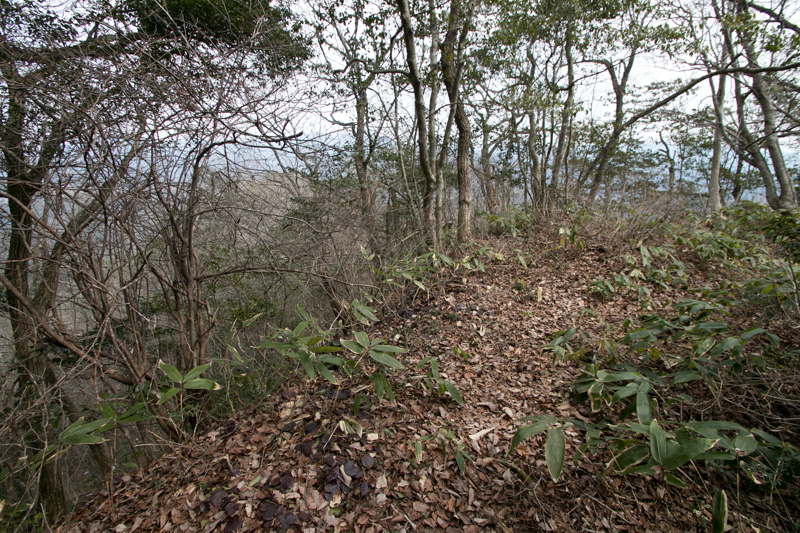 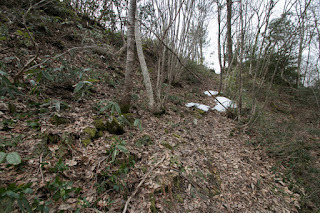 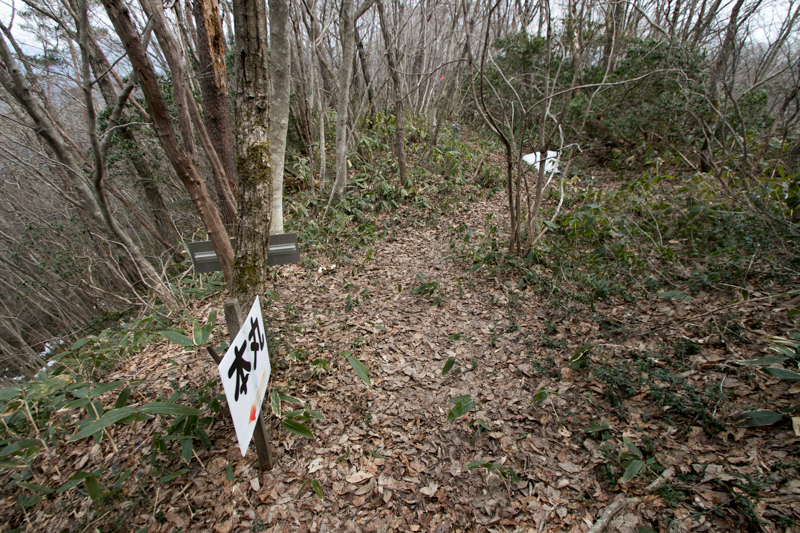 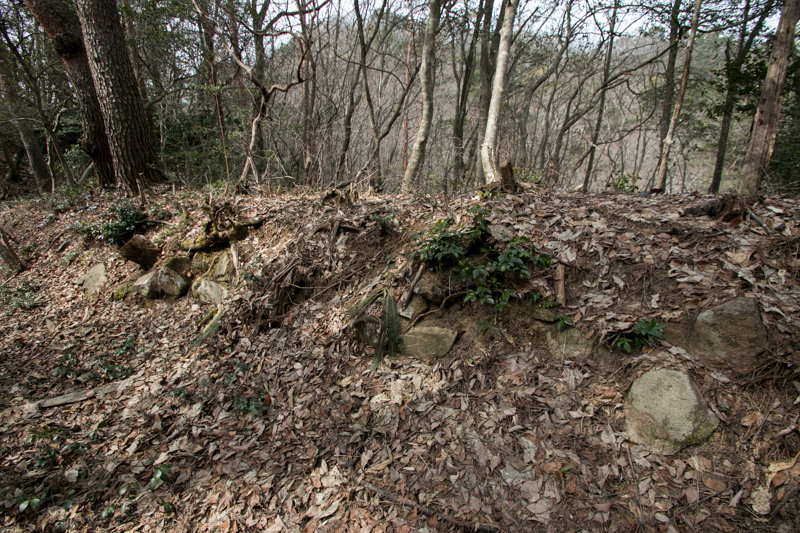 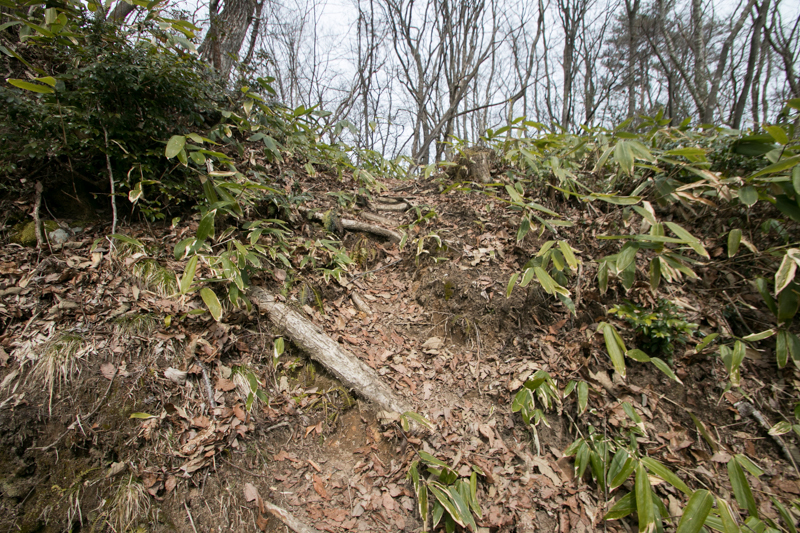 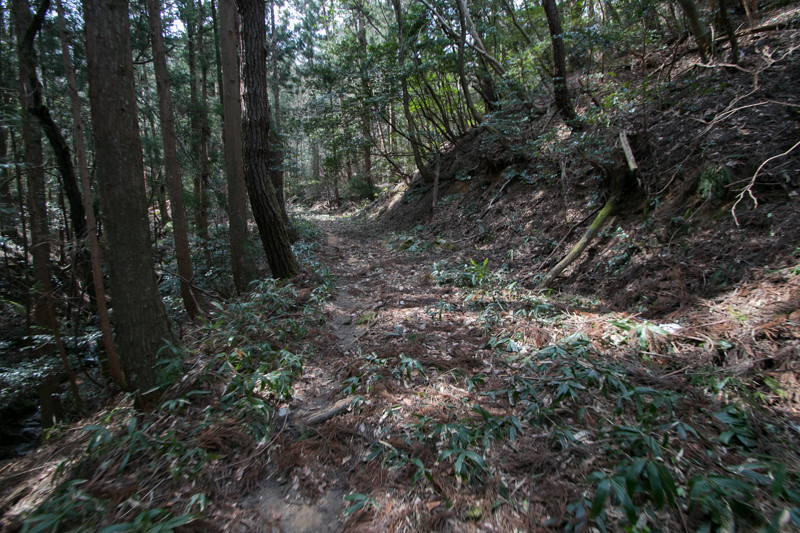 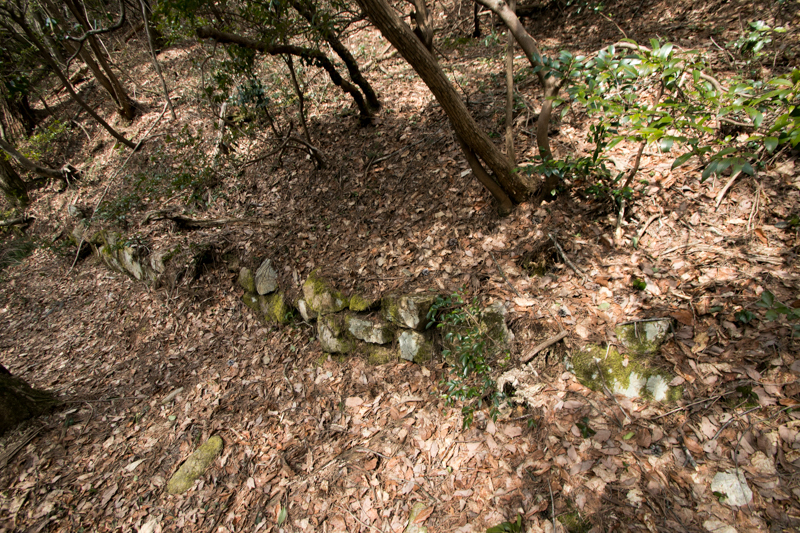 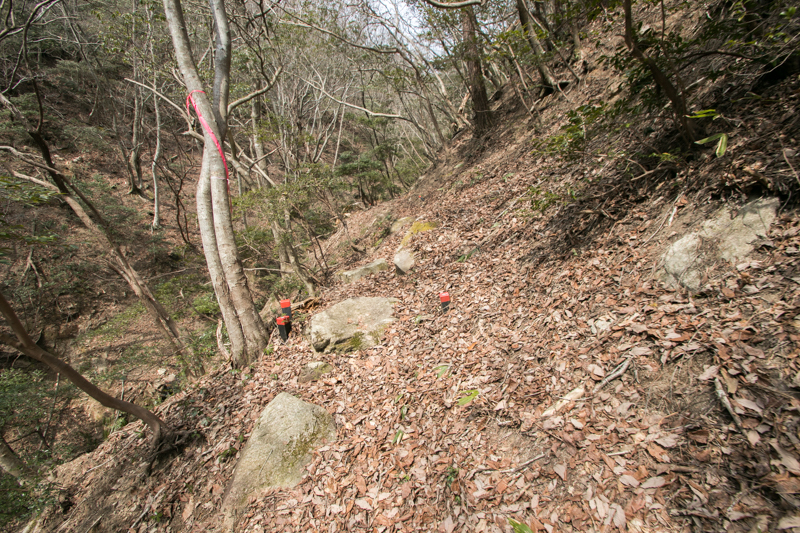 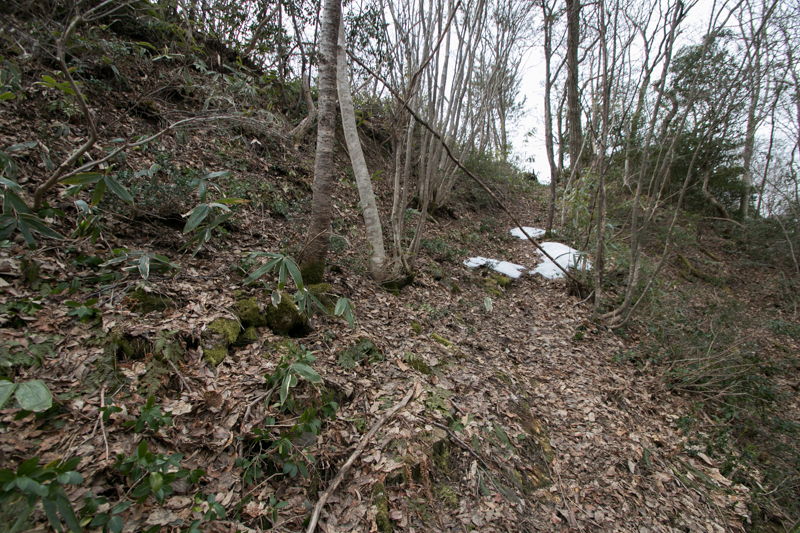 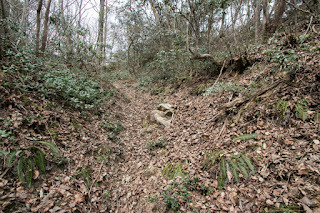 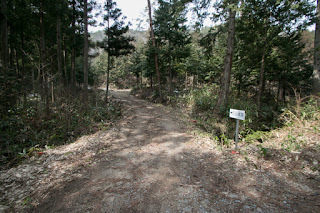 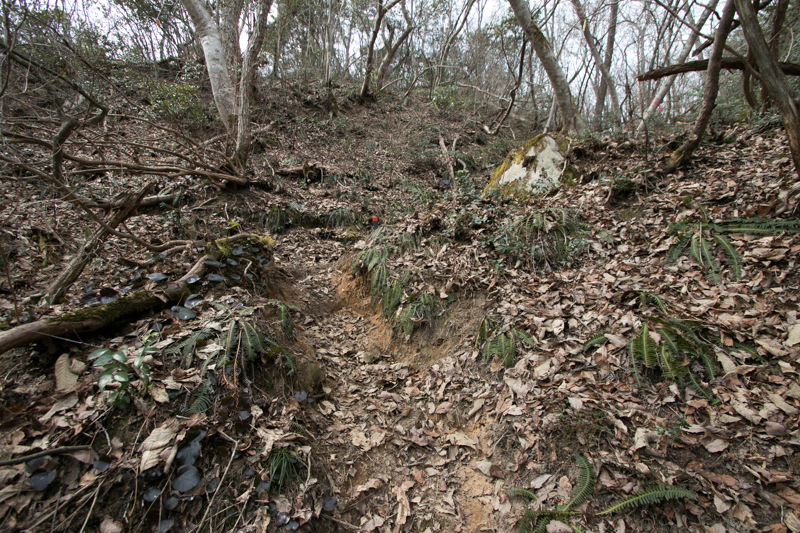 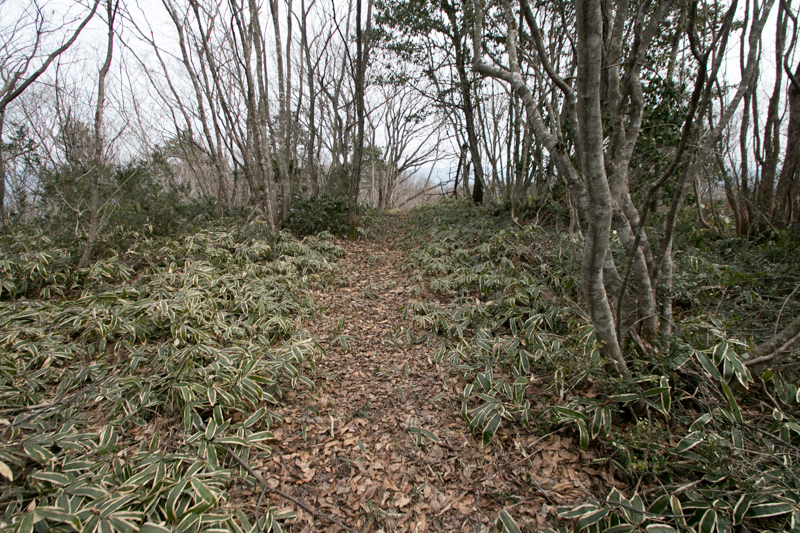 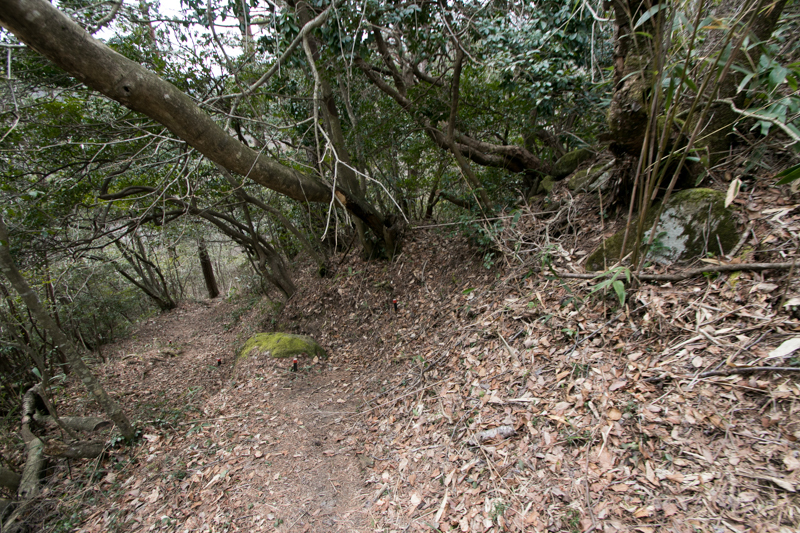 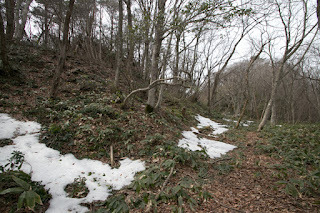 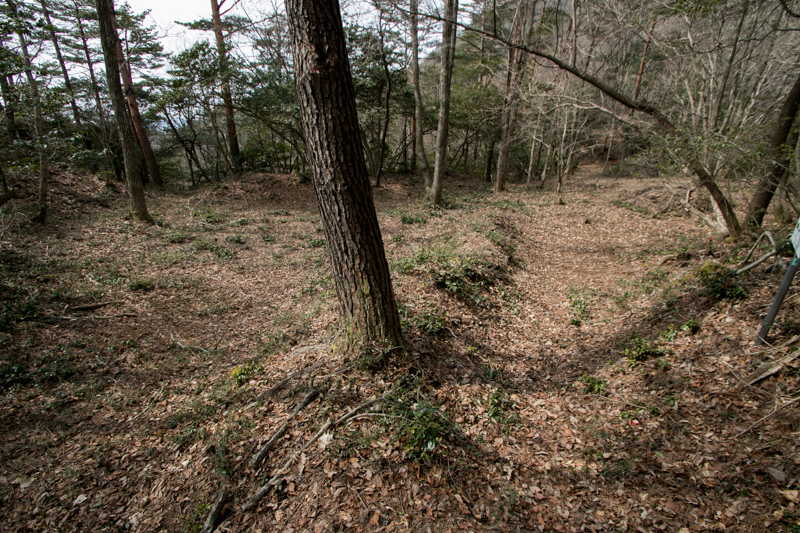 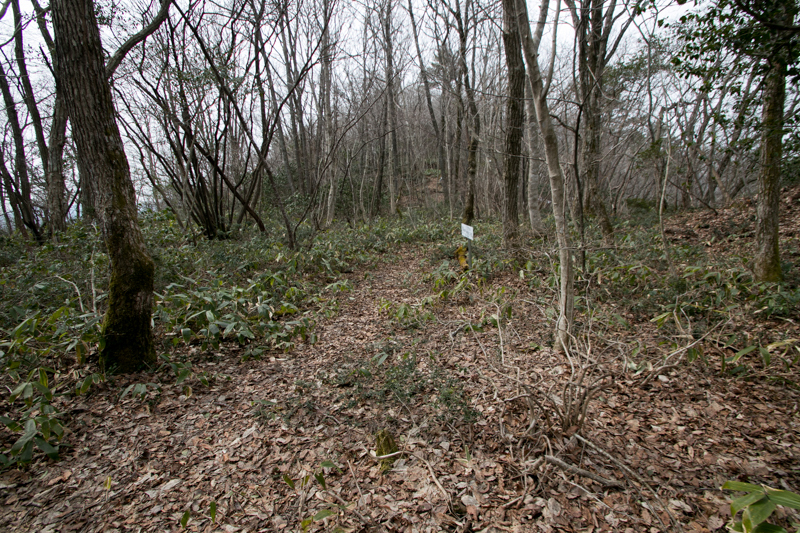 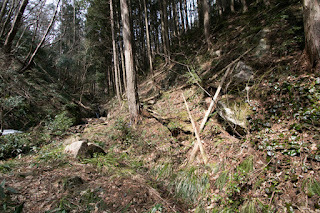 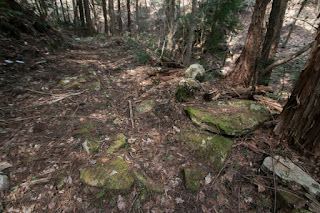 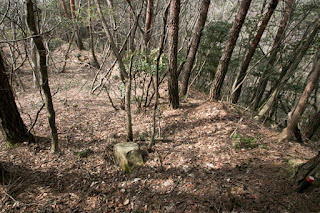 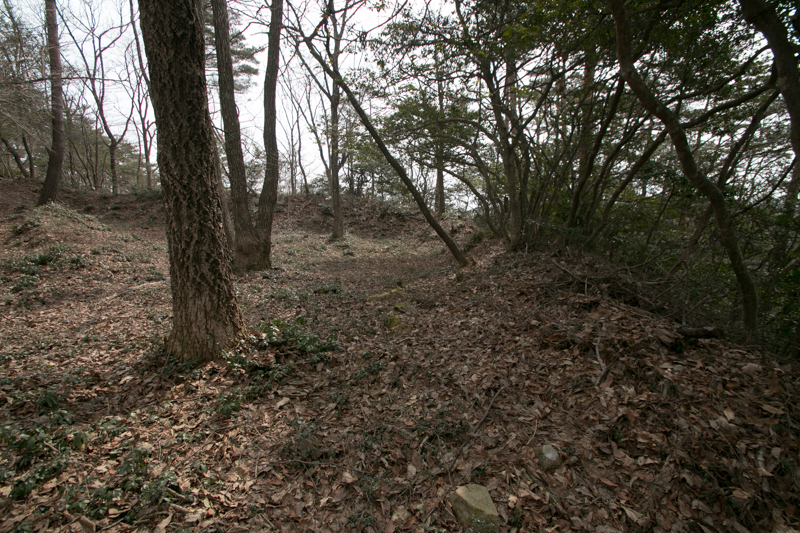 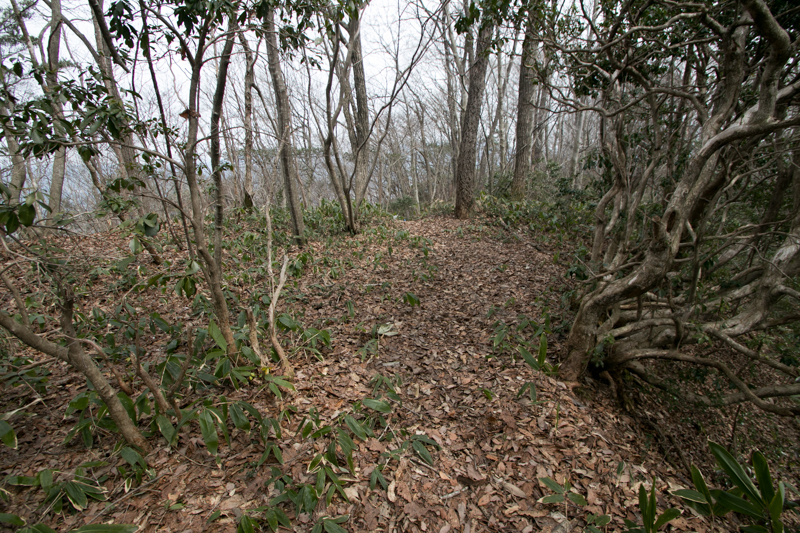 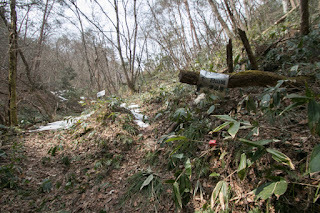 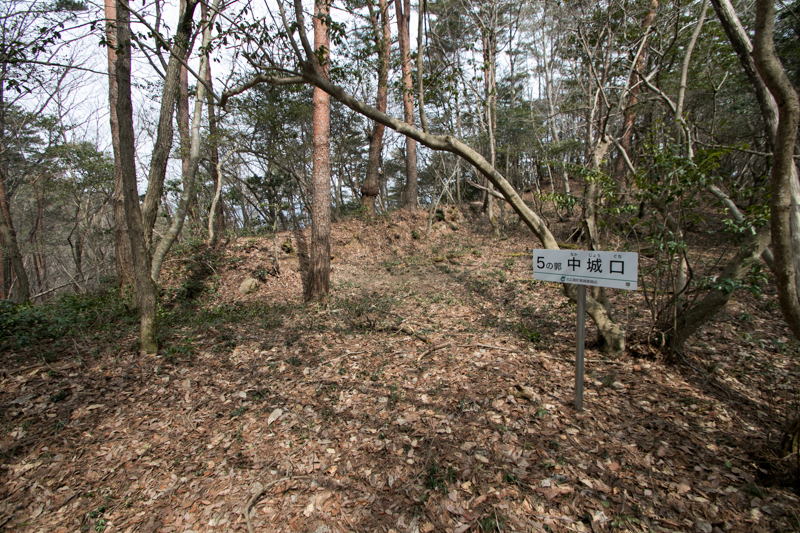 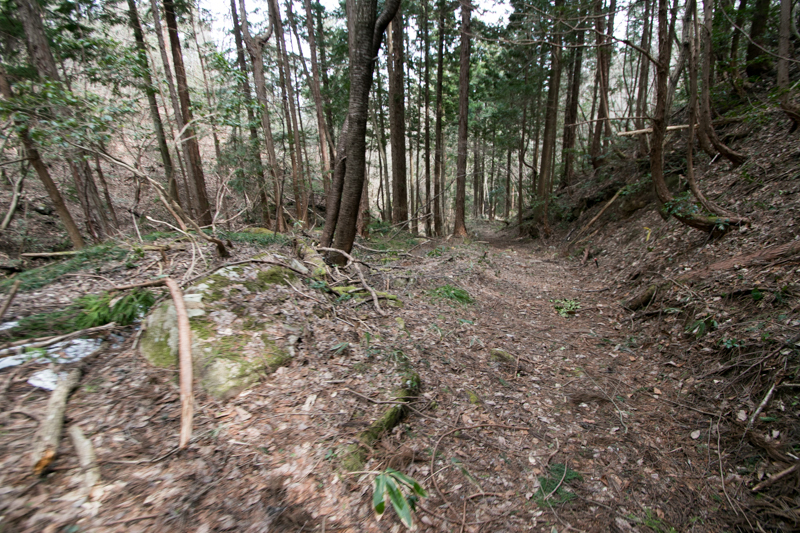 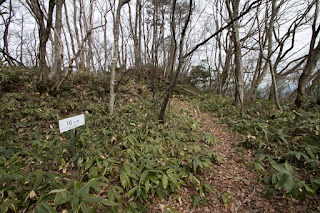 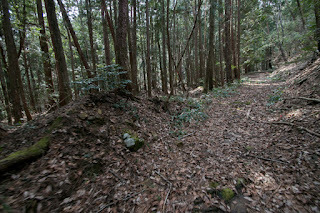 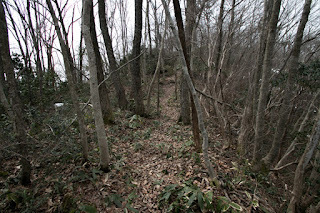 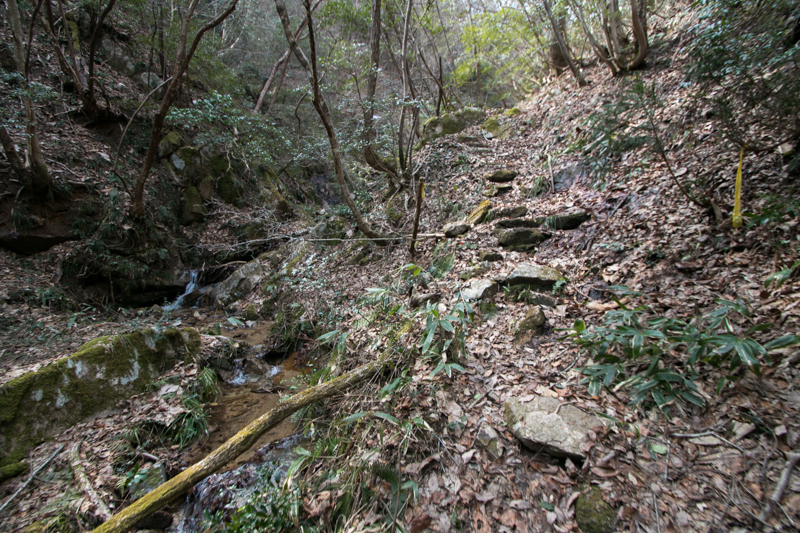 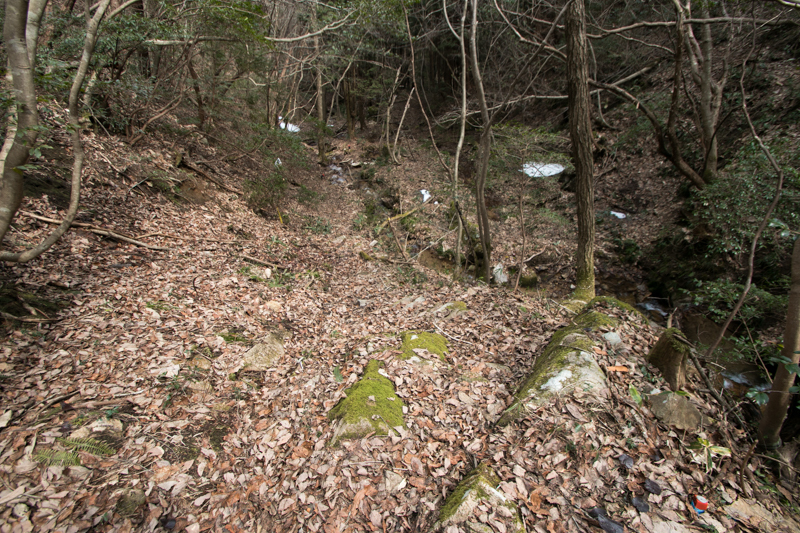 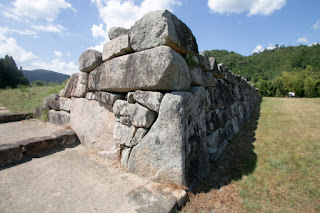 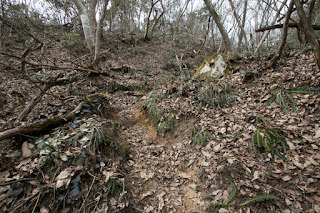 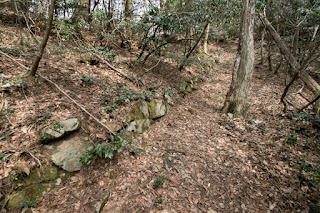 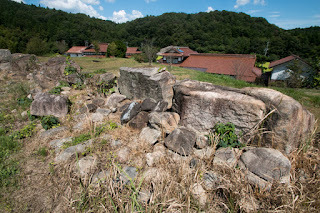 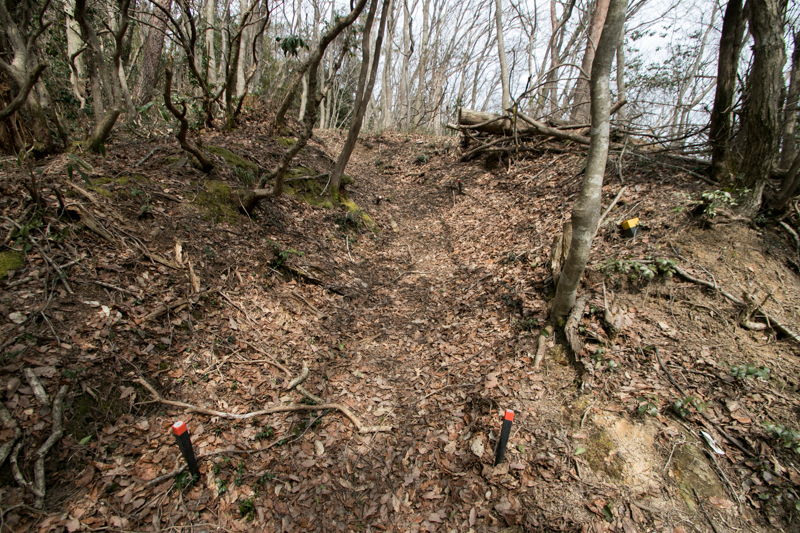 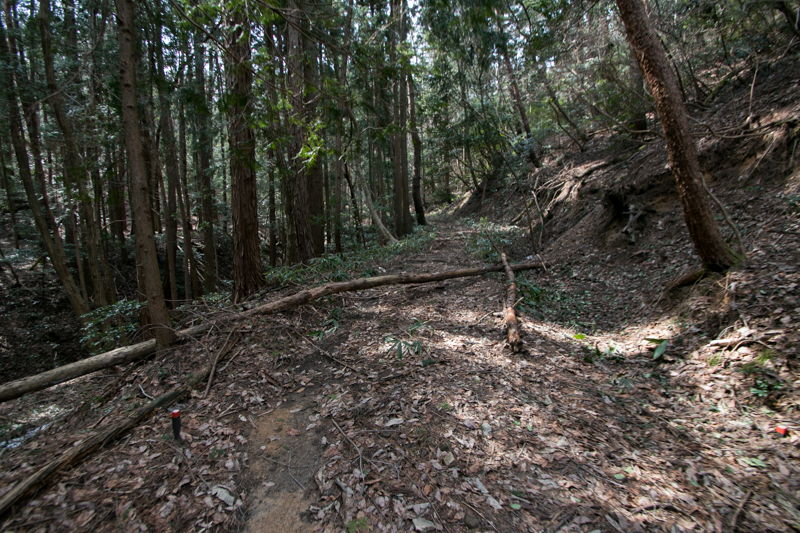 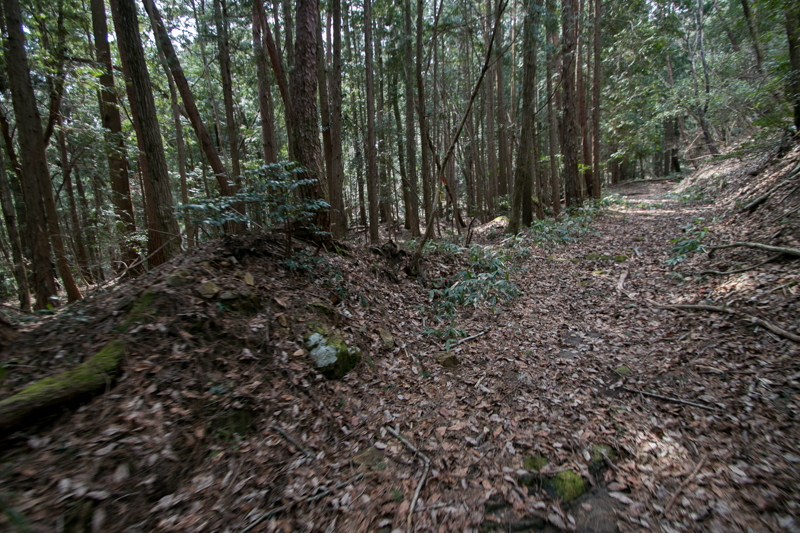 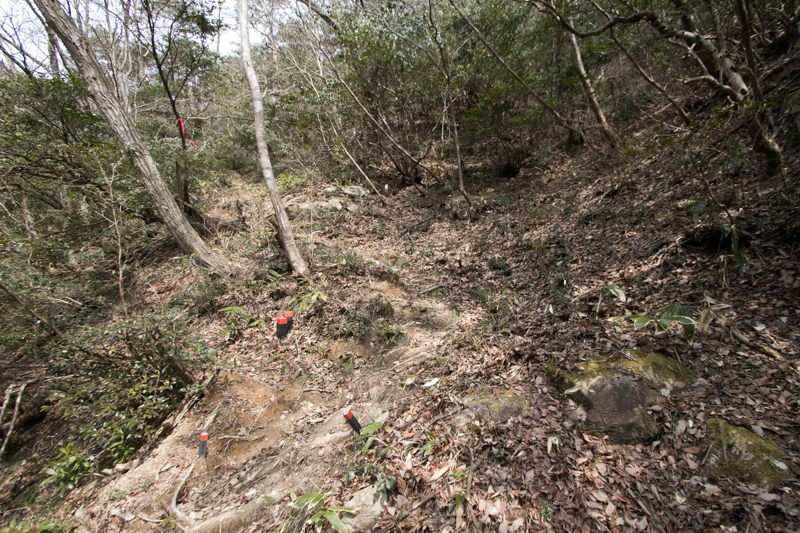 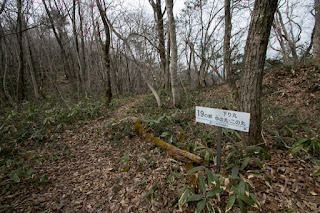 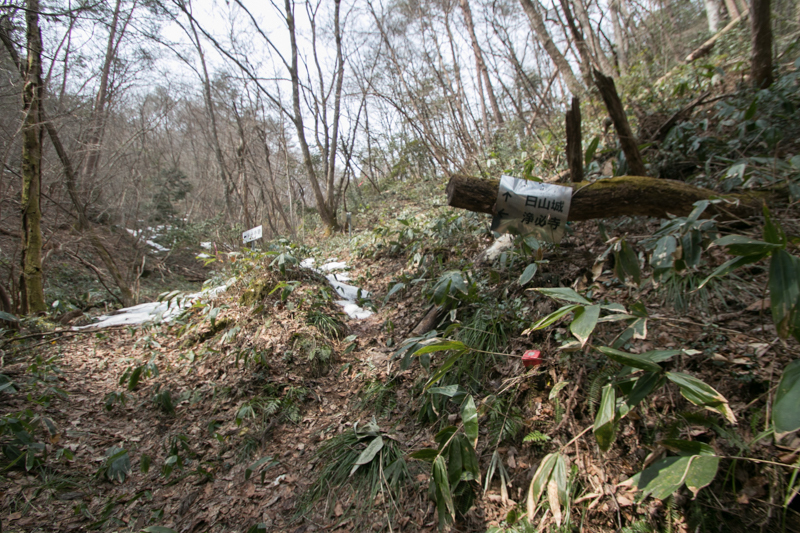 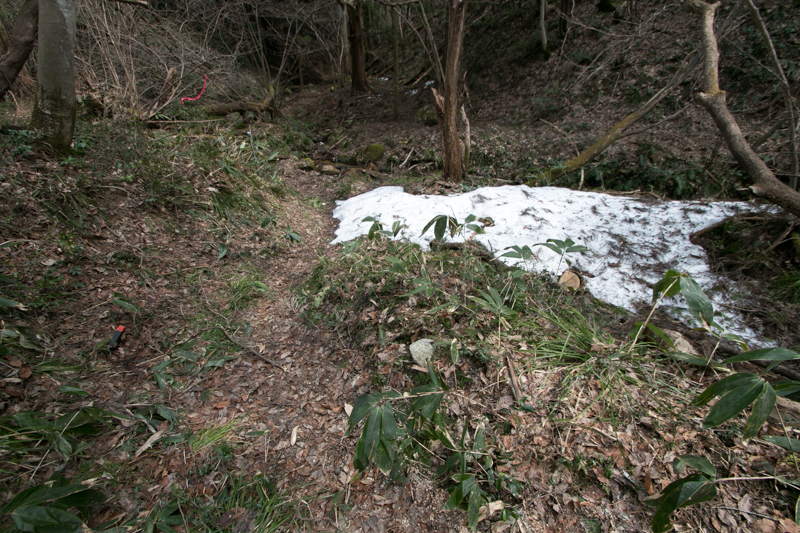 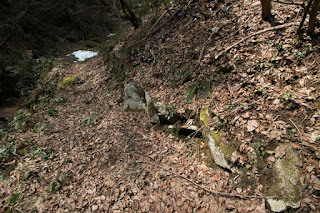 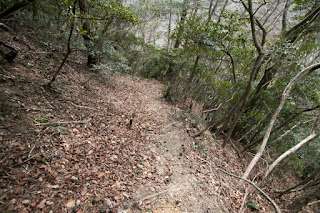 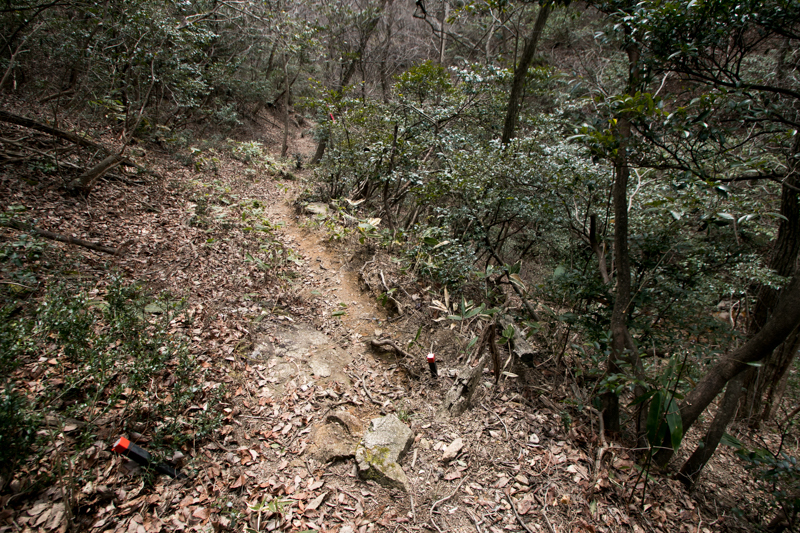 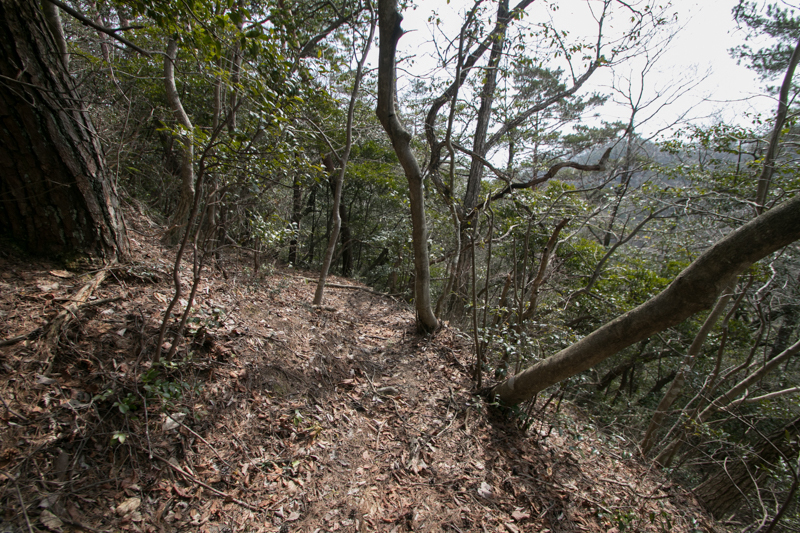 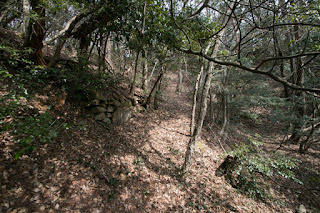 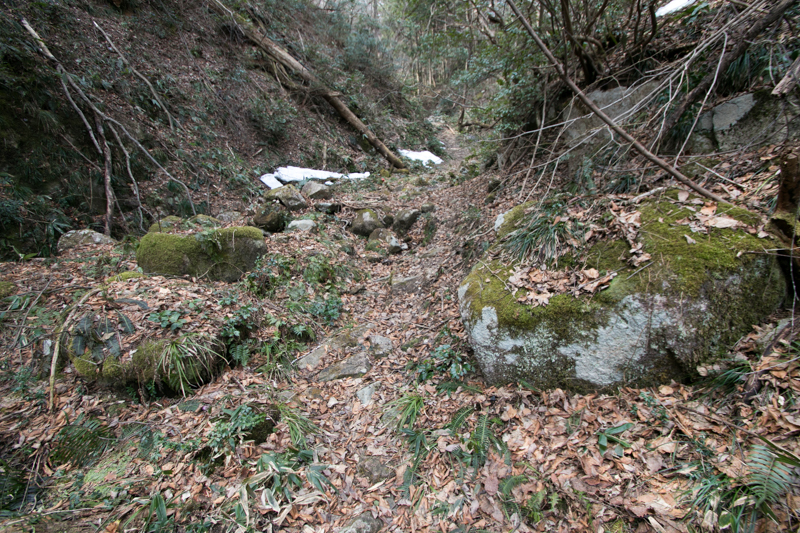 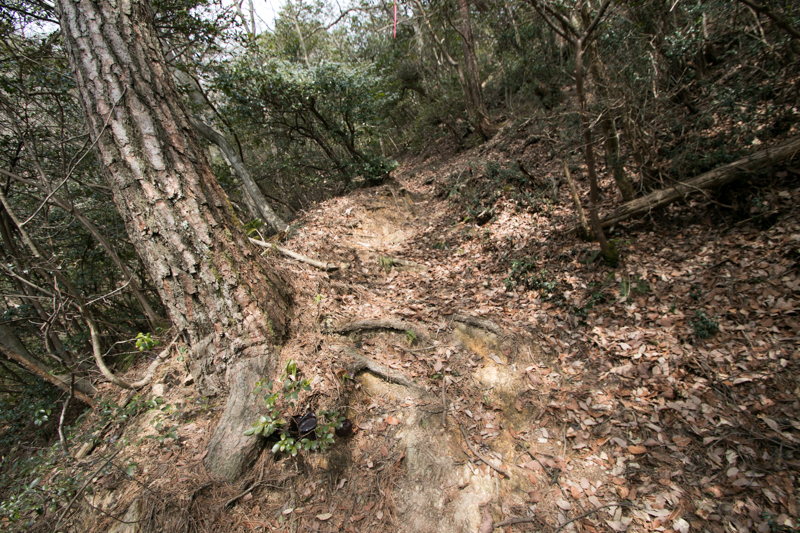 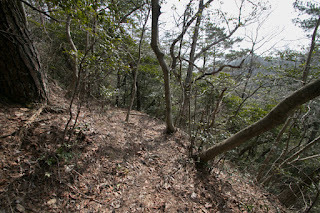 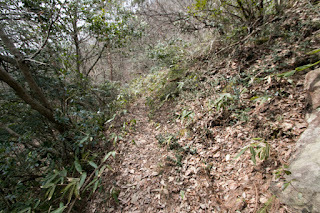 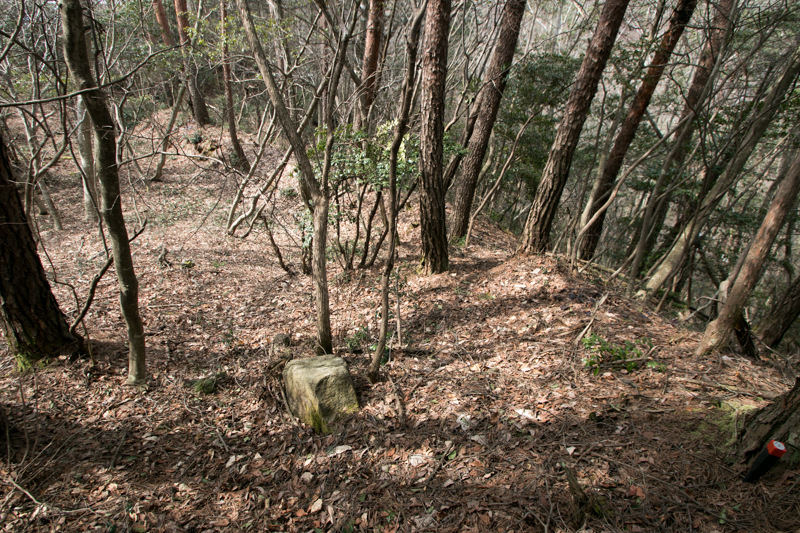 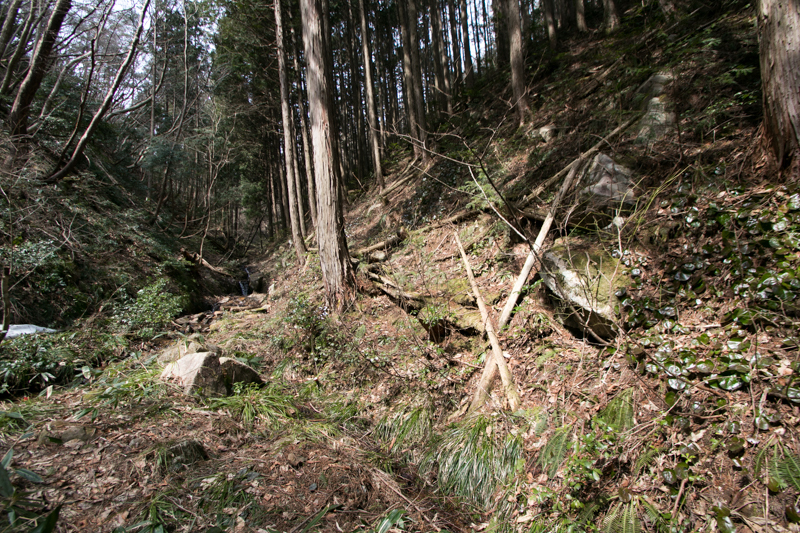 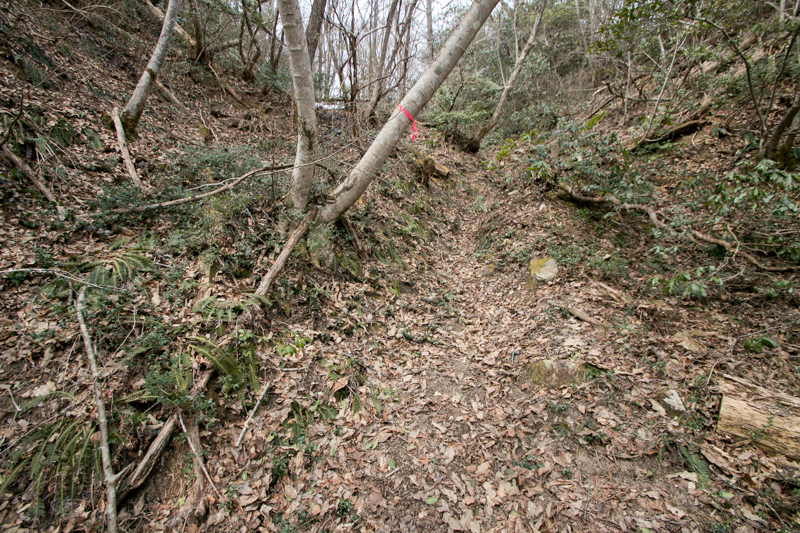 The path from Nakanomaru area toward central area was securely protected by stone walls. 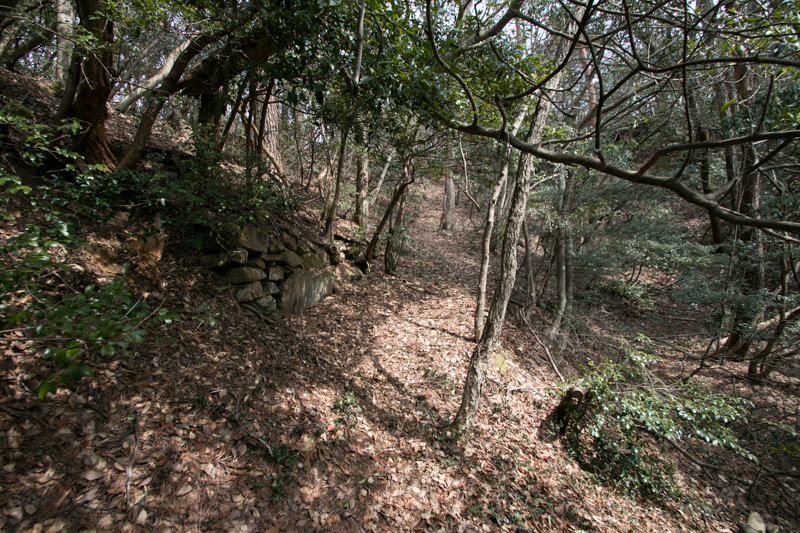 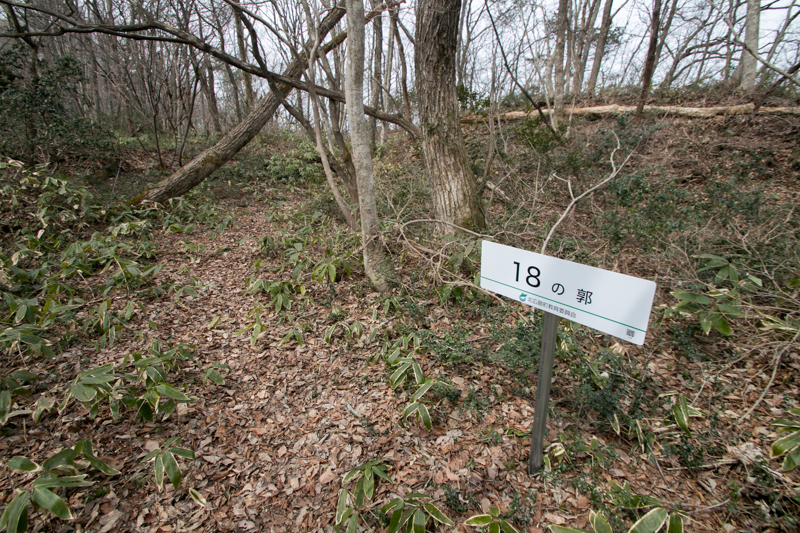 Under these areas, there are large Ikenomaru area, Daimon or Himejimaru area worked as a gate to upper area. 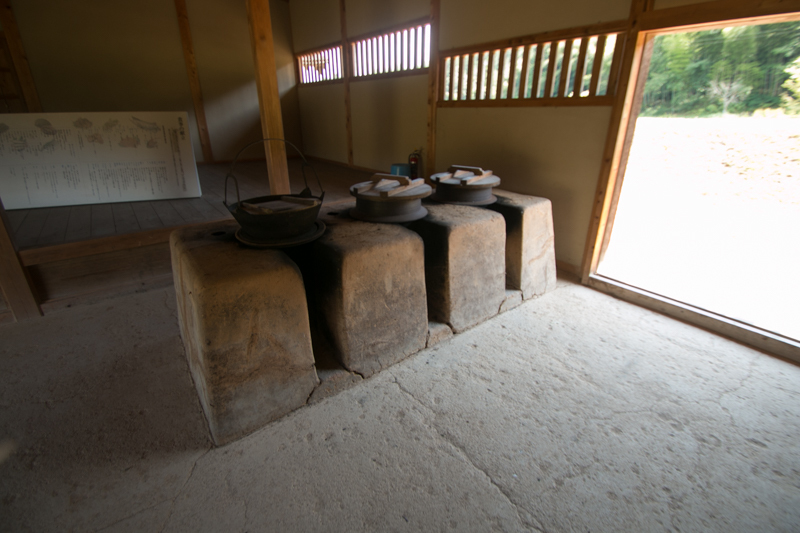 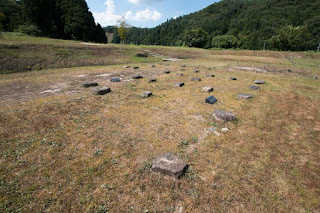 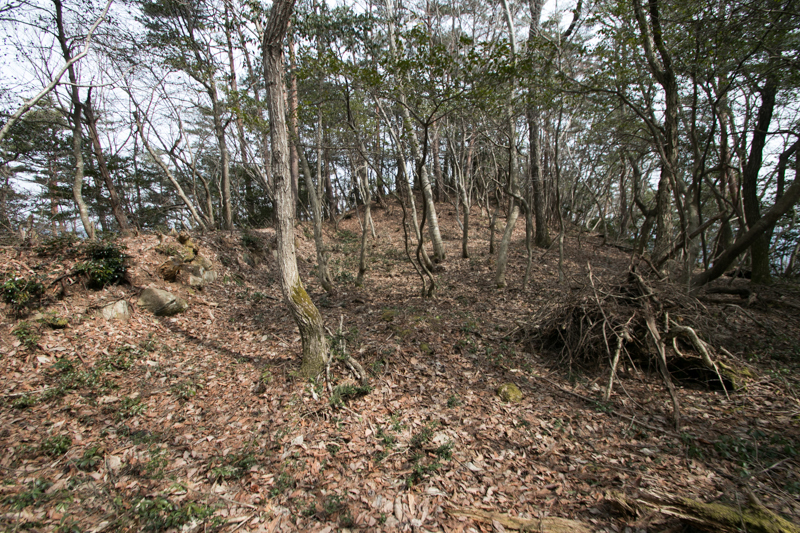 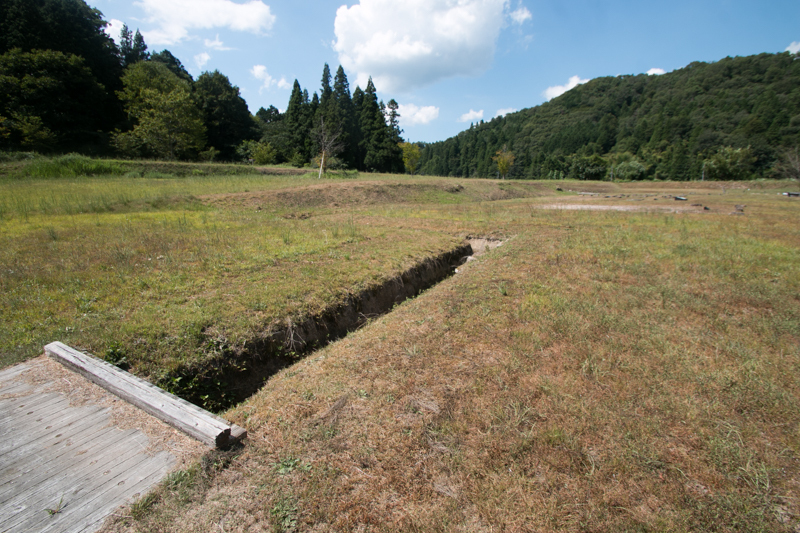 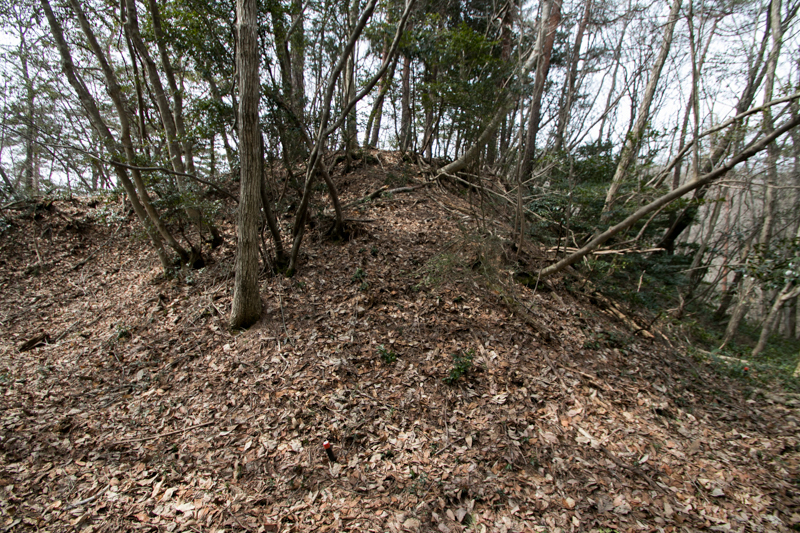 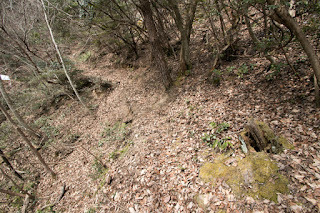 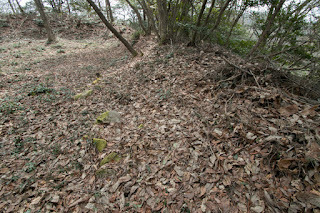 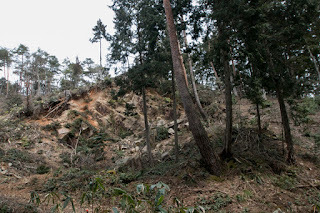 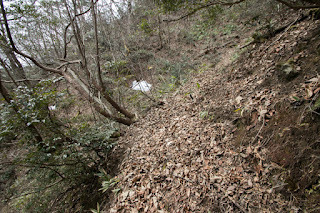 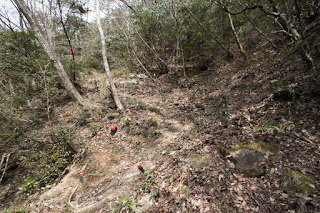 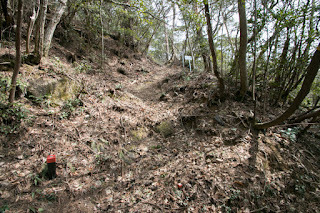 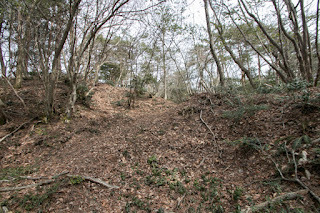 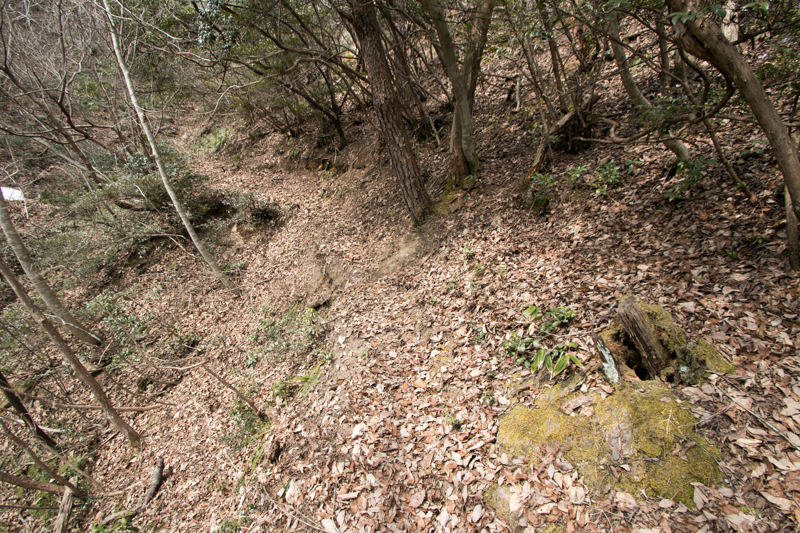 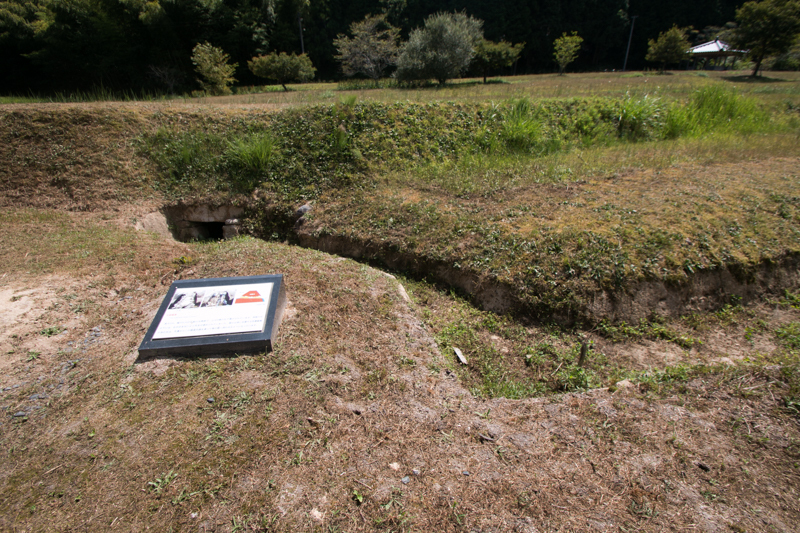 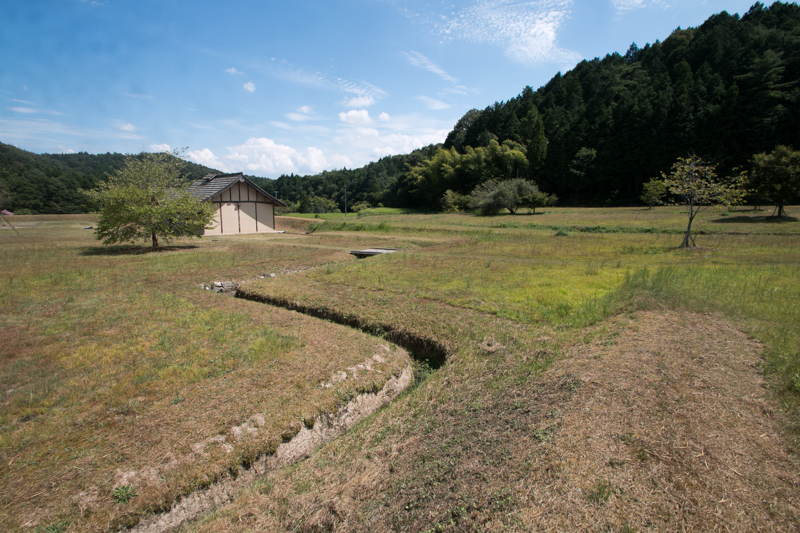 About 50 meter below from this layer, the fourth layer consist of terraces such as Komeguradan, Nakajo and Tsukiyama used as a residence of retainers or storage. 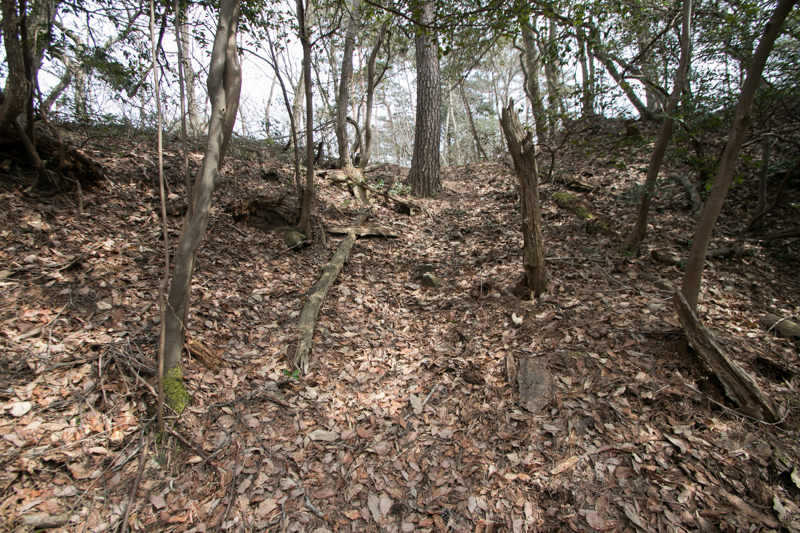 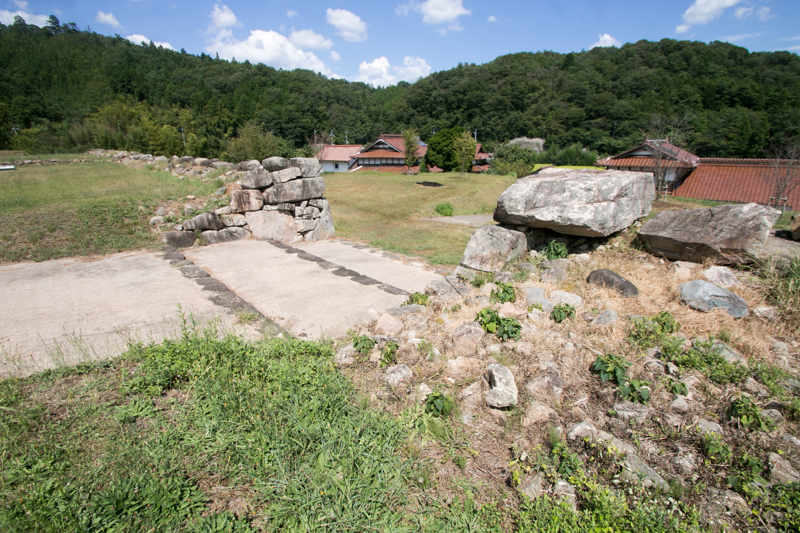 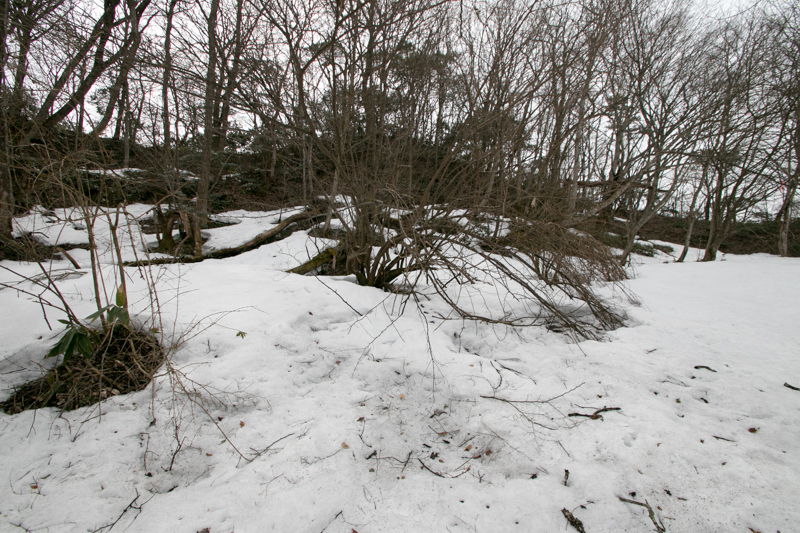 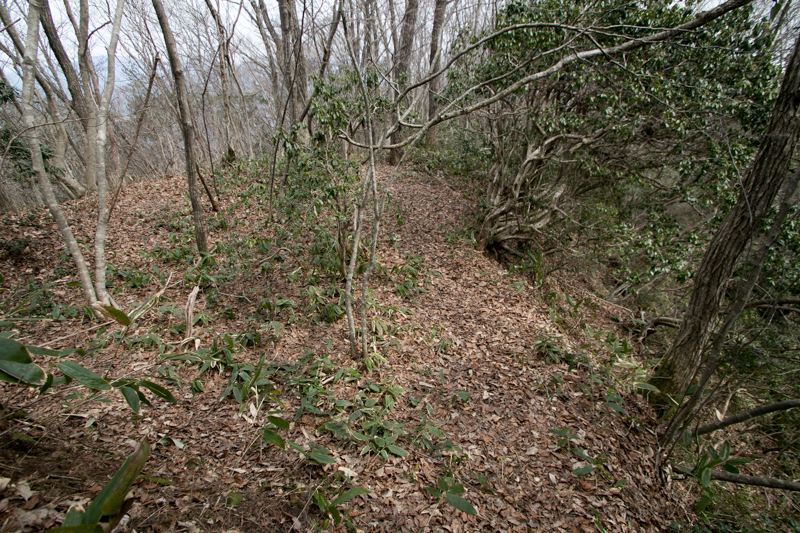 At the climbing route from mountain stream, several forts were build to guard the path. 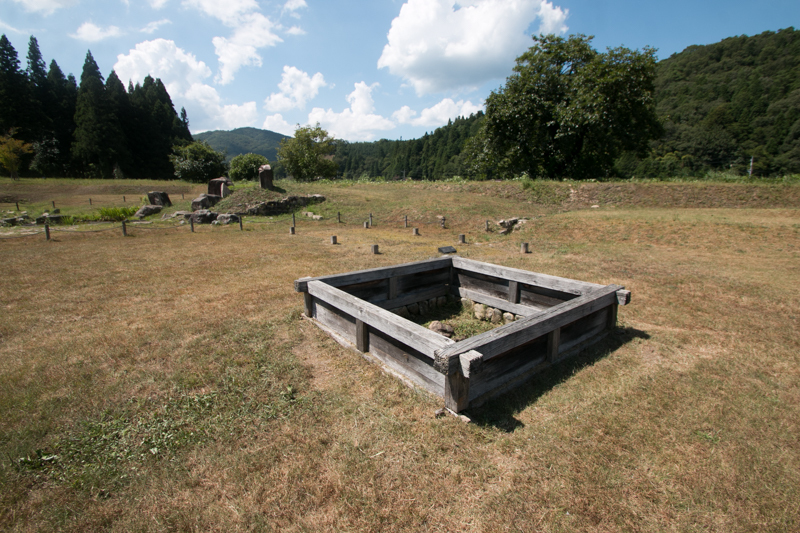 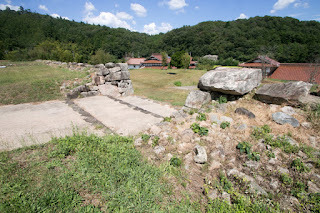 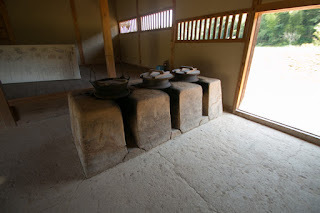 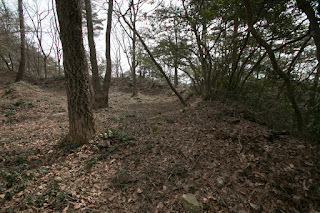 Around the castle, there are ruins of residences of retainers or temples, which worked front forts in case of emergency. 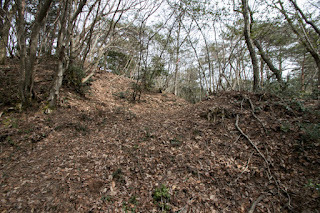 Total length of the castle reached to 800 meter long and 300 meter wide, and is one of the largest mountain castles in Aki province. 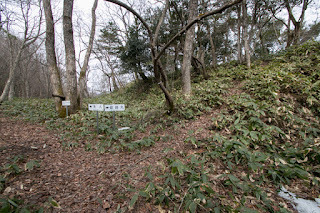 Moroharu Kikkawa was a brave general by nature. According to "Meisho Genko Roku", tales of lords and generals, when Motoharu and his younger brother Takakage Kobayakawa (1533-1597) played in youth, Motoharu tried to beat Takakage by power and Takakage rallied to this by plot. 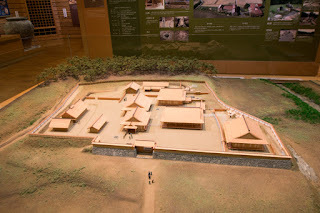 Seeing this, their father Motonari to place Motoharu northward to cope with strong Amago clan, and send Takakage to the south where with no strong enemy but needed coordination with naval clans. Since the succession of Kikkawa clan, Motoharu kept fighting against strong enemies for Mouri clan. 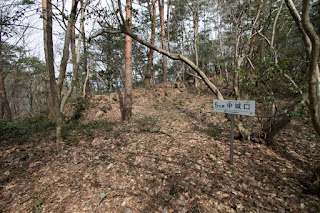 In 1555, at the battle of Itsukushima against Harukata Sue (1521-1555), Moroharu bravely fought as a part of main force against dominant Sue army and broke it. 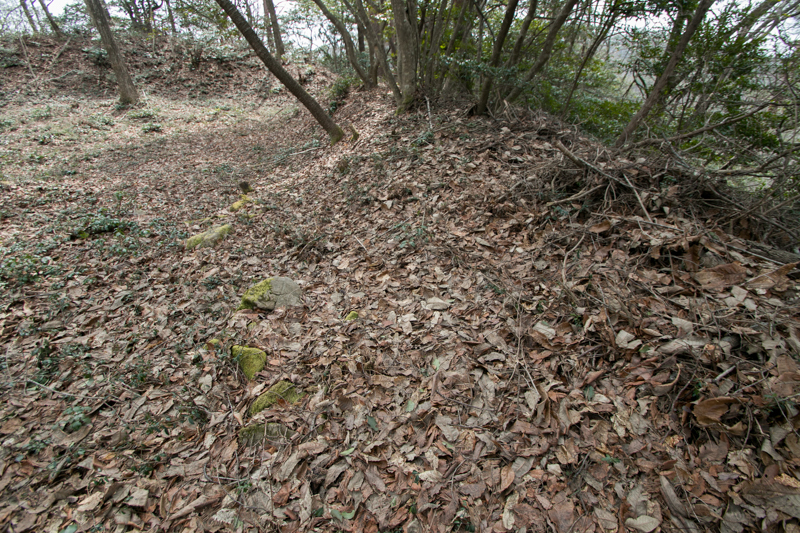 In 1566, after three year campaign, Mouri clan finally ruined Amago clan besieged at their main base Gassan Toda castle (Shimane prefecture). 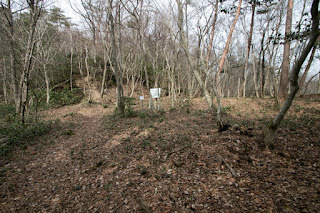 Motoharu became the commander of Sanin region and rejected the attack of Amago clan restoration army lead by Yukimori Yamanaka (1545-1578) in 1571. 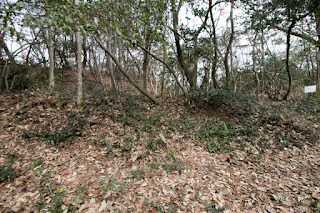 Motoharu had a good record of battles and is said that won 64 of 76 battles during whole like. Motoharu worked as a military pillar of Mouri clan and contributed to the growth of the clan, along with Takakage Kobayakawa as an intellectual pillar. At the same time, Motoharu was familiar with culture and literature, and Motoharu transcribed 40 books of Taiheiki, a long military tales of Nanbokucho era, by himself at the siege of Gassan Toda castle. 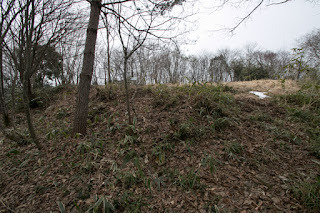 When Moronari Mouri died in ill in 1571, as Takamoto Mouri (1523-1563) who was the eldest son of Motonari and elder brother of Motoharu and Takakage, already died in youth, Motoharu and Takakage supported Terumoto Mouri (1553-1625), the son of Terumoto. 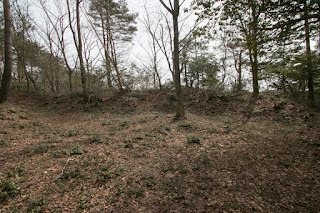 Motoharu fought at various place, and in 1578 Motoharu fell Kouzuki castle which was protected by remaining Amago restoration army under central ruler Nobunaga Oda (1534-1582). This was the peak time of Mouri clan. However, at that time, Nobunaga Oda appointed his general Hideyoshi Hashiba (1537-1598, later Hideyoshi Toyotomi) as the commander of Chugoku region and started his campaign against Mouri clan. 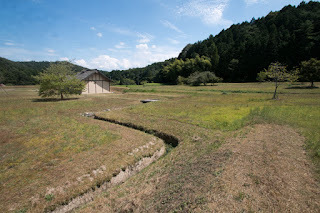 At first Hideyoshi was inferior to Mouri clan, but by his charm and plot, Hideyoshi turned local retainers under Oda side and gradually expanded into Mouri territory. In Sanin region, Hideyoshi captured Tajima province (north part of Hyogo prefecture) by 1580, and next year Hideyoshi fell Tottori castle (Tottori prefecture) by cutting supply. 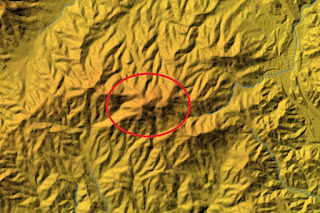 In 1582, Hideyoshi intruded into Bicchu province (middle part of Okayama prefecture), encircled Bicchu Takamatsu castle and made a flood attack. 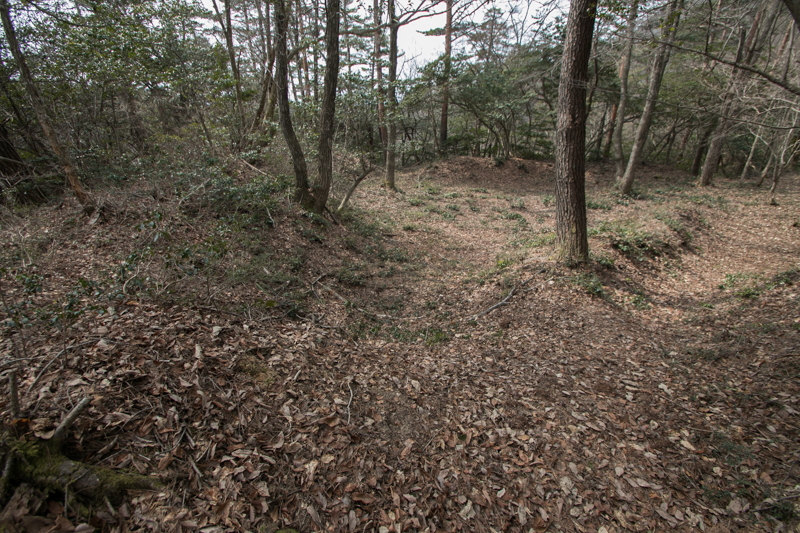 Mouri army including Motoharu marched near castle as reinforcement, but they could not rescue the sunk castle. 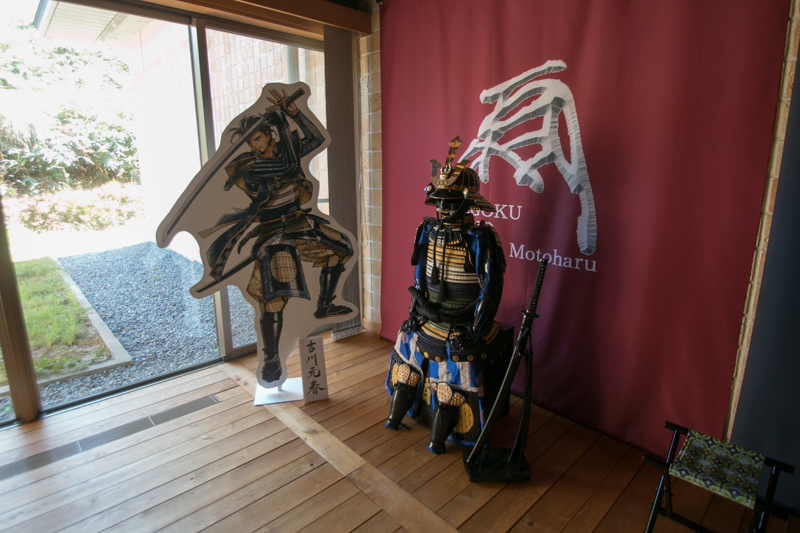 Furthermore, Nobunaga decided to depart with his main force as a reinforcement to Hideyoshi, and Mouri clan was forced to the corner. 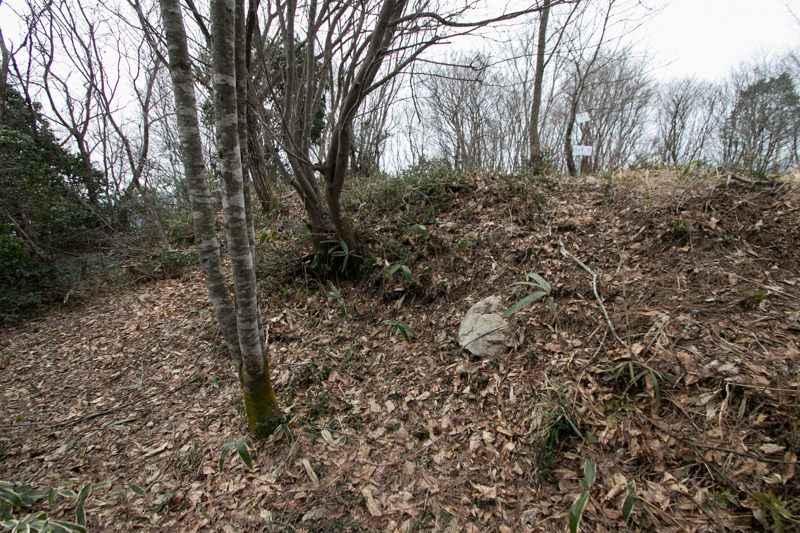 But at that time, Nobunaga was killed at the incident of Honnoji, a coup d'etat by his general Mitsuhide Akechi (1521-1582). Hideyoshi knew this incident quickly made peace with Mouri clan concealing the death of his master, then Hideyoshi quickly turned his army to Kinki region and broke Mitsuhide. Motoharu knew this news insisted to attack Hideyoshi from backside but Takakage stopped this then Mouri clan subordinated to Hideyoshi who became the successor of Nobunaga. 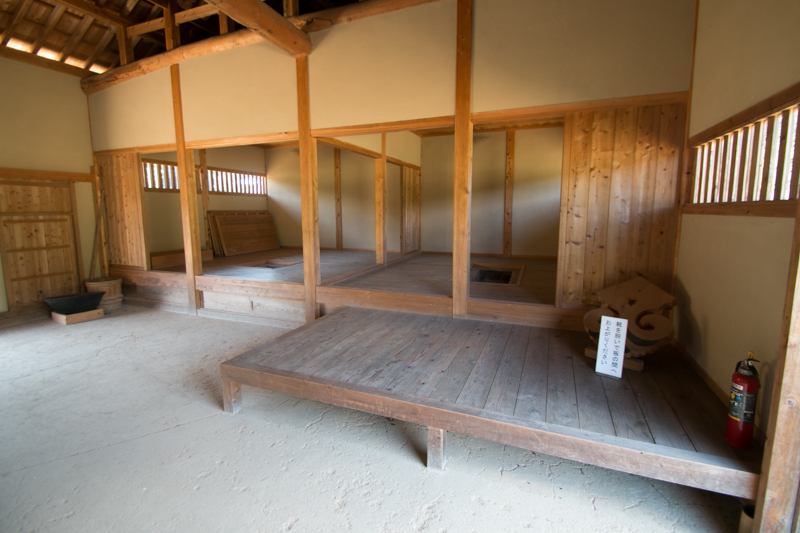 In 1582, Motoharu gave the leader position to his son Motonaga Kikkawa (1548-1587) and retired. Hideyoshi though important of Takakage Kobayakawa because of his intelligence and connection to naval clans at Setonaikai Sea, but not so familiar with Motoharu. 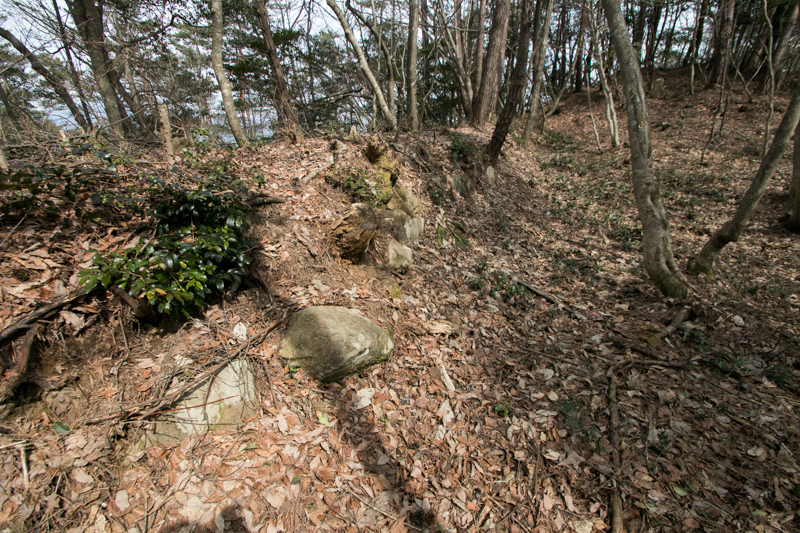 Motoharu built his retirement residence having magnificent stone walls at the backside of Hinoyama castle. 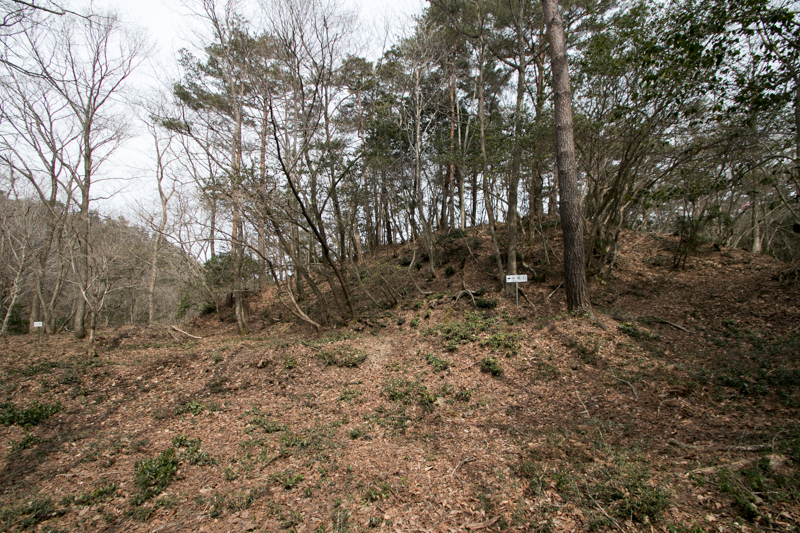 In 1591, after the death of Motoharu, his grandson Hiroie Kikkawa (1561-1625) who became the leader of Kikkawa clan moved their residence to Gassan Toda castle, then Hinoyama castle was abolished. 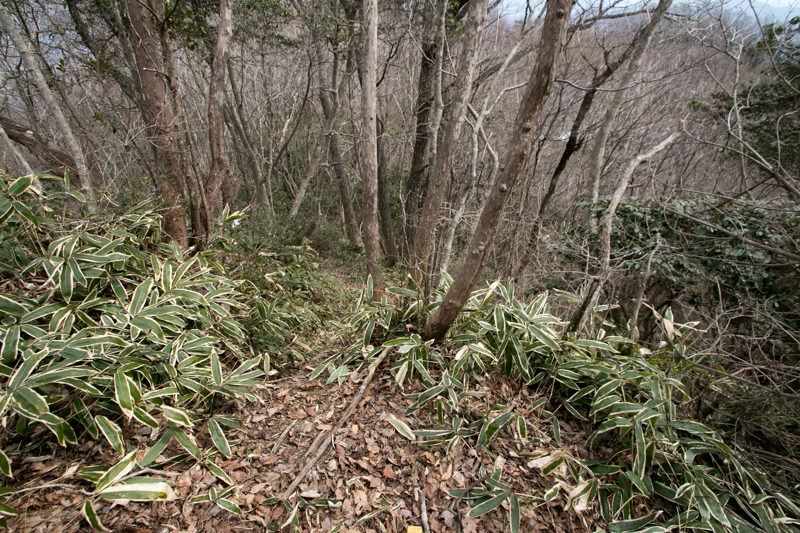 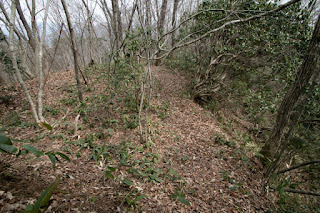 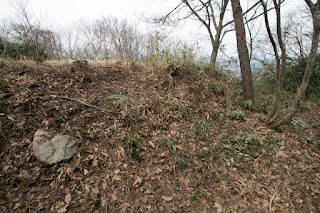 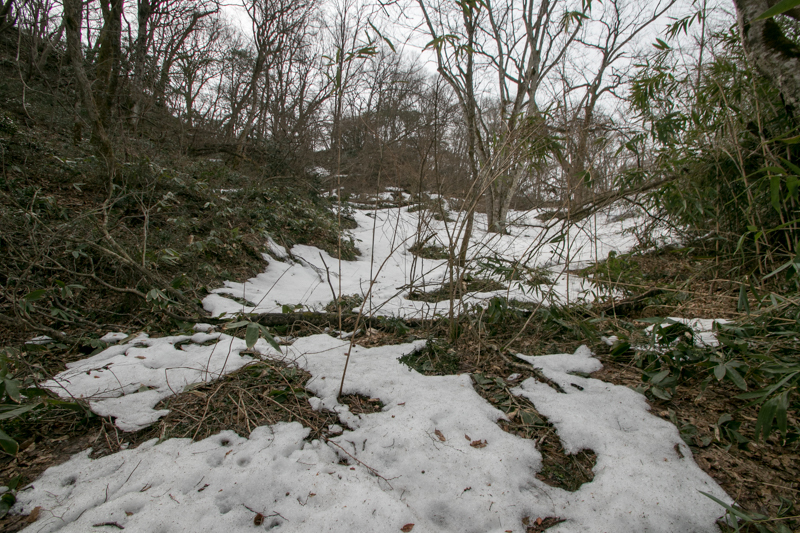 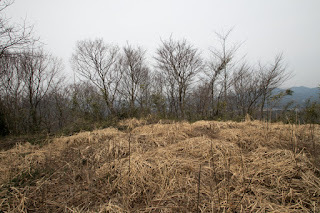 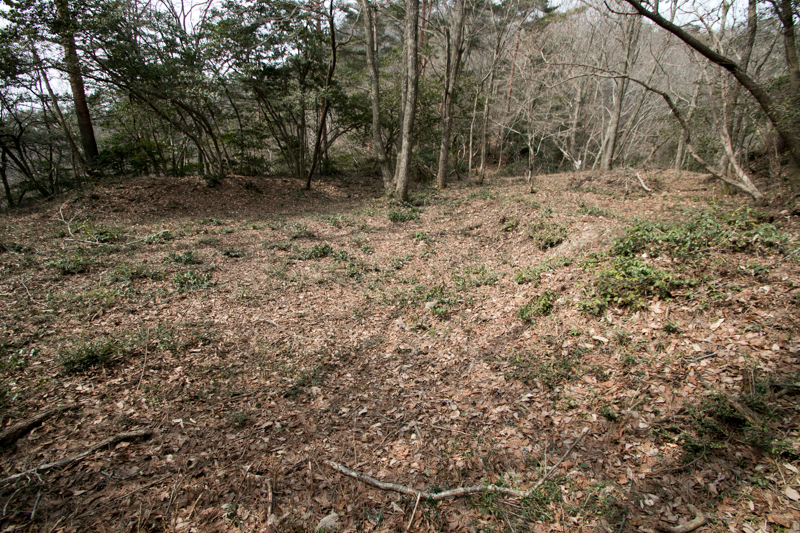 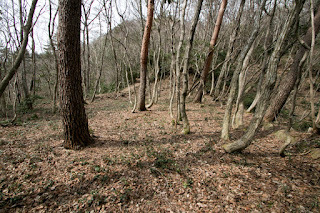 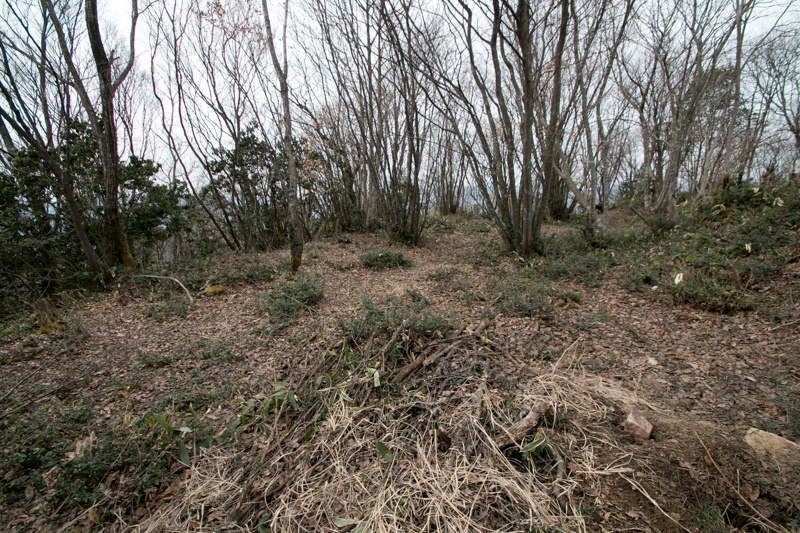 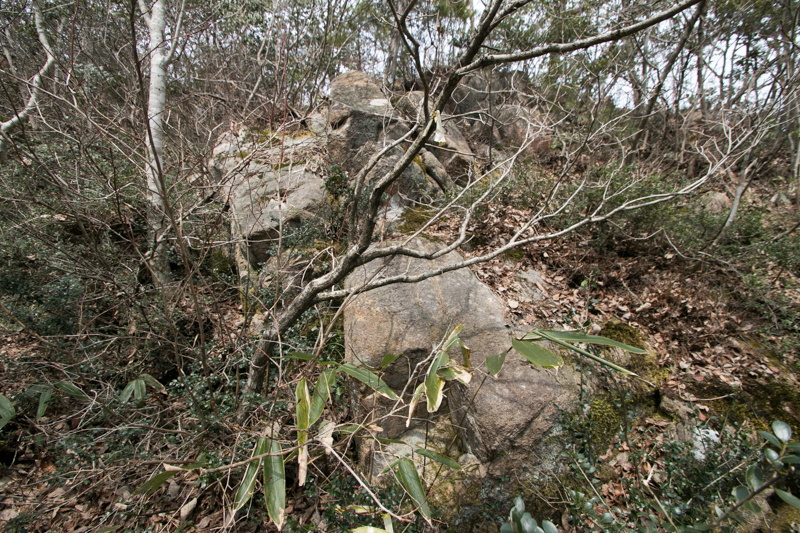 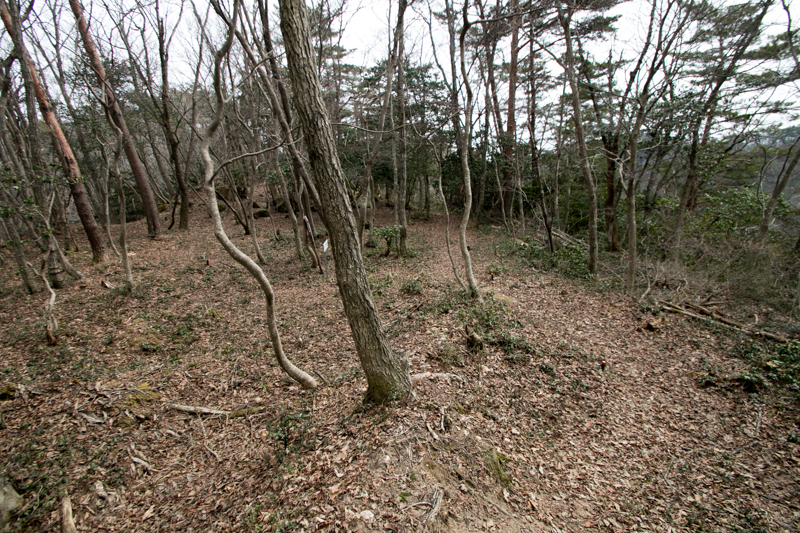 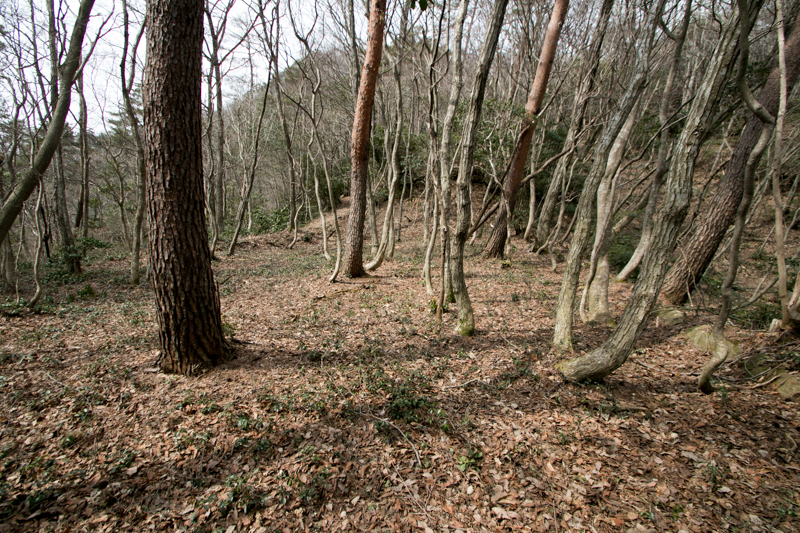 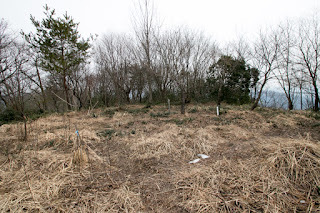 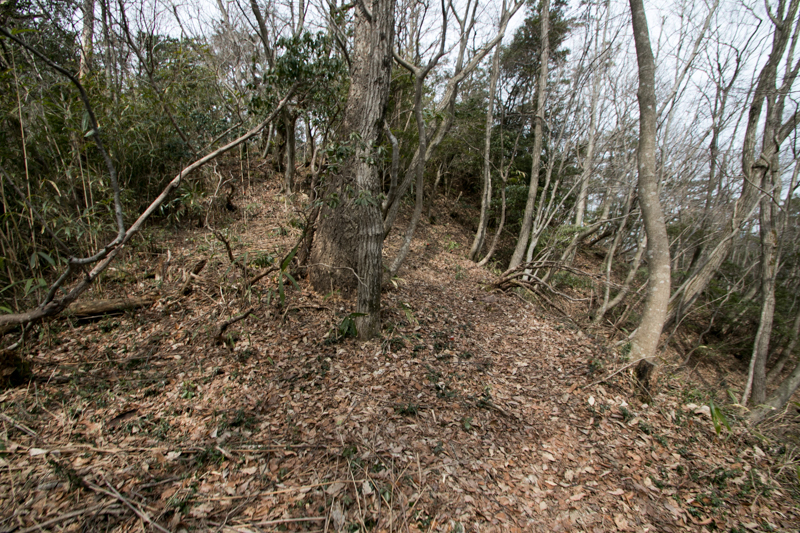 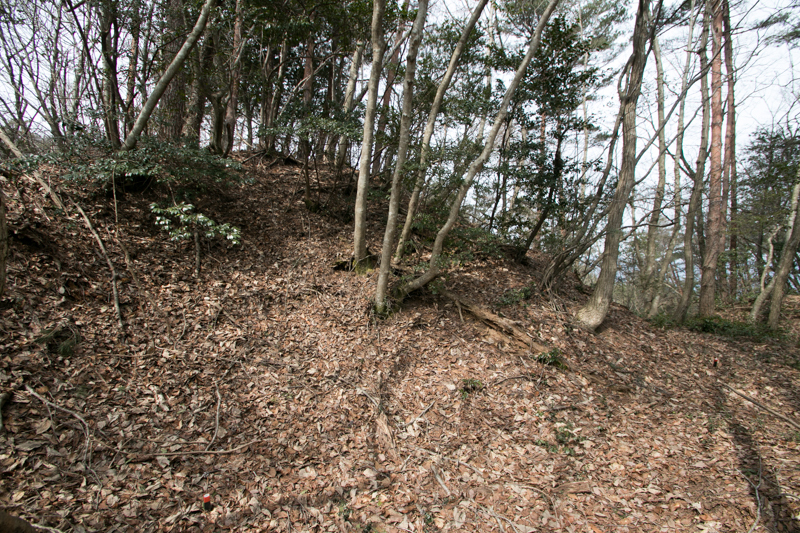 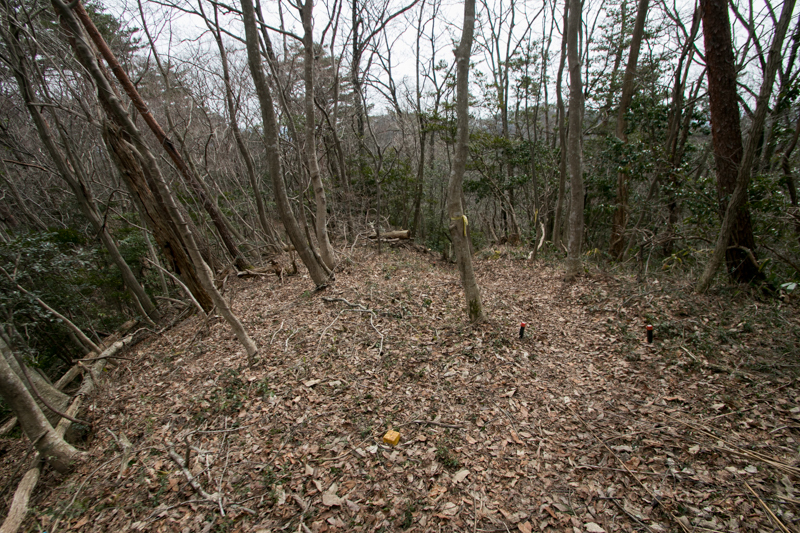 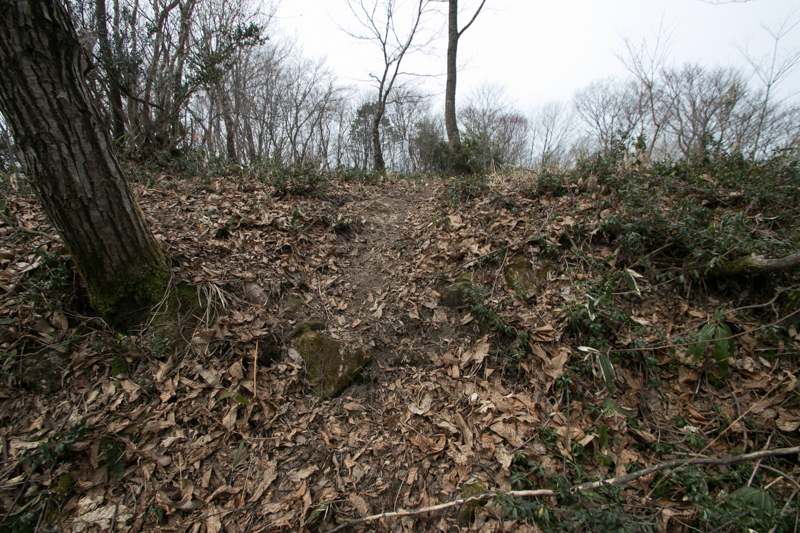 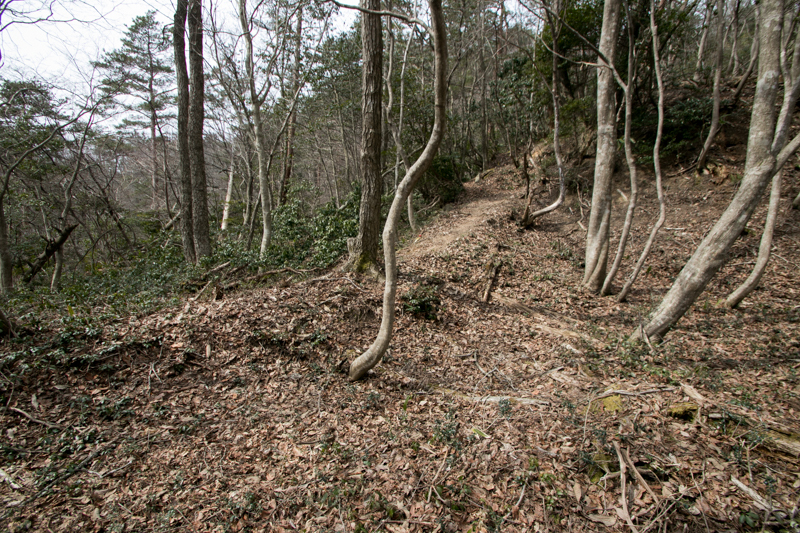 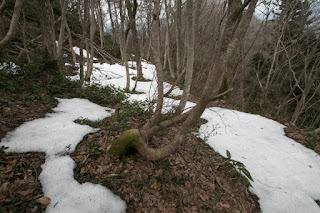 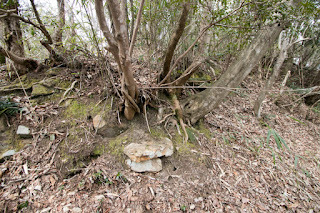 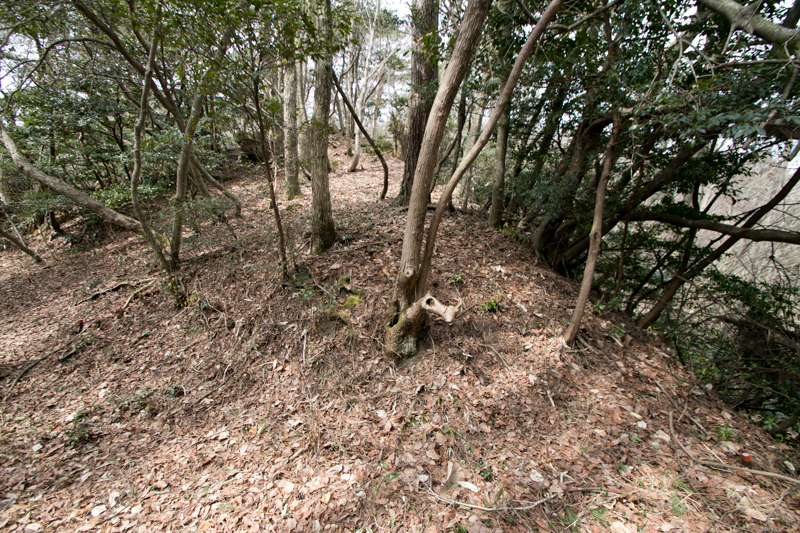 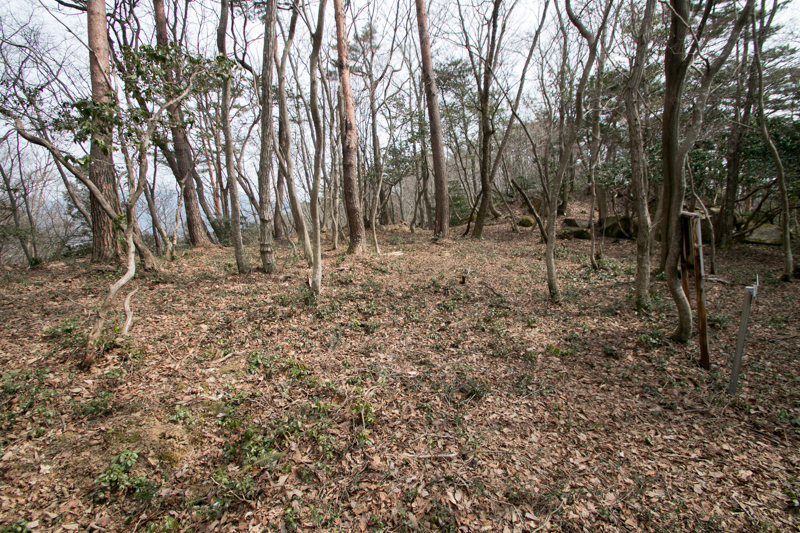 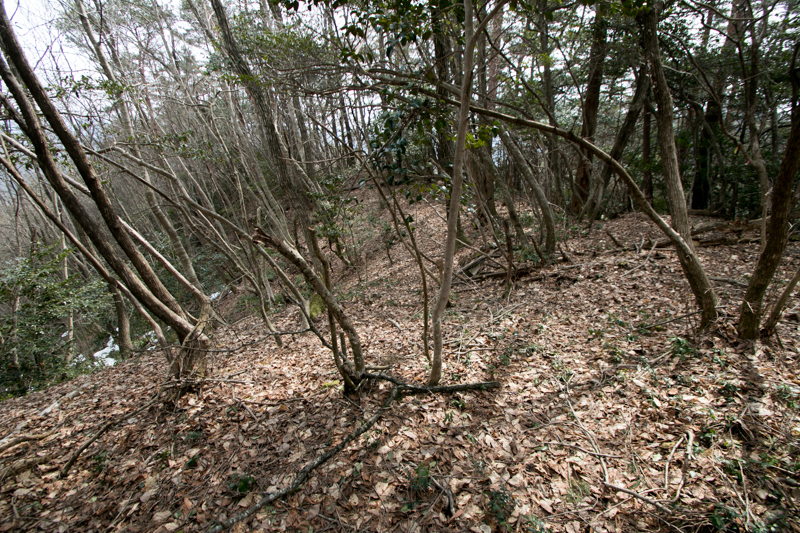 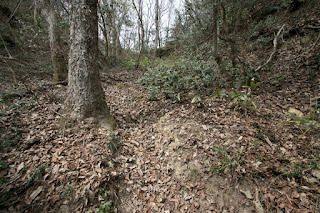 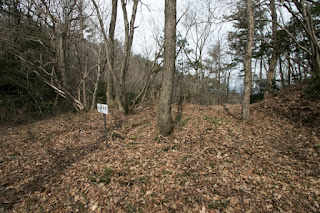 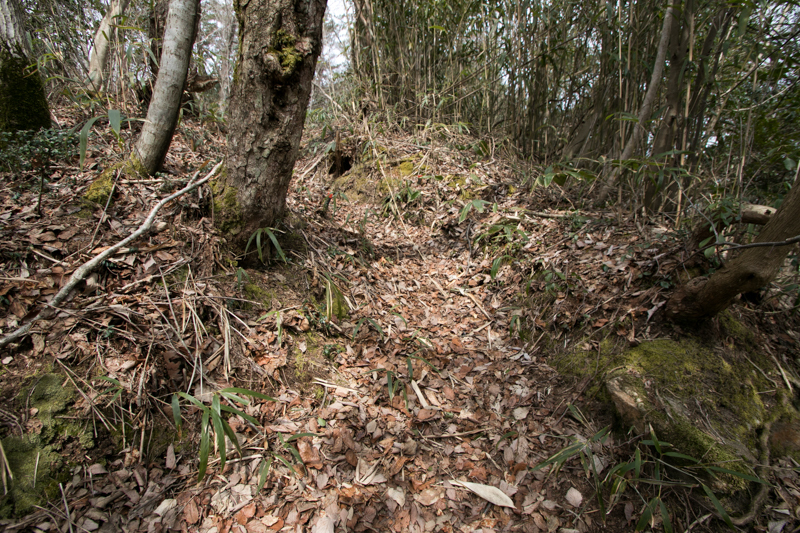 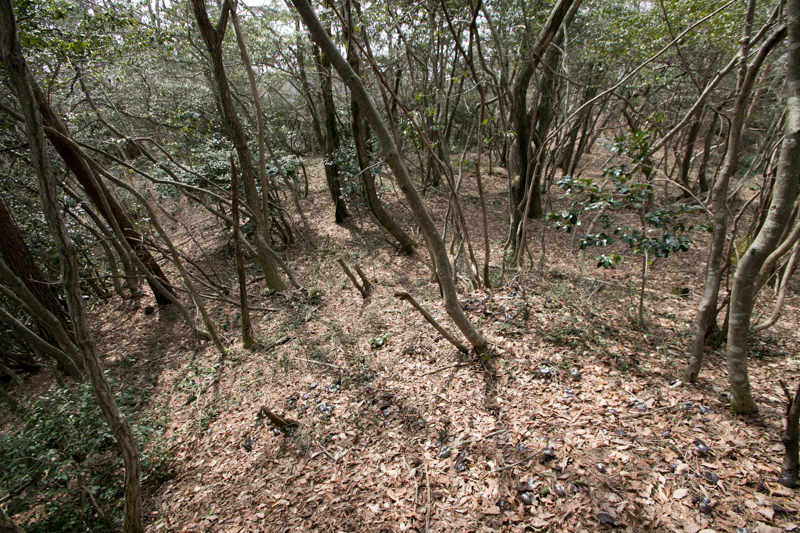 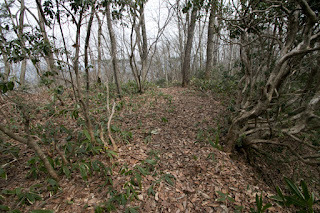 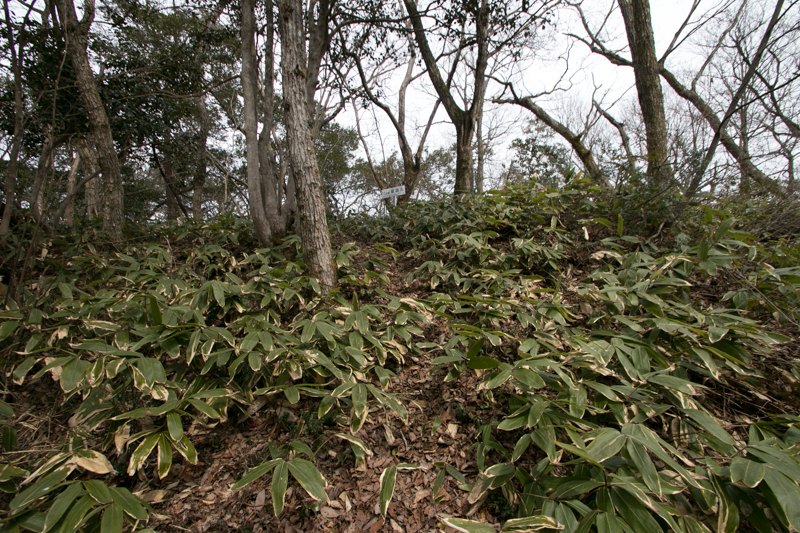 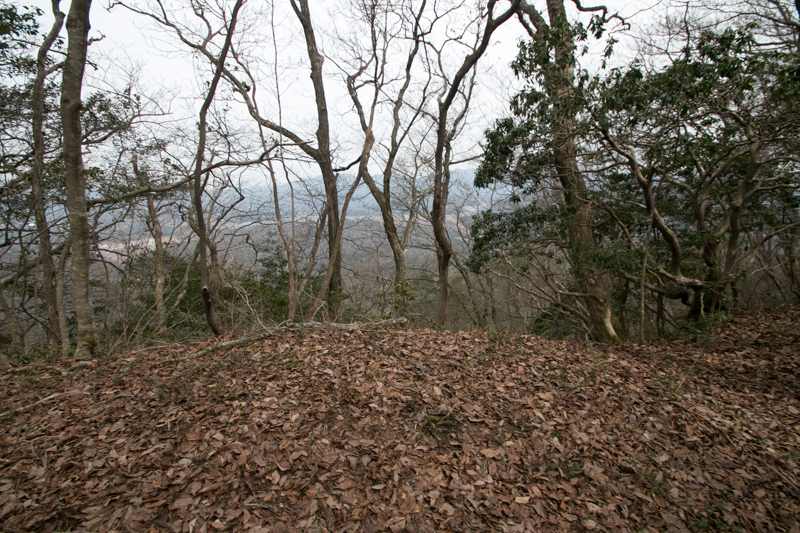 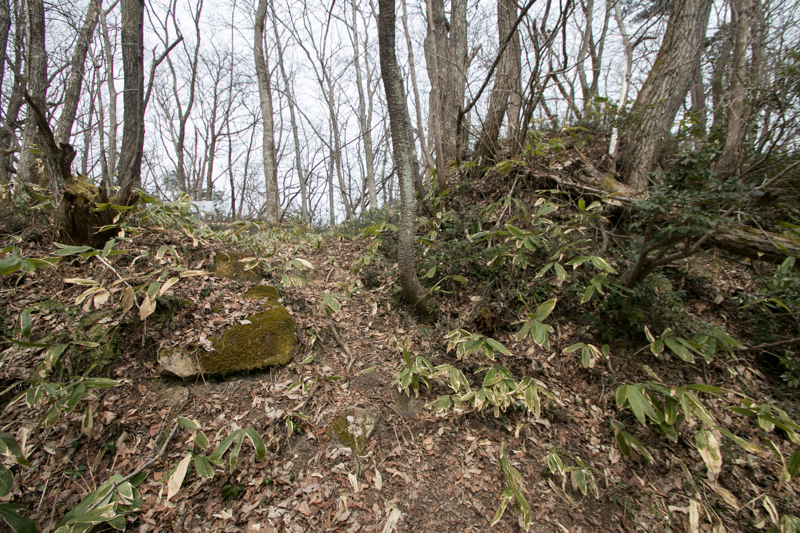 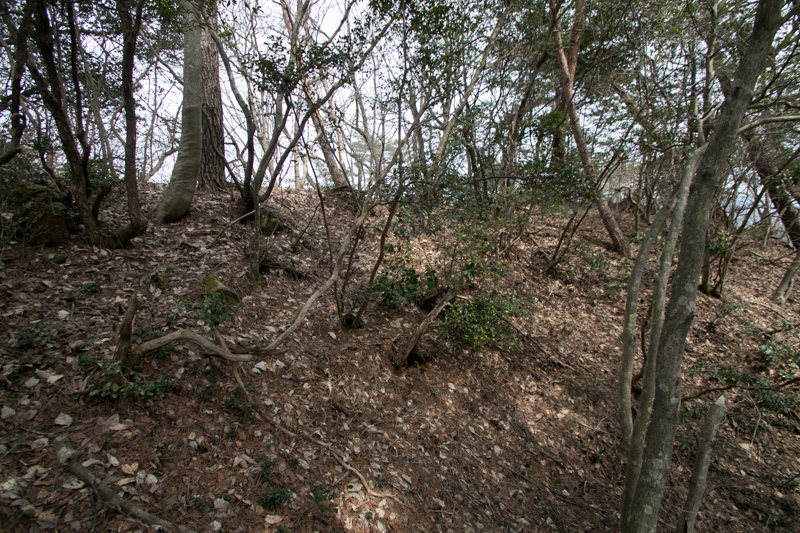 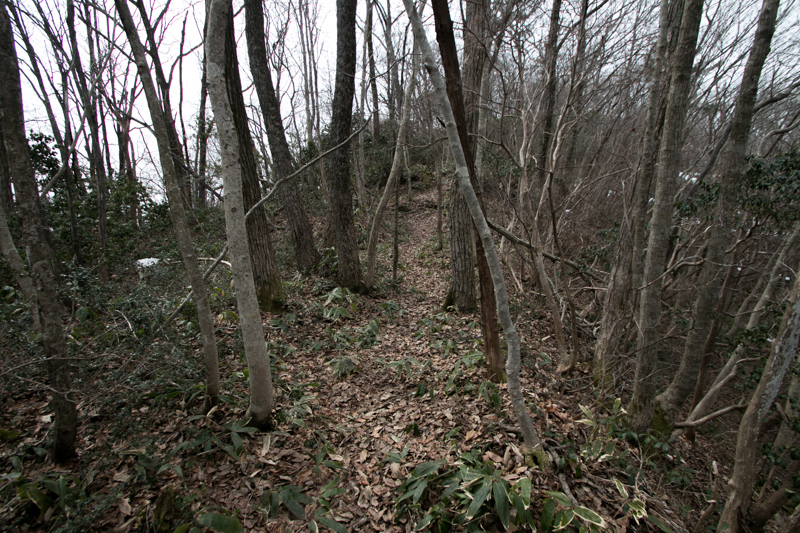 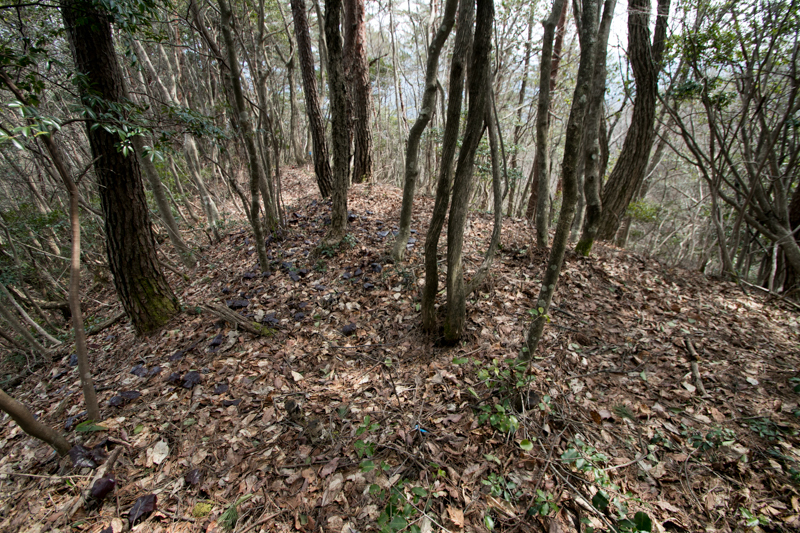 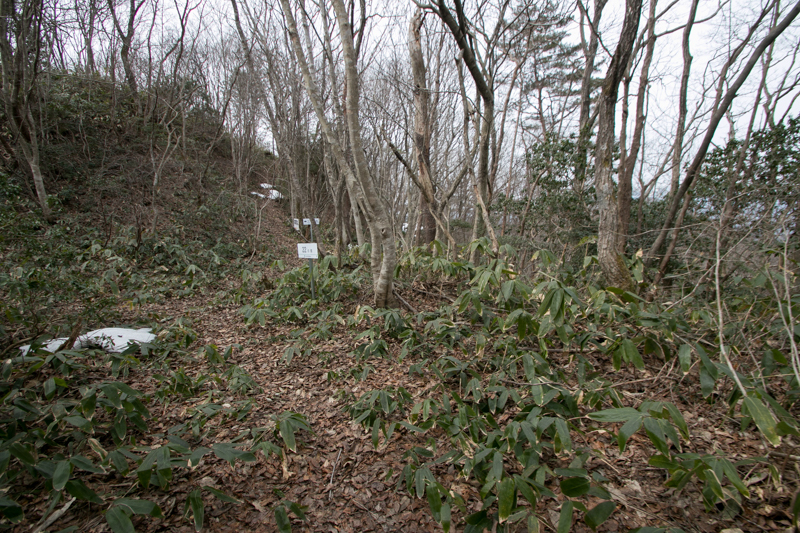 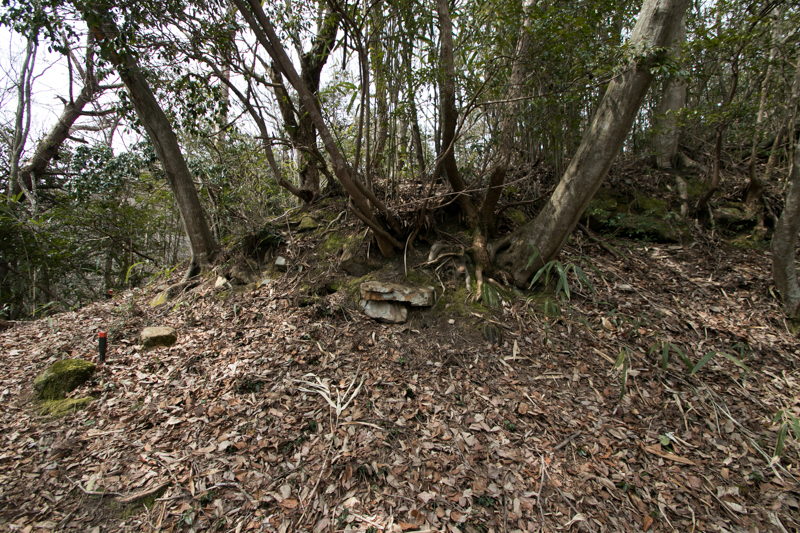 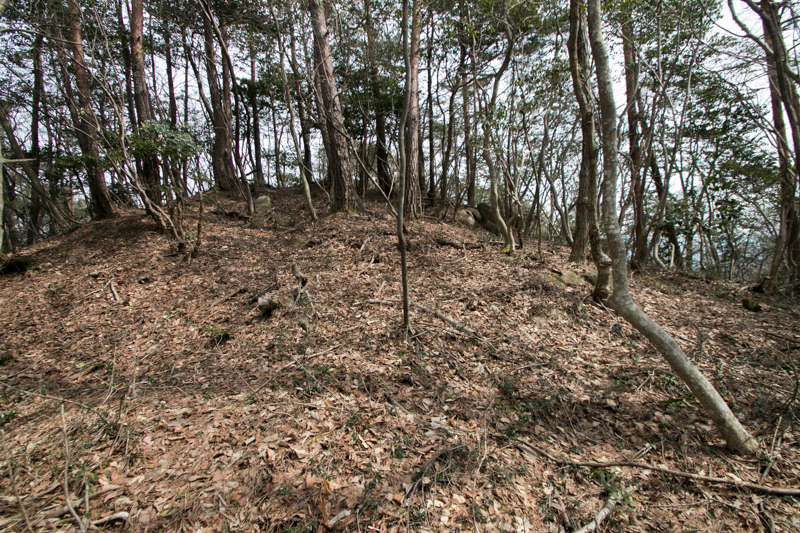 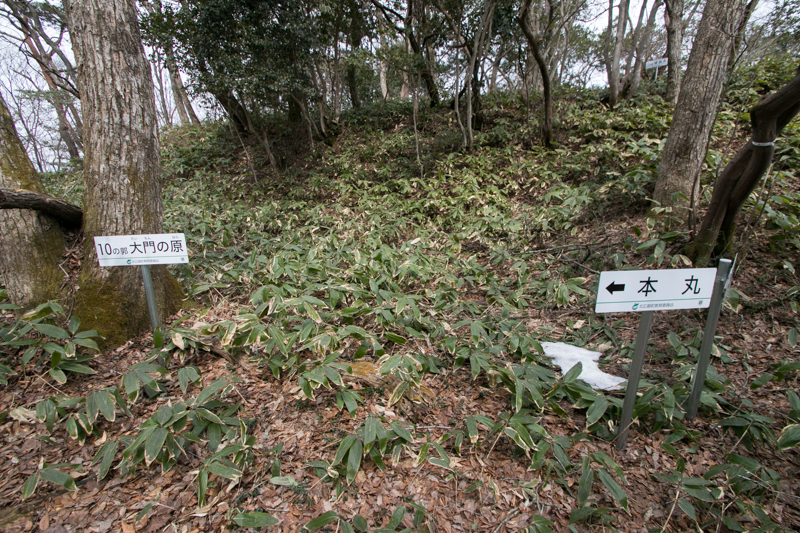 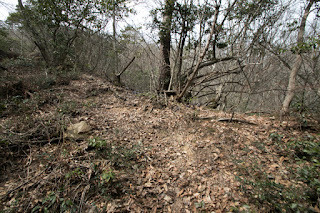 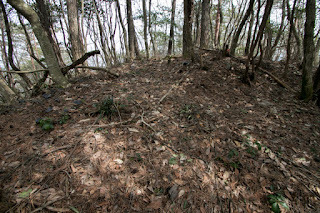 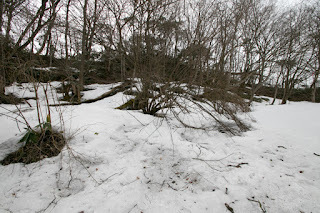 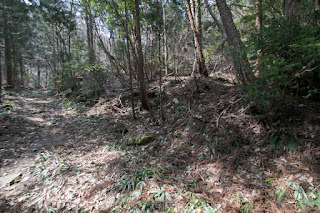 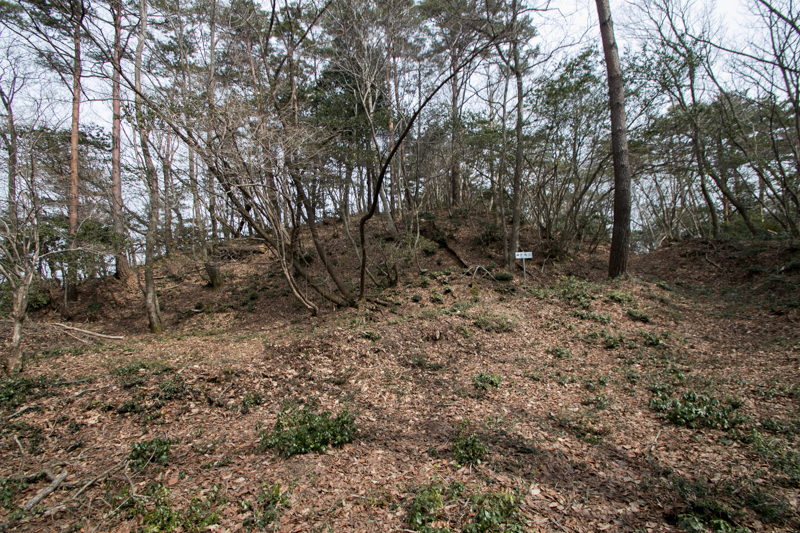 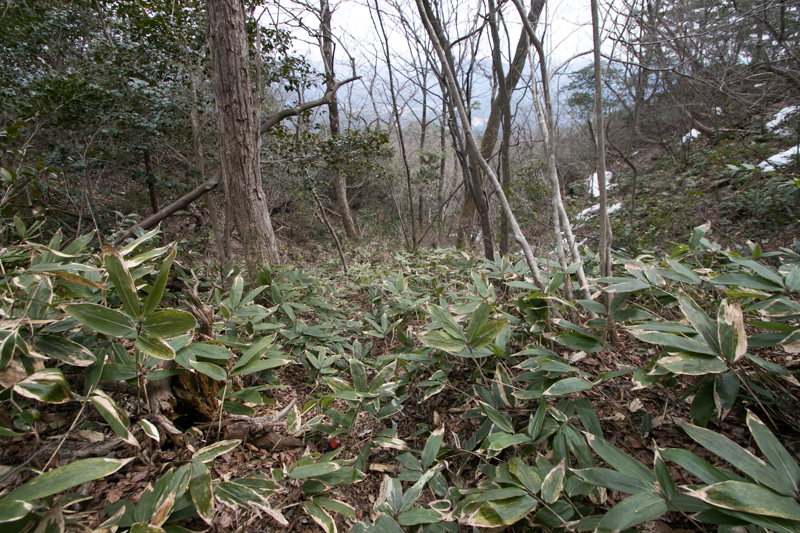 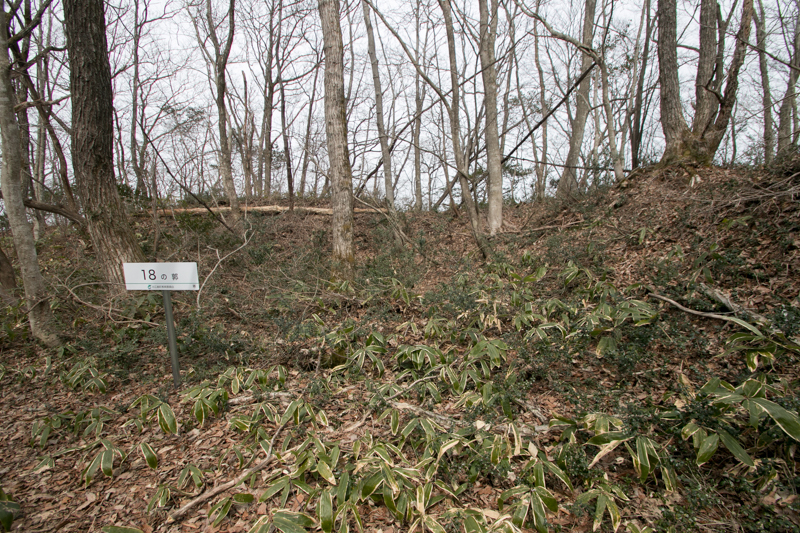 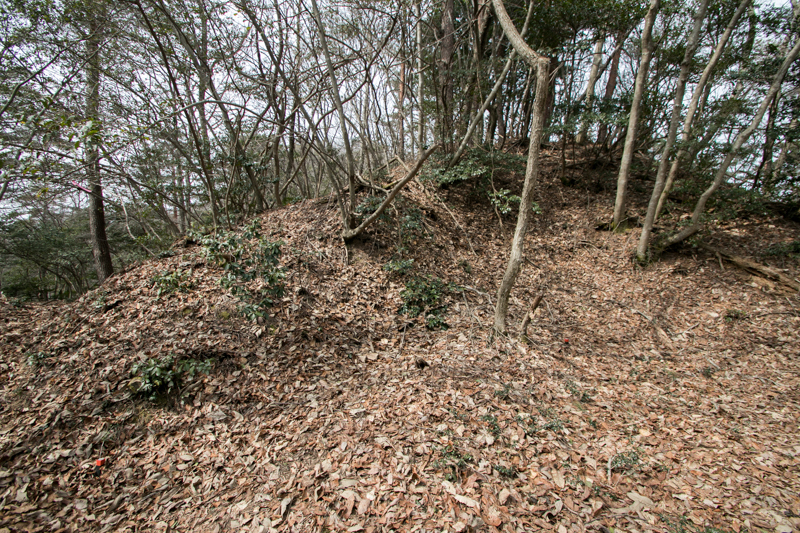 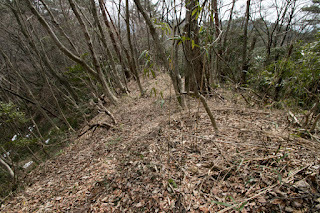 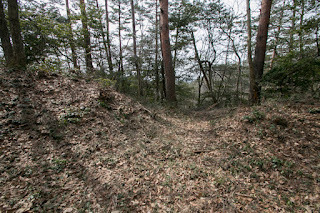 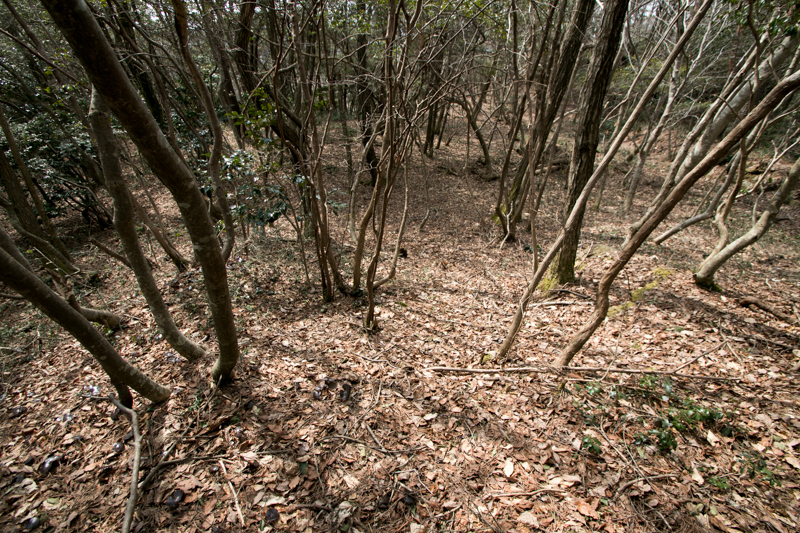 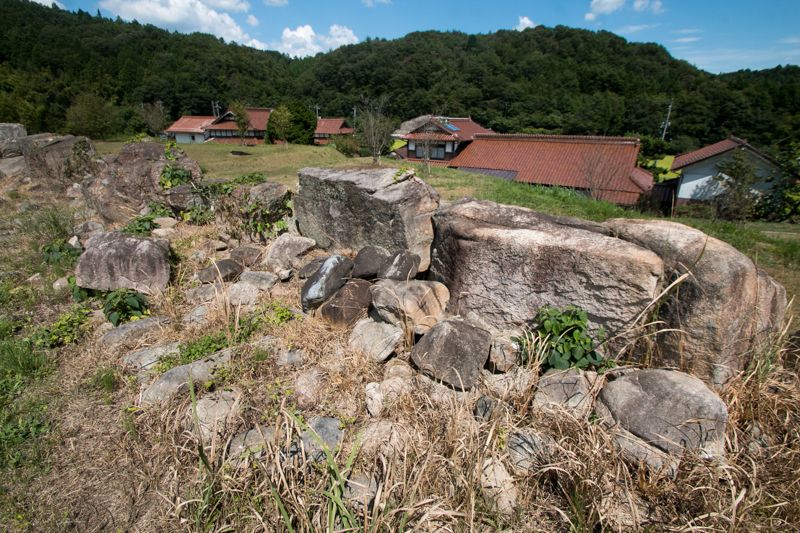 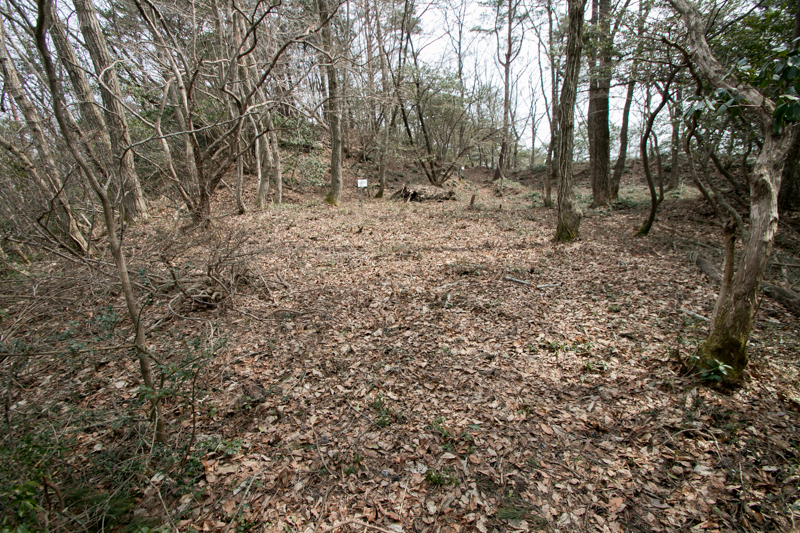 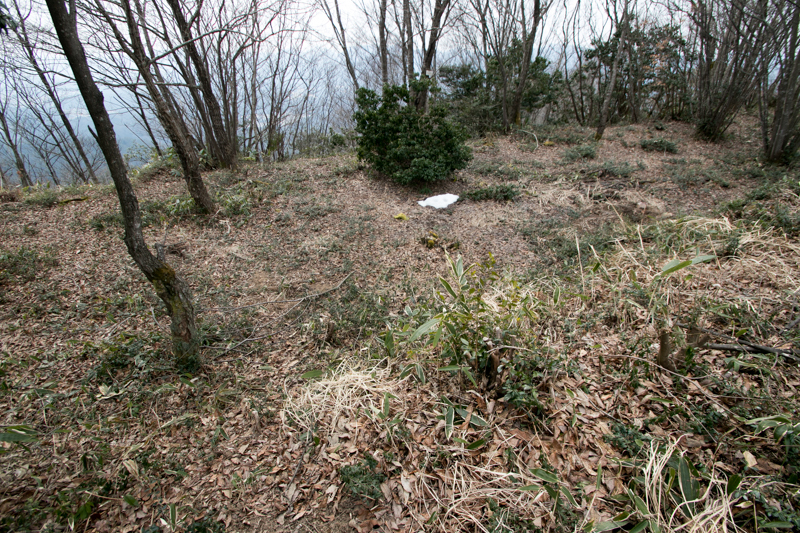 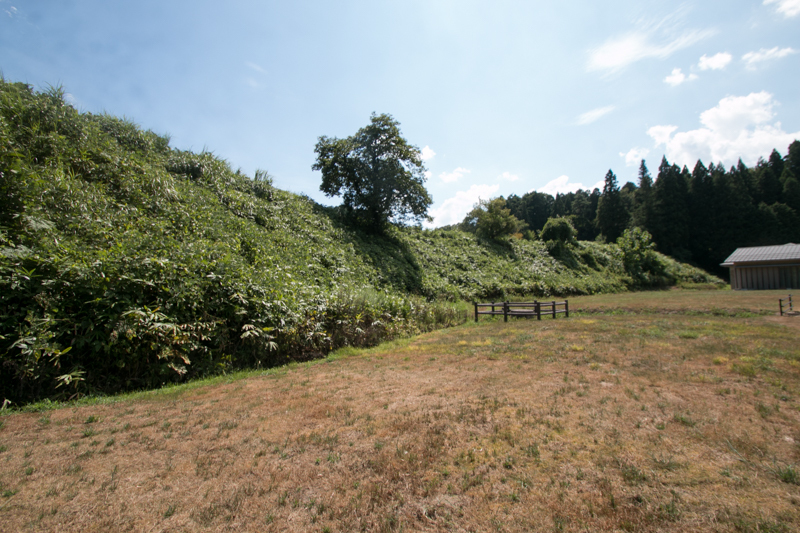 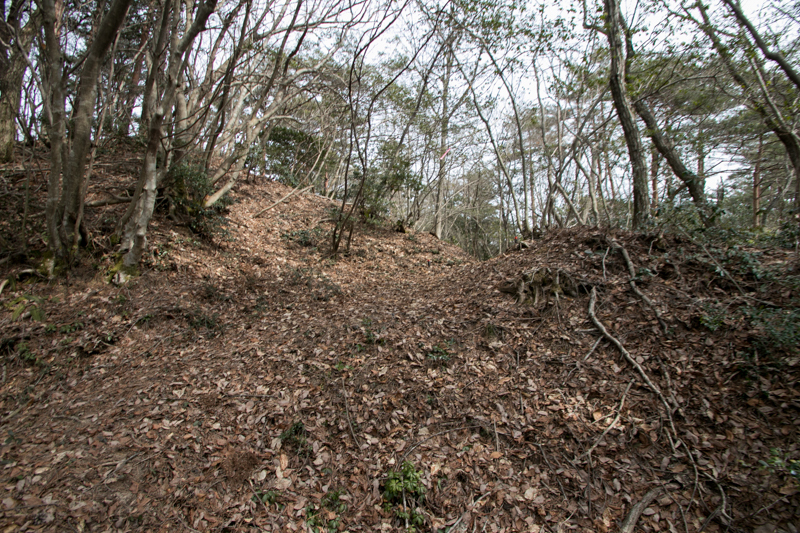 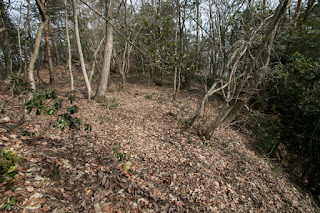 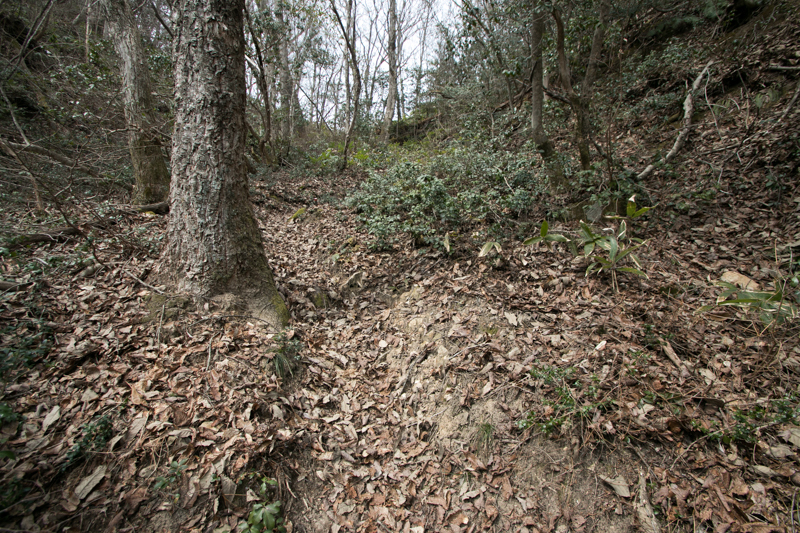 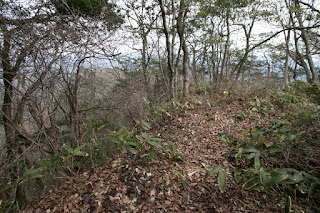 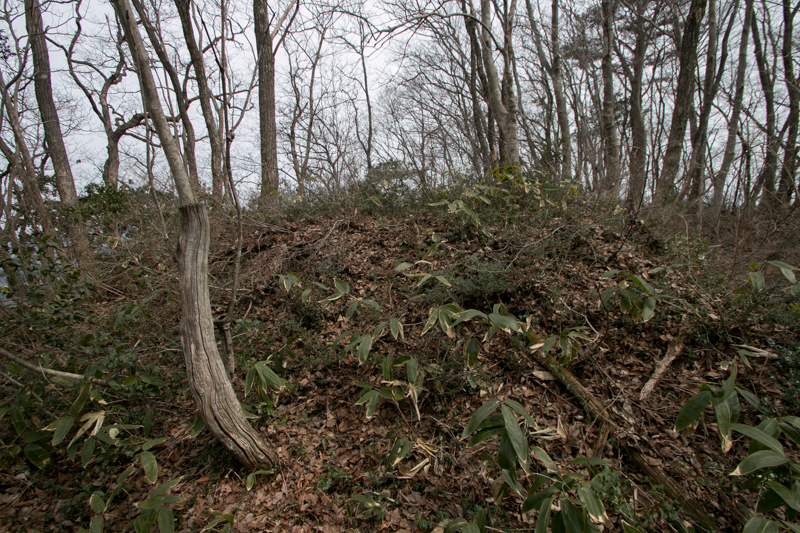 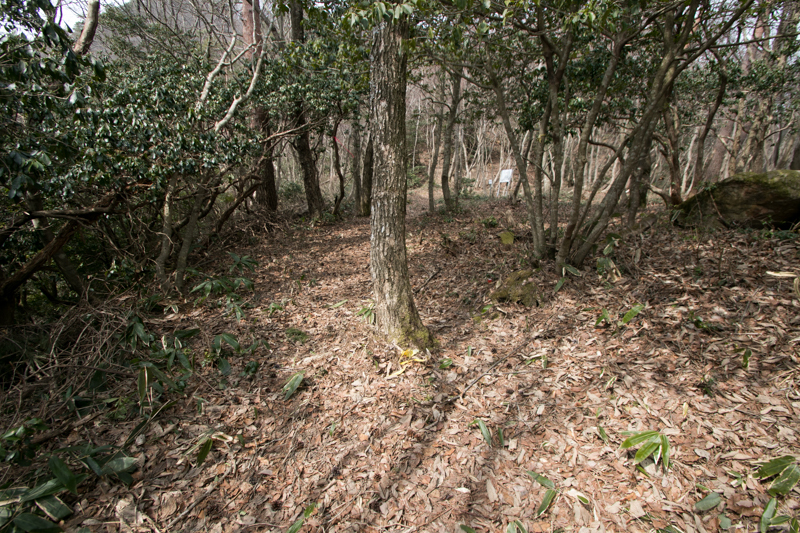 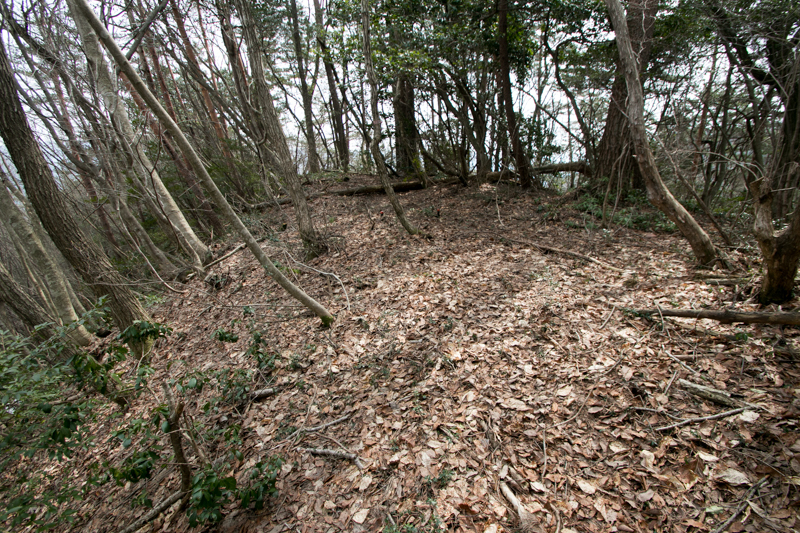 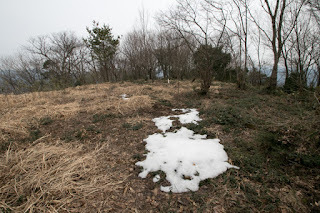 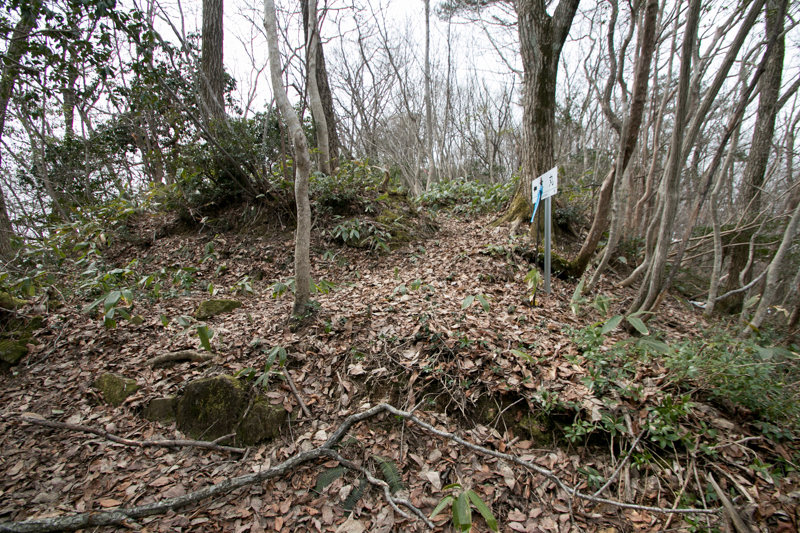 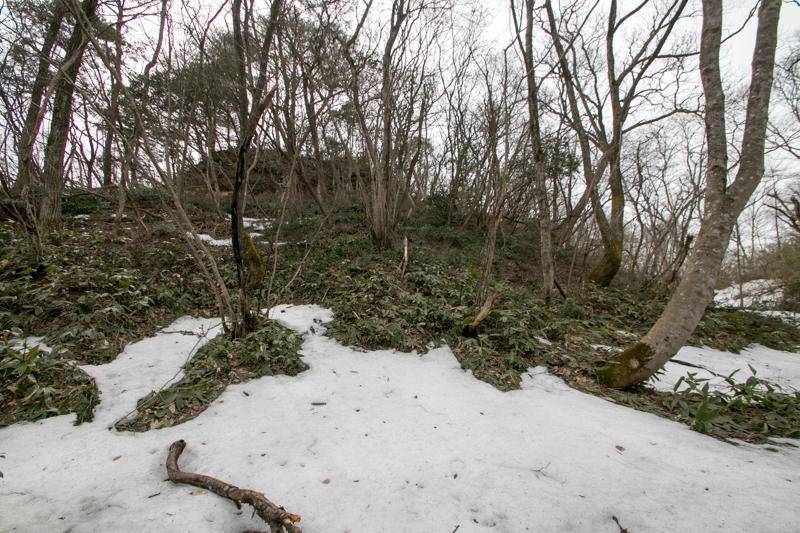 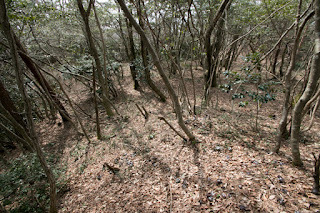 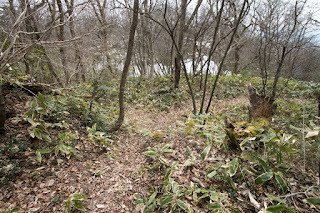 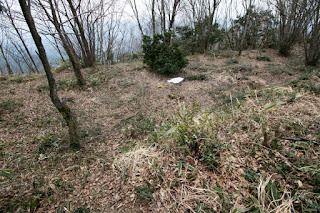 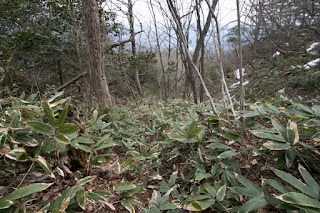 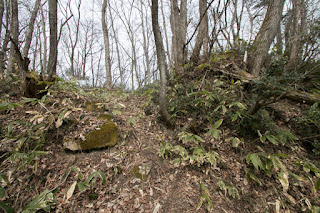 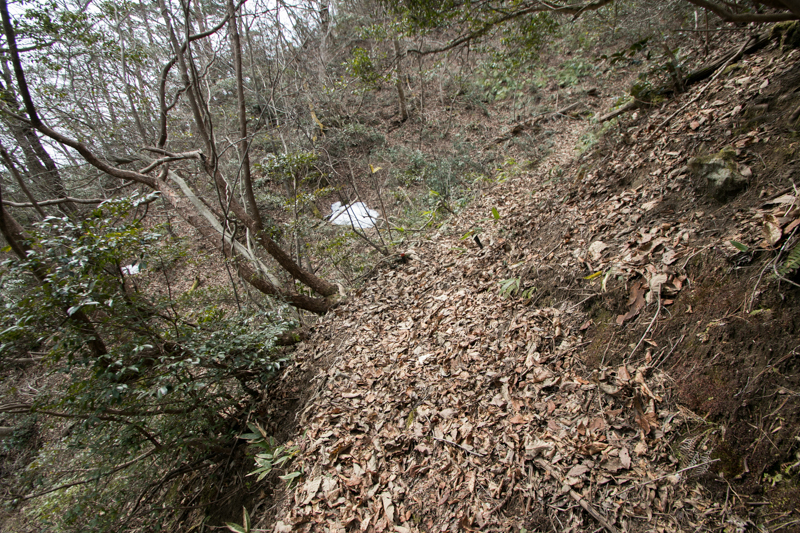 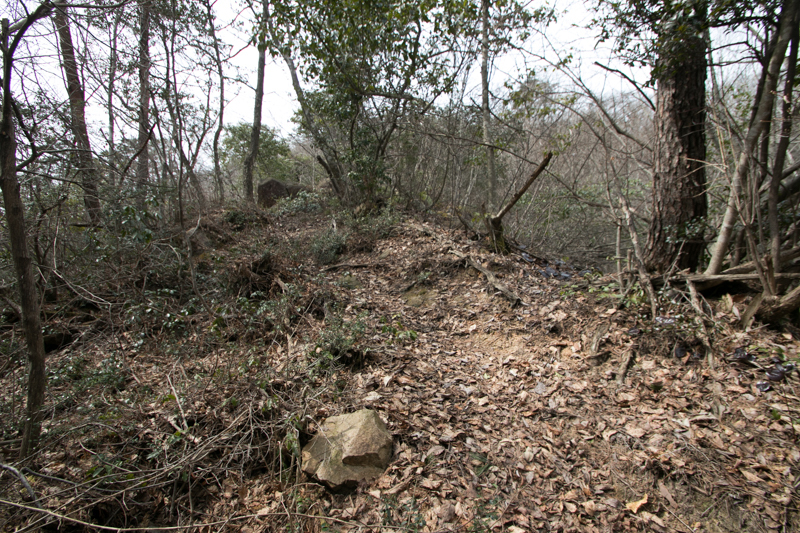 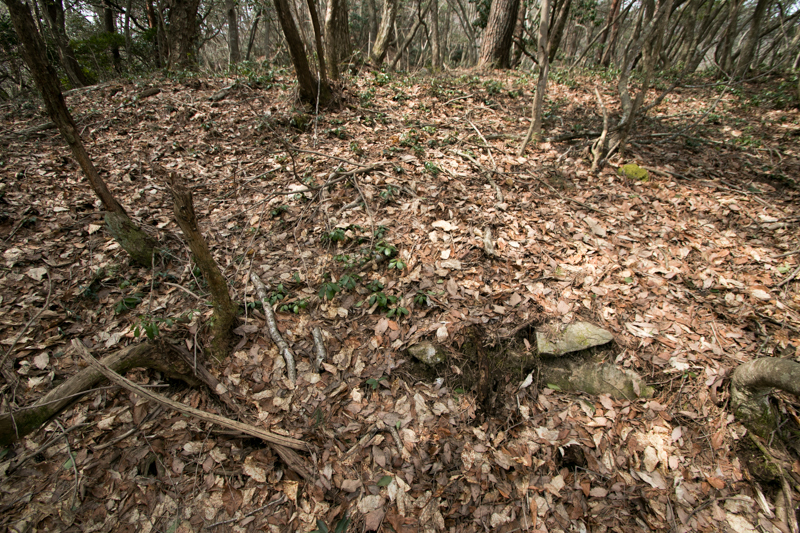 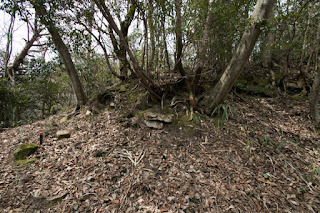 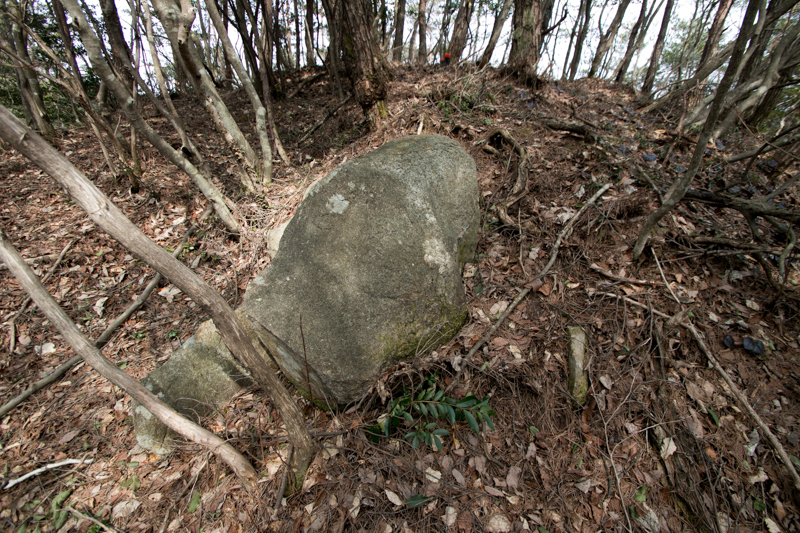 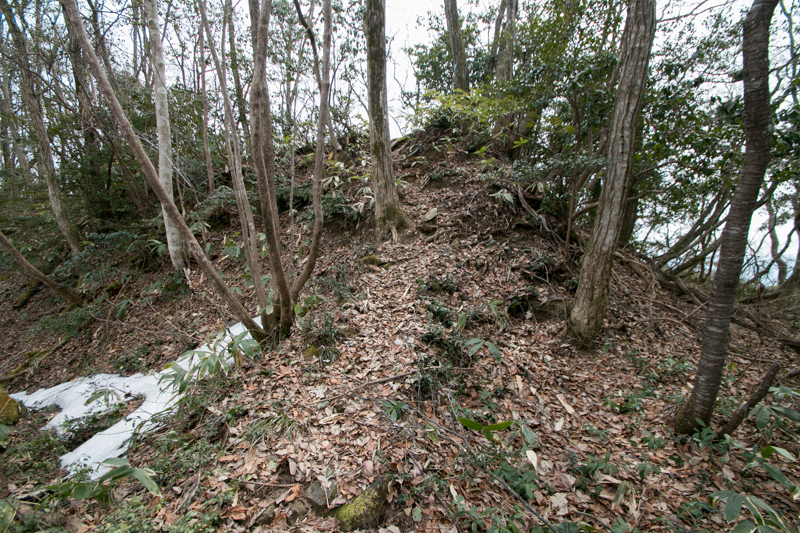 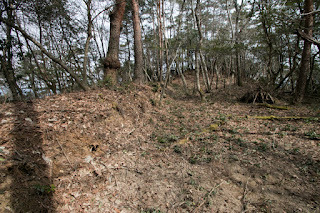 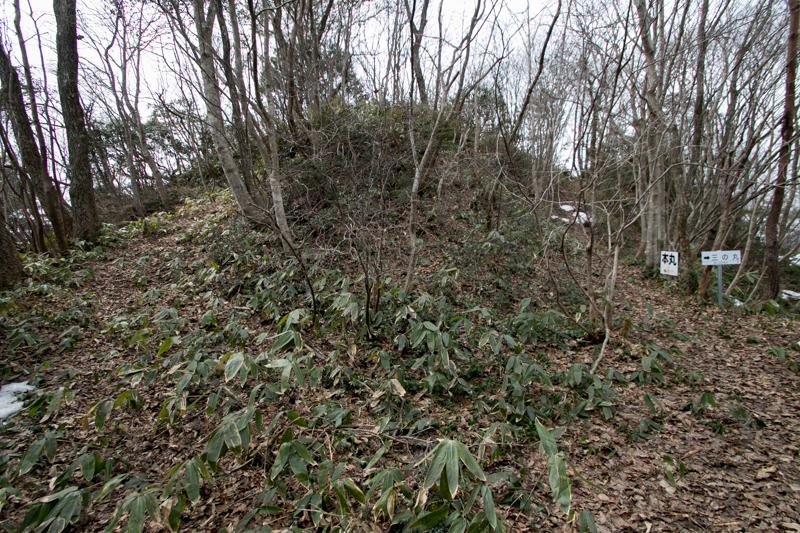 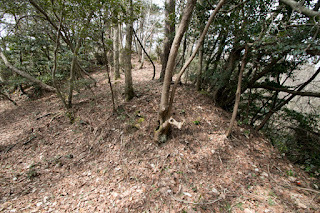 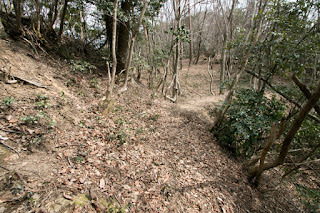 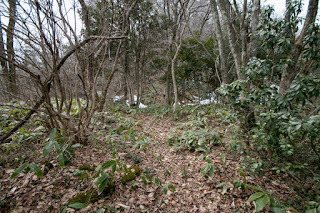 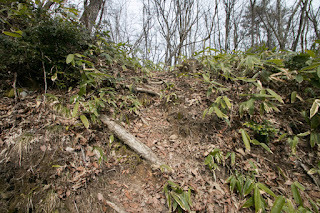 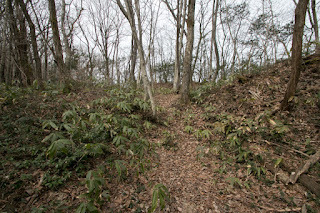 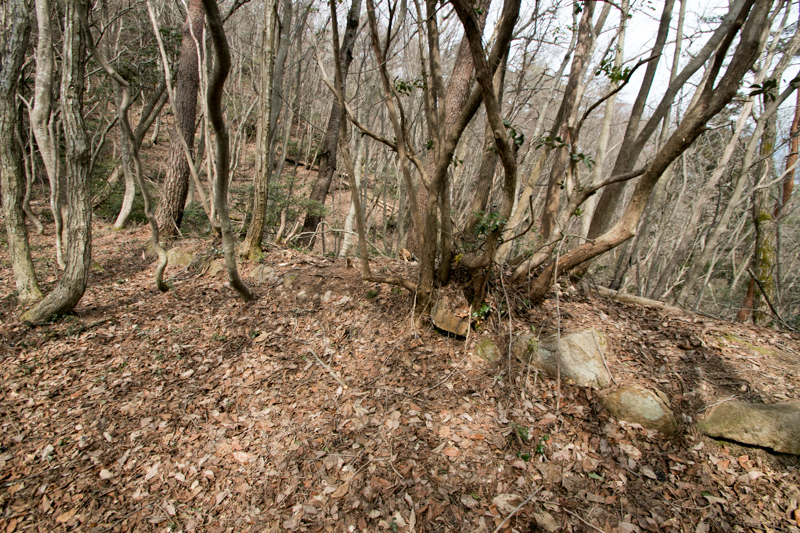 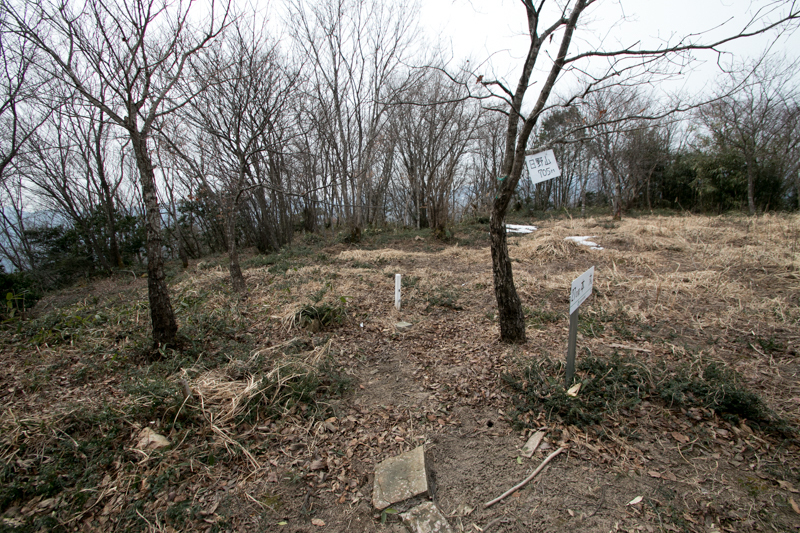 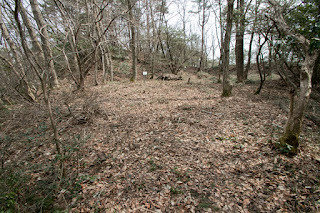 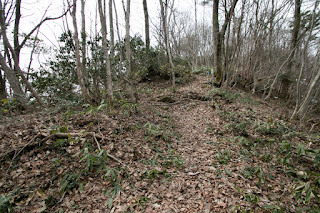 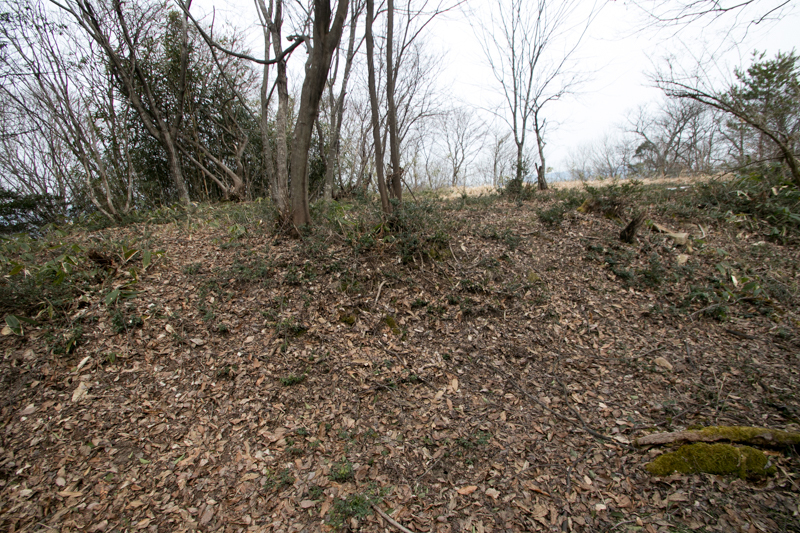 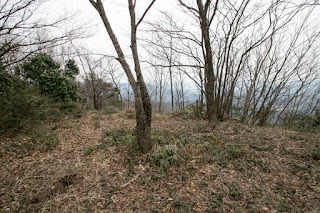 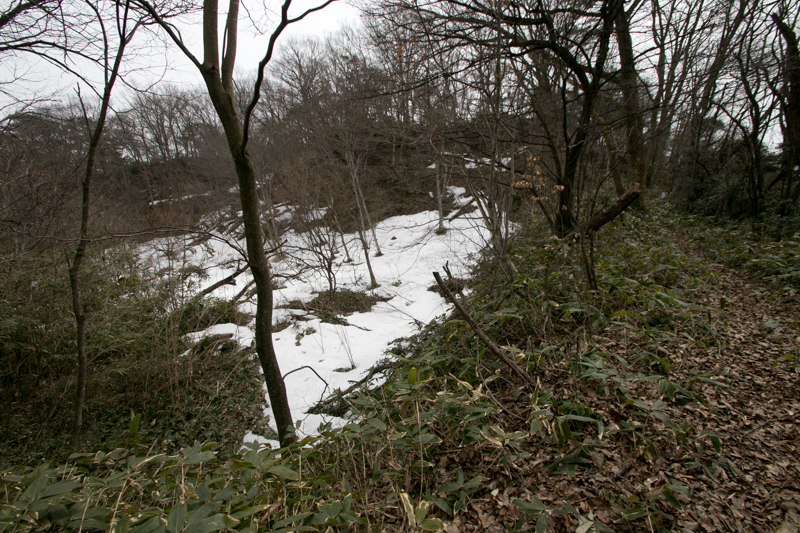 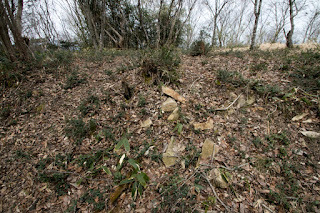 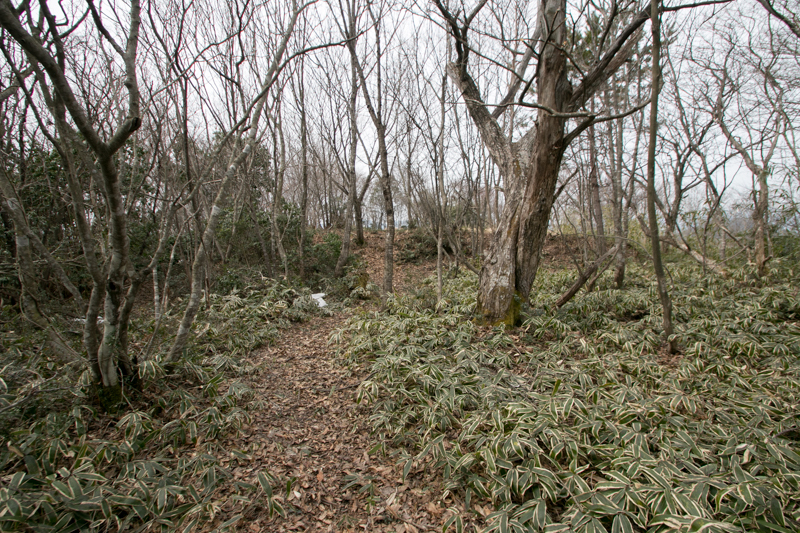 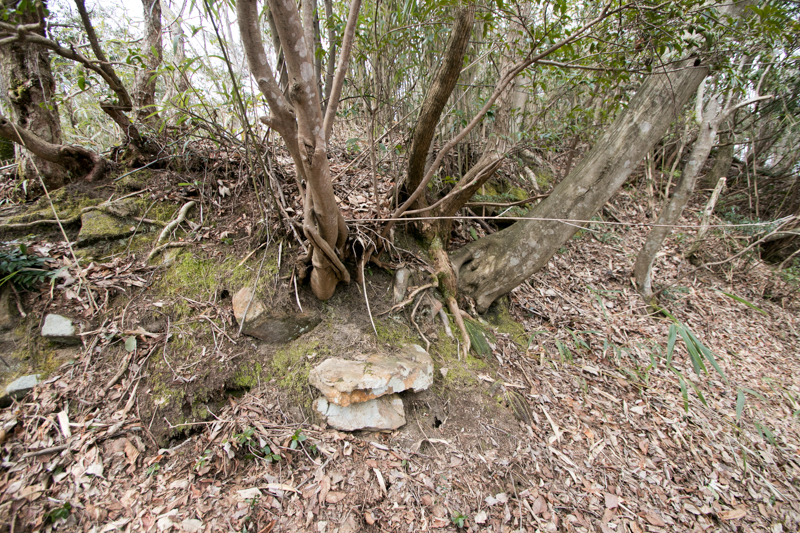 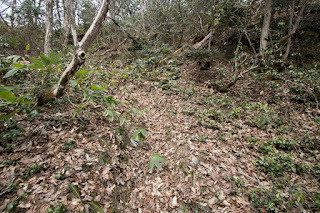 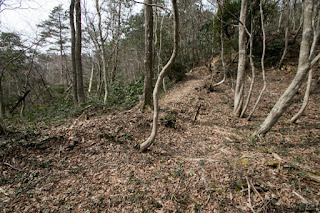 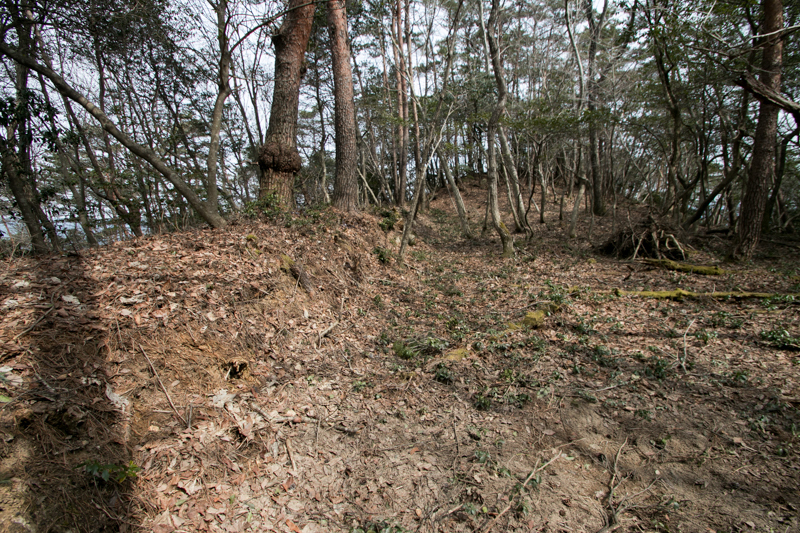 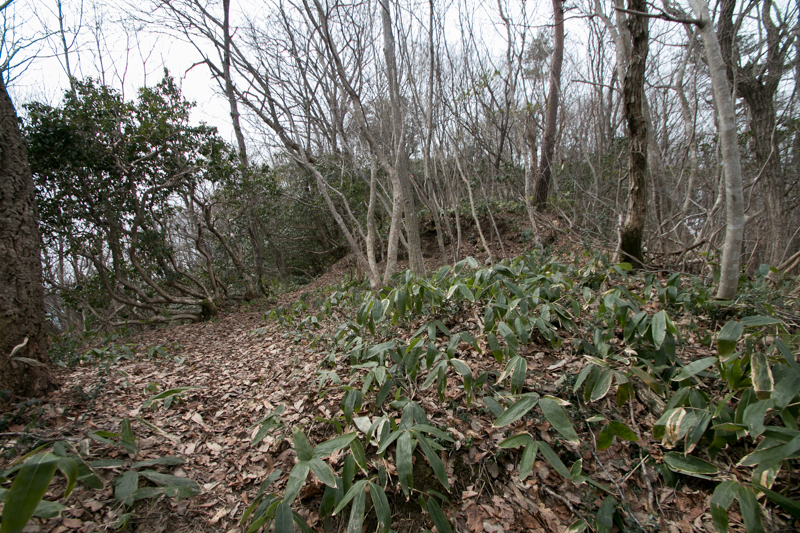 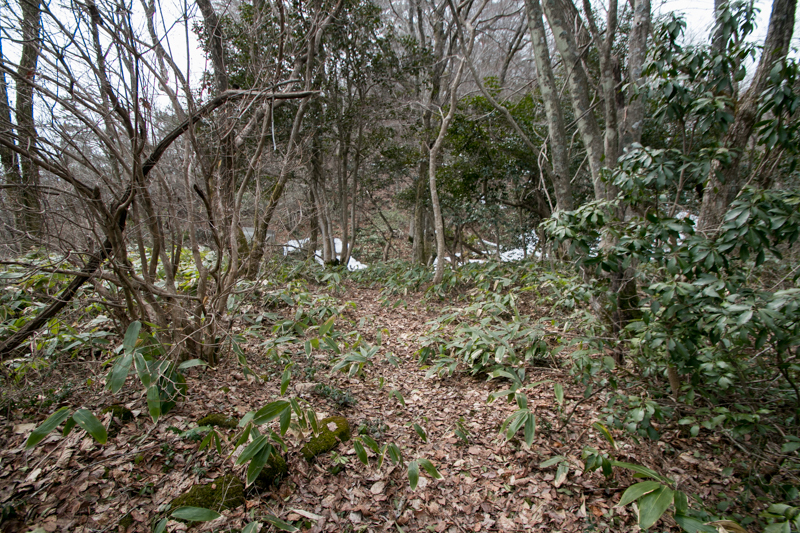 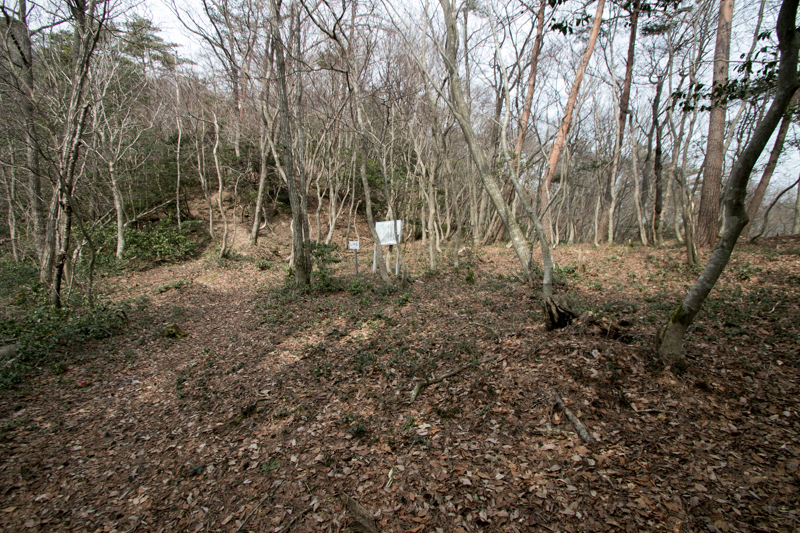 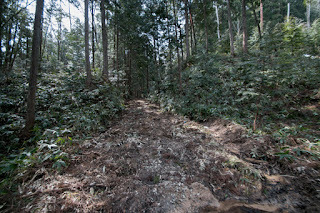 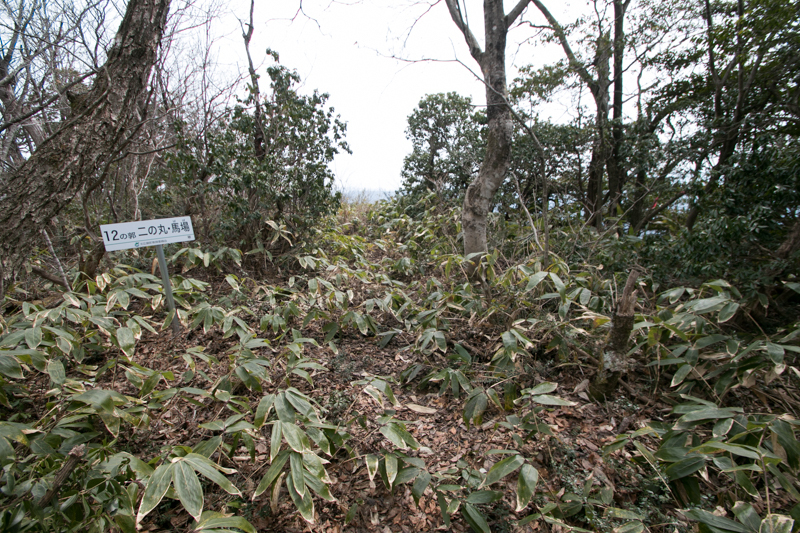 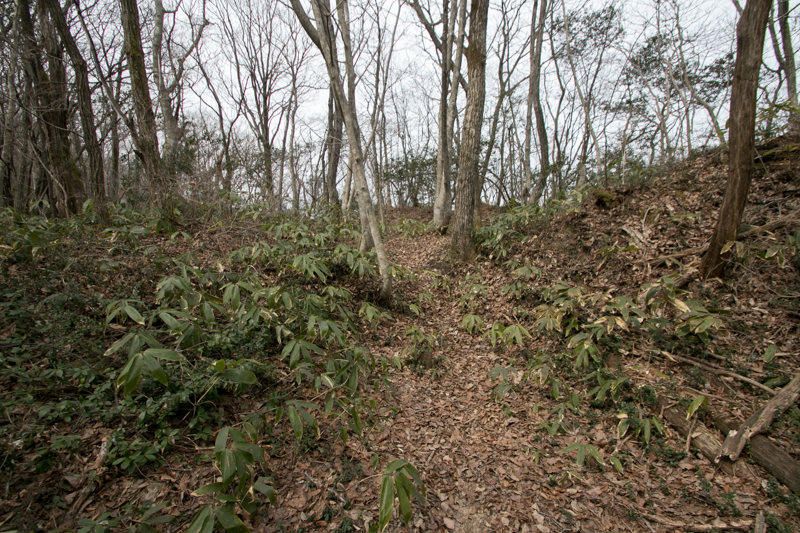 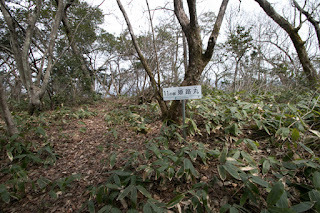 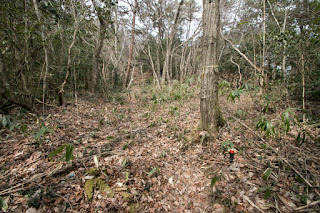 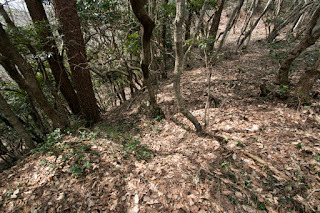 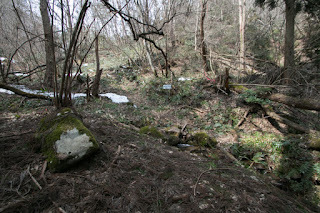 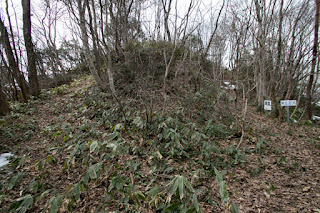 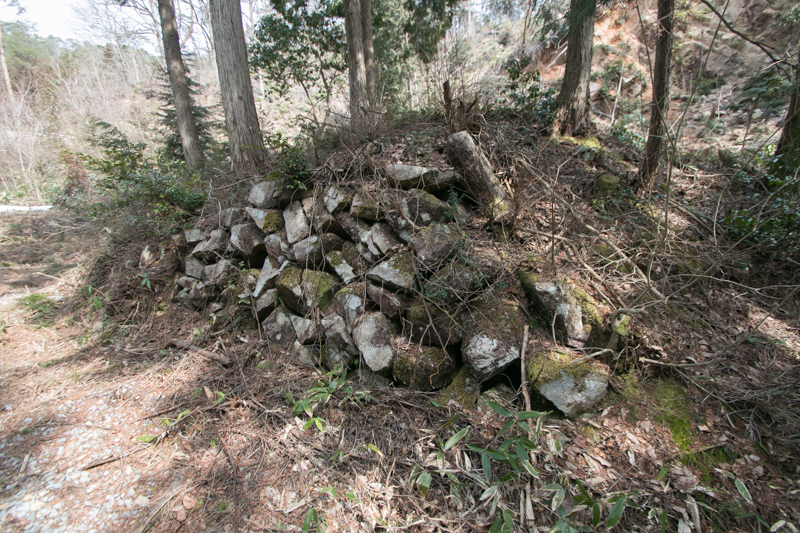 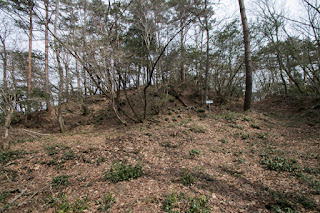 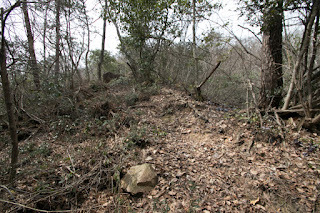 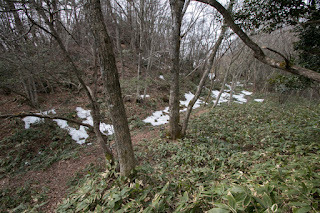 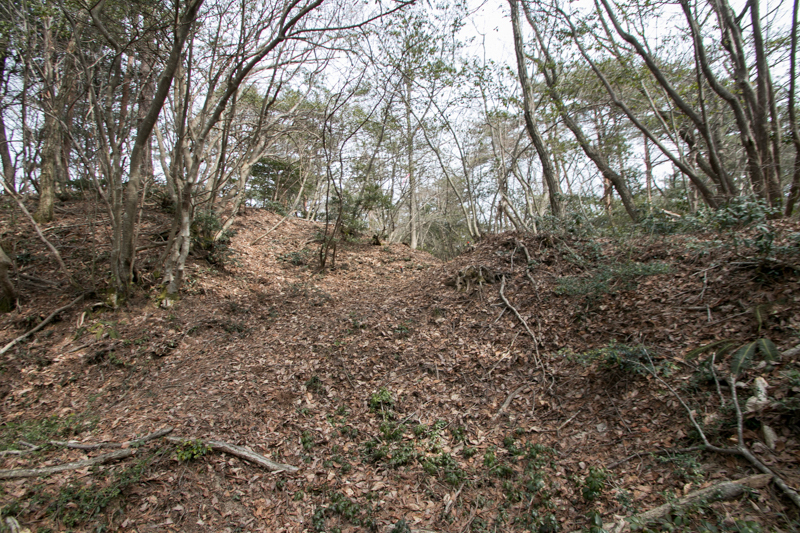 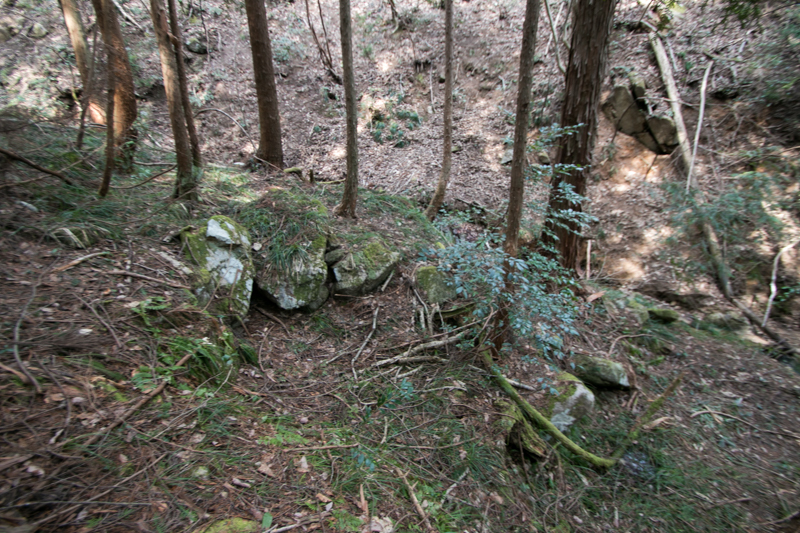 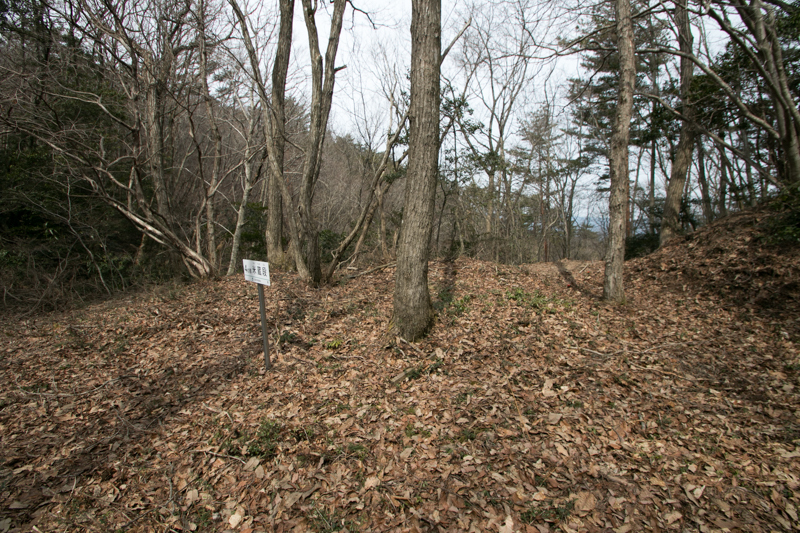 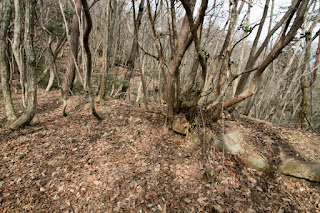 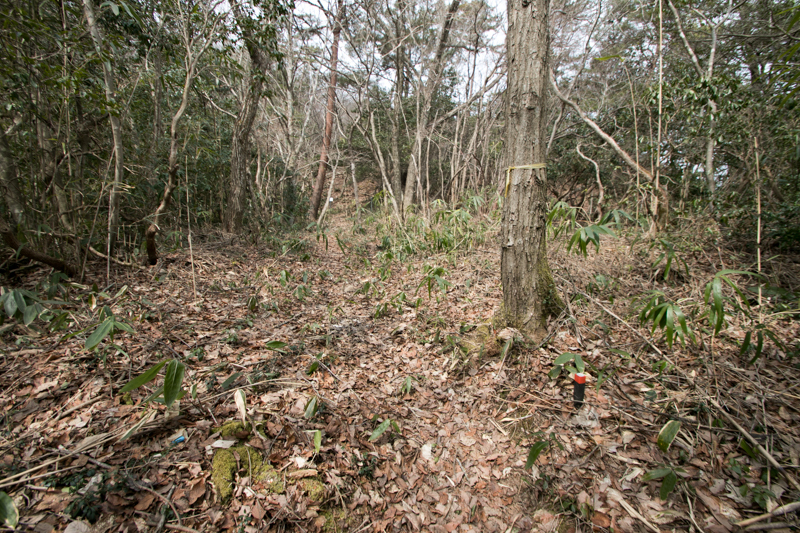 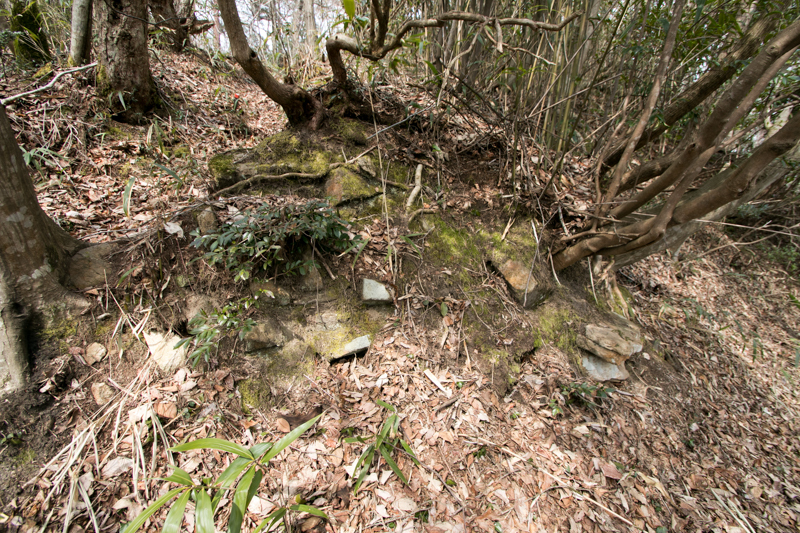 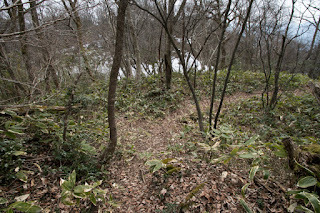 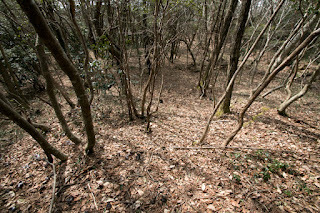 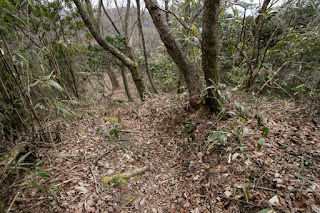 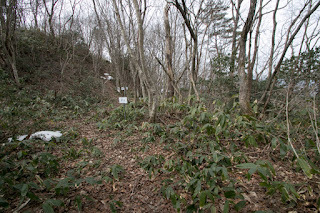 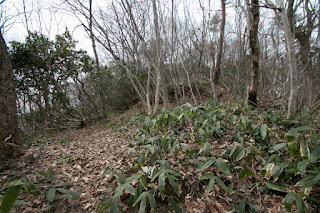 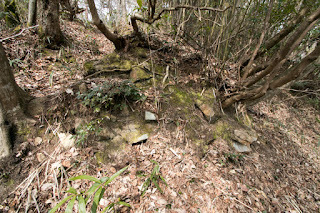 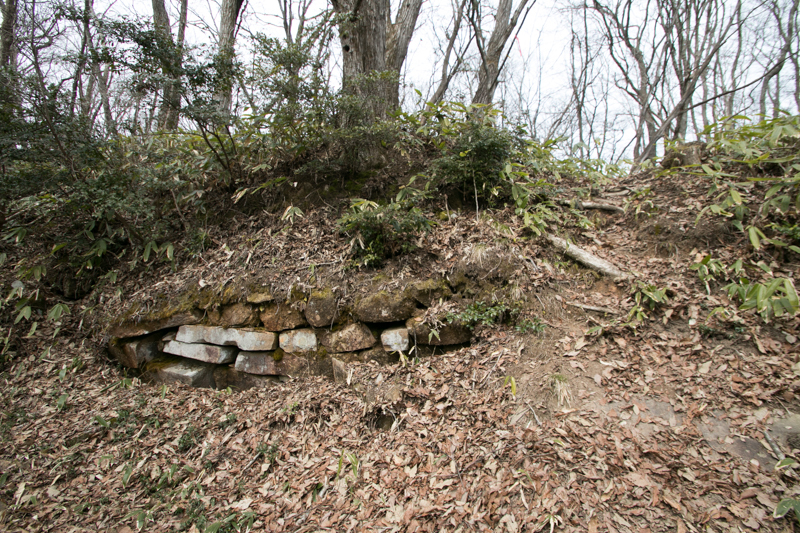 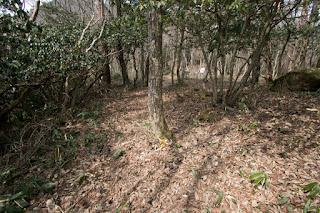 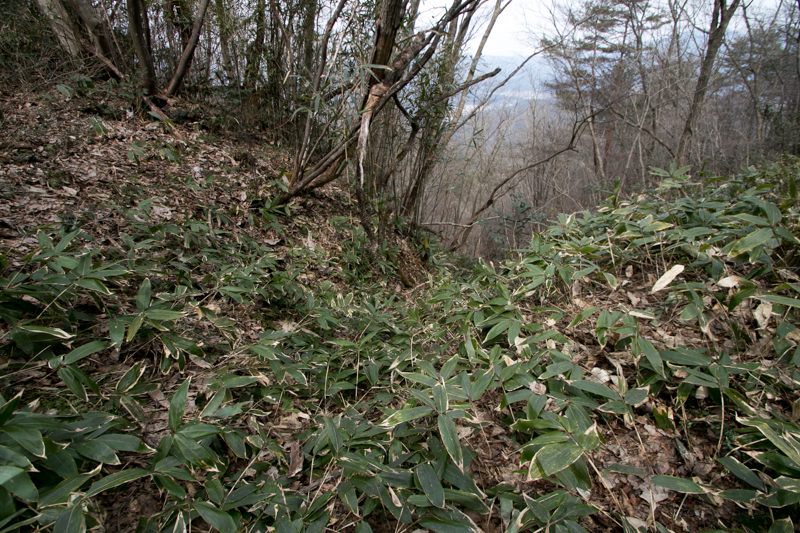 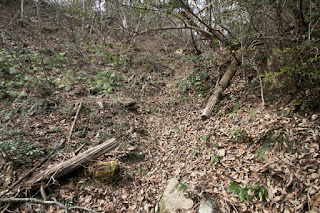 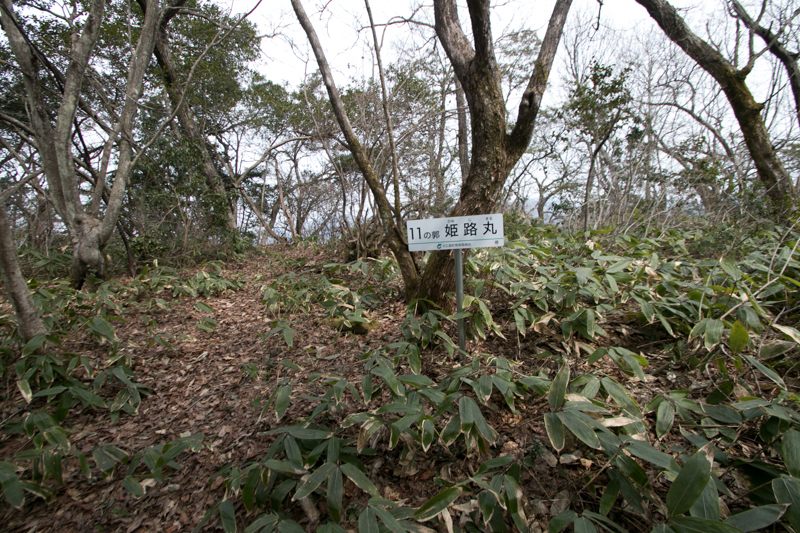 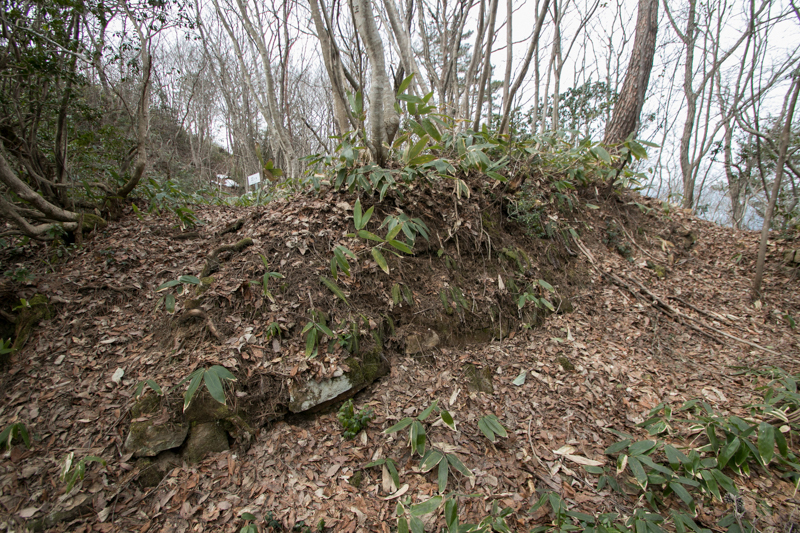 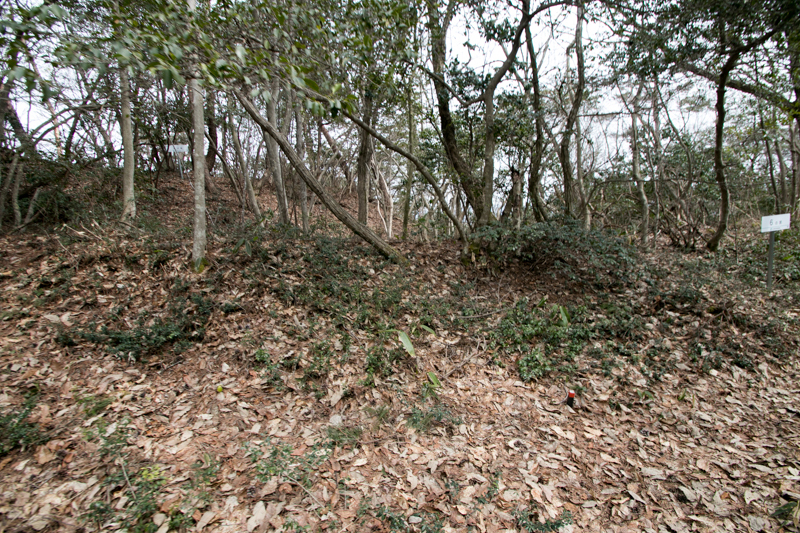 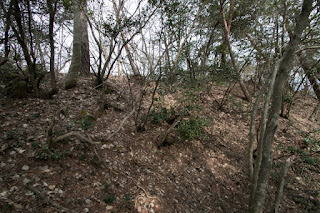 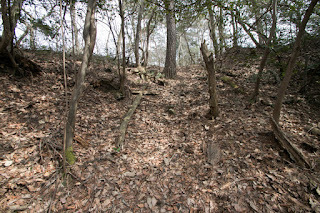 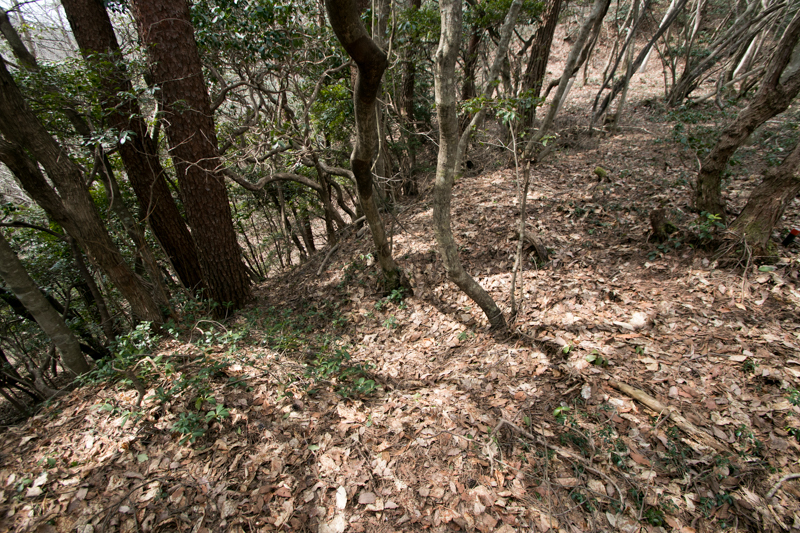 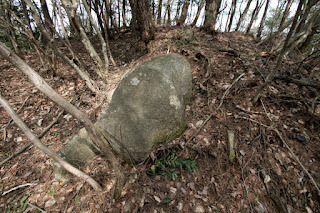 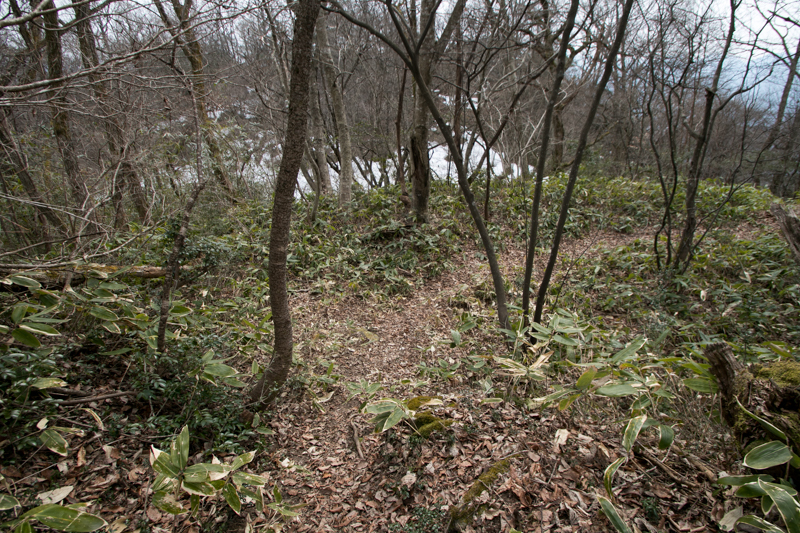 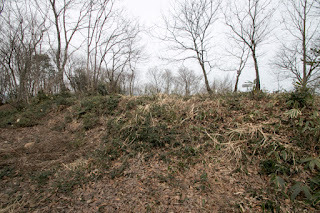 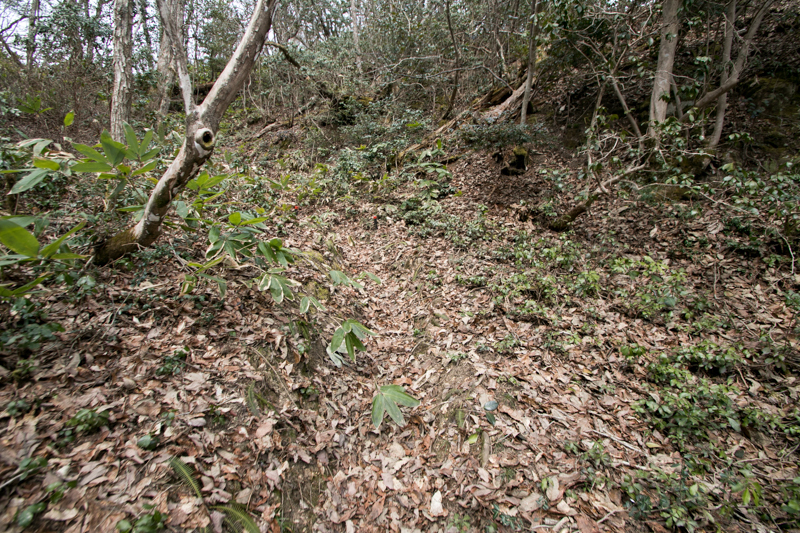 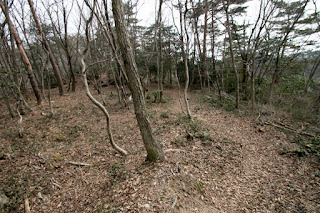 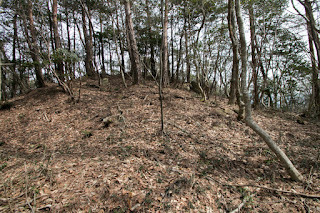 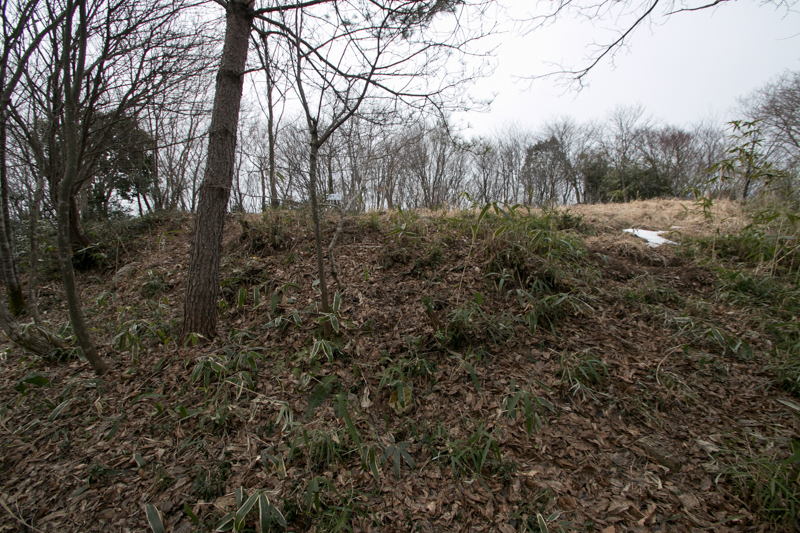 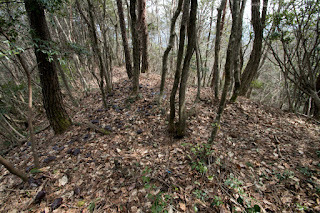 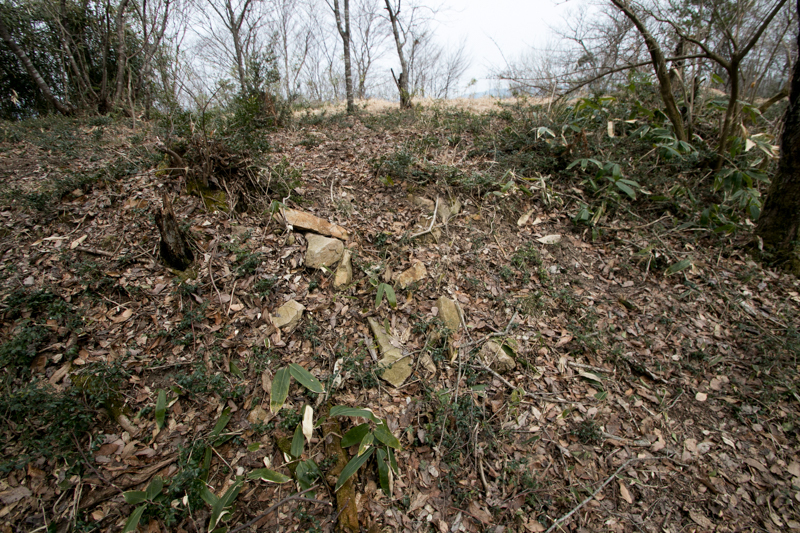 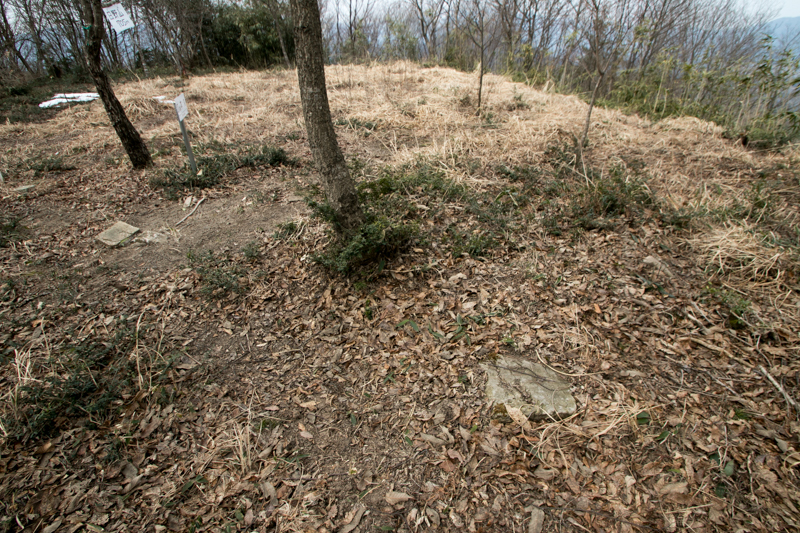 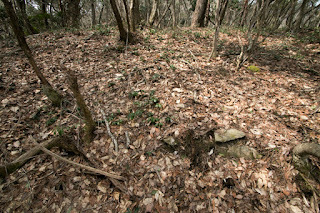 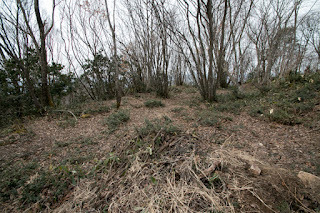 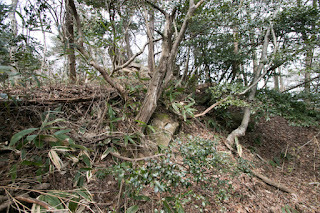 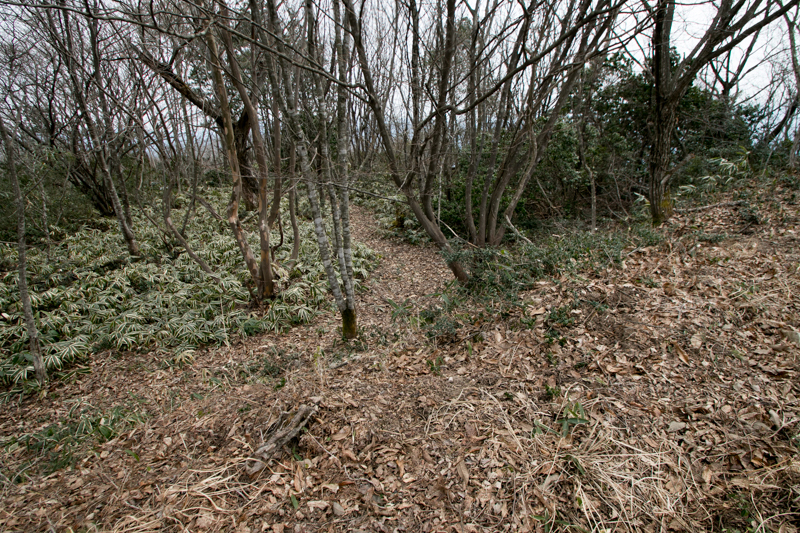 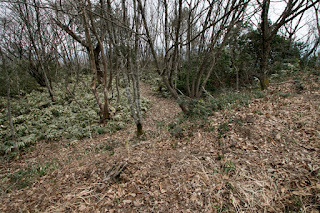 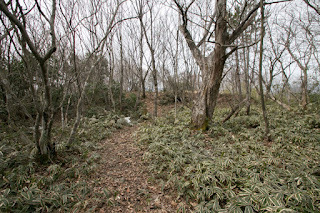 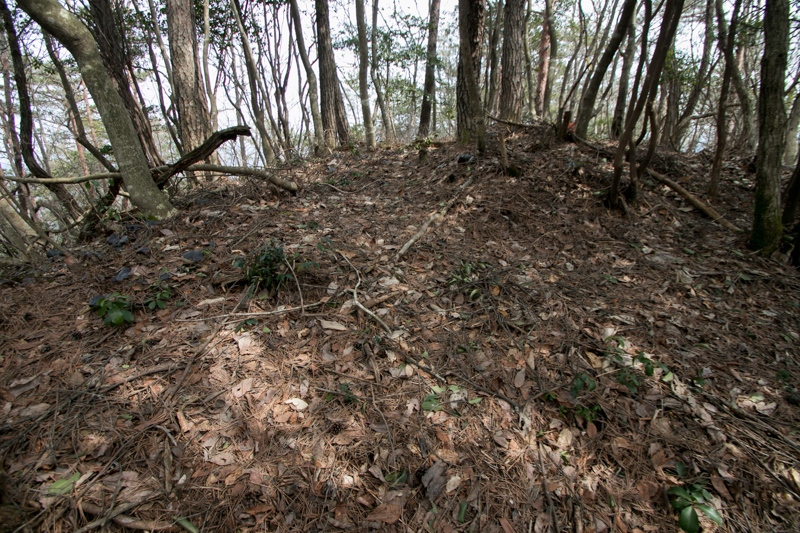 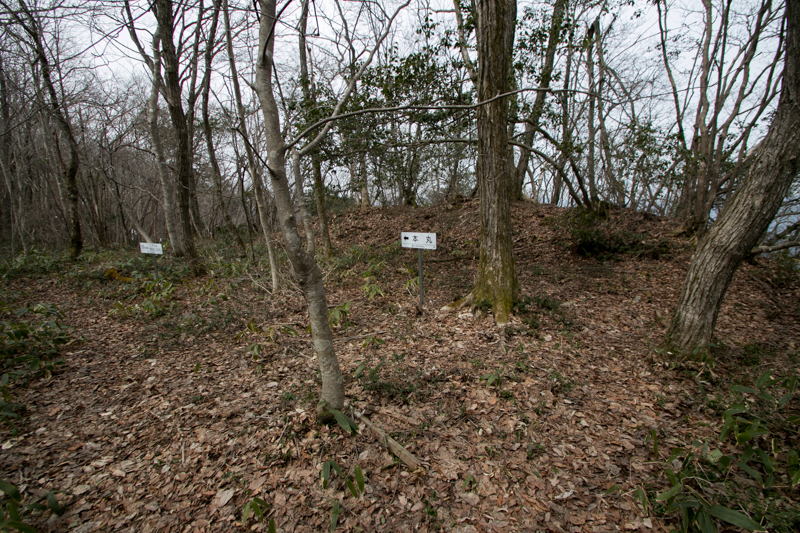 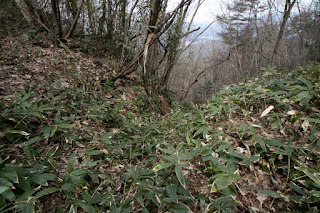 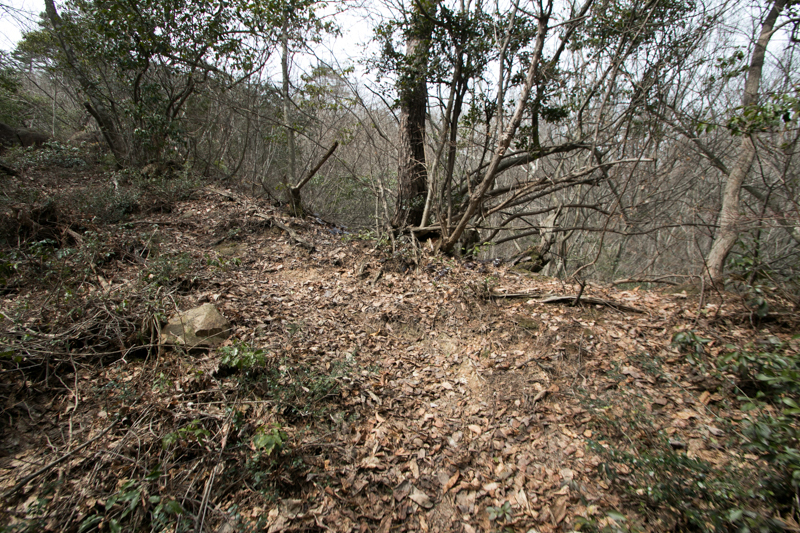 Now all building of Hinoyama castle was lost, and castle ruin is covered by heavy bush. 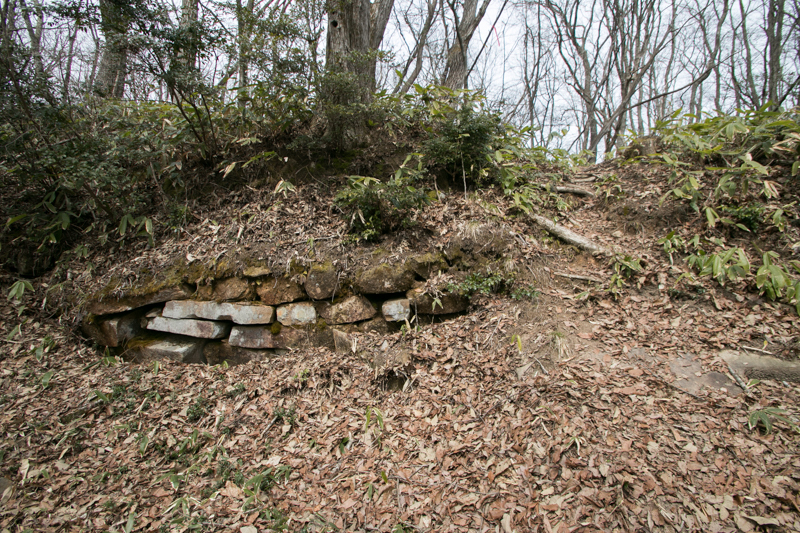 But stone walls partially remain around each gate, and steep clay wall still remains on the mountain. Furthermore, powerful stone wall of retirement place of Motoharu keeps original shape. 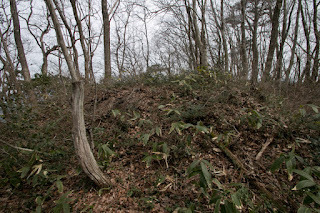 Compared with Niitakayama castle, the main base of Takakage, Hinoyama castle seems not so sophisticated but more strong and secure. 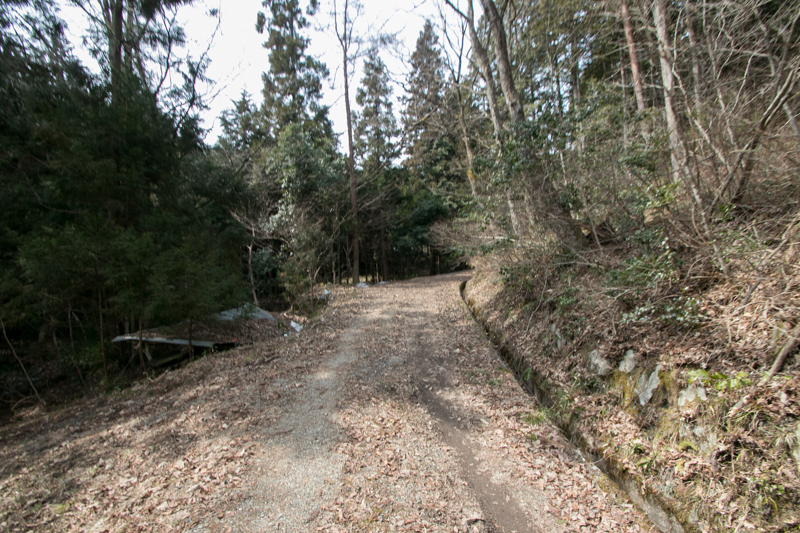 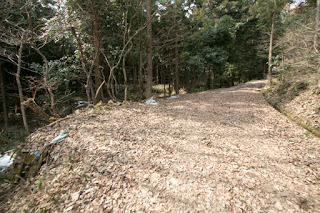 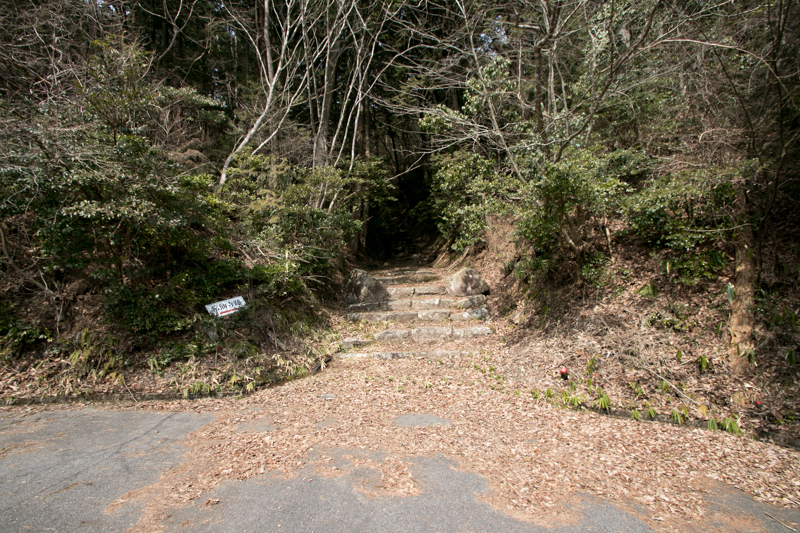 It is not so tough to reach from hillside to the outer entrance of the castle, but is hard to climb up the road from outer entrance to central area. 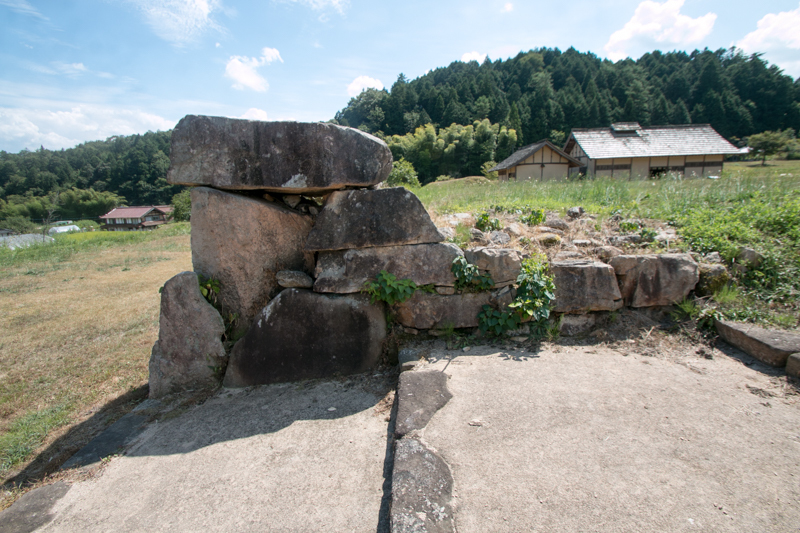 This shape of castle quite resembles to the image of Motoharu, who was proud and brave general served as an military pillar of Mouri clan and broke many strong enemies. 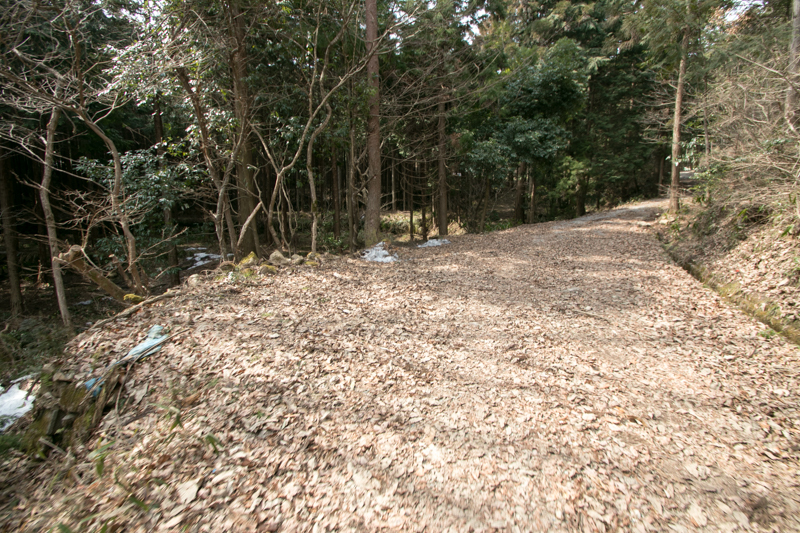 15 minutes drive from Hamada Jidoshado Expressway Oasa interchange. 40 minutes from hillside parking to hilltop castle.